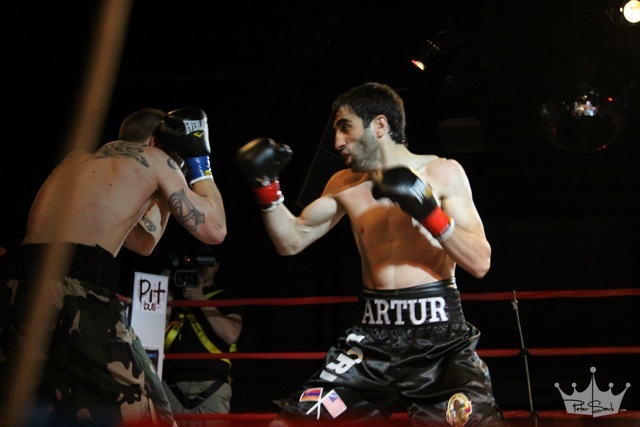 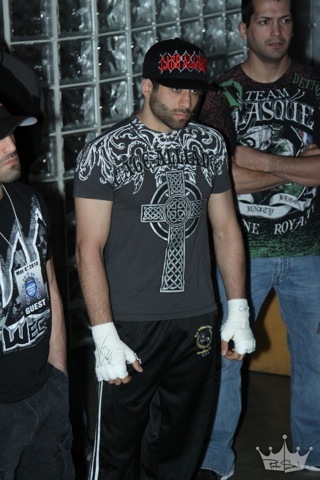 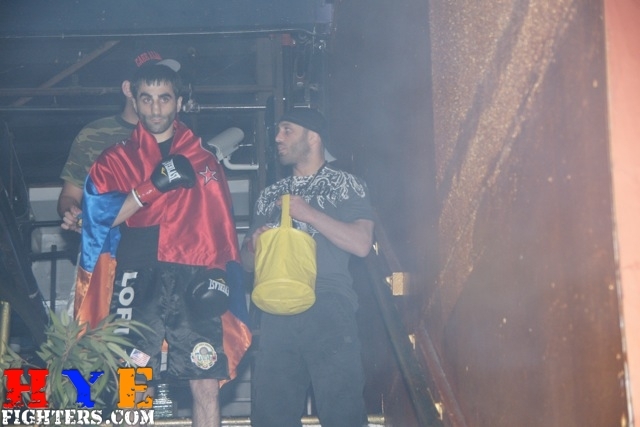 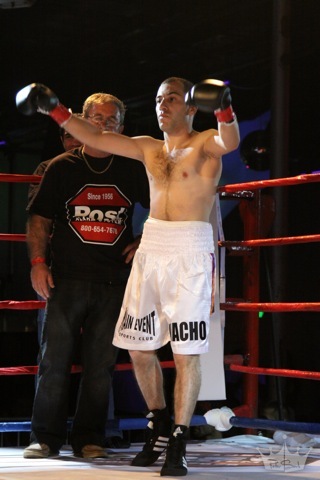 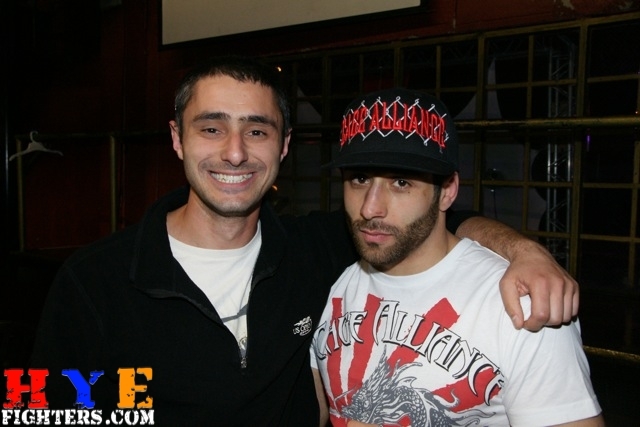 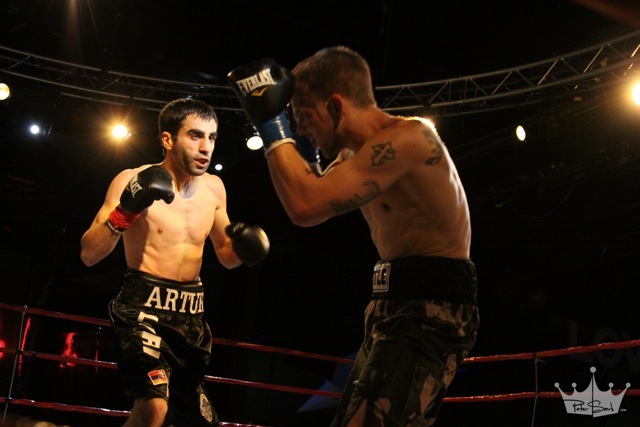 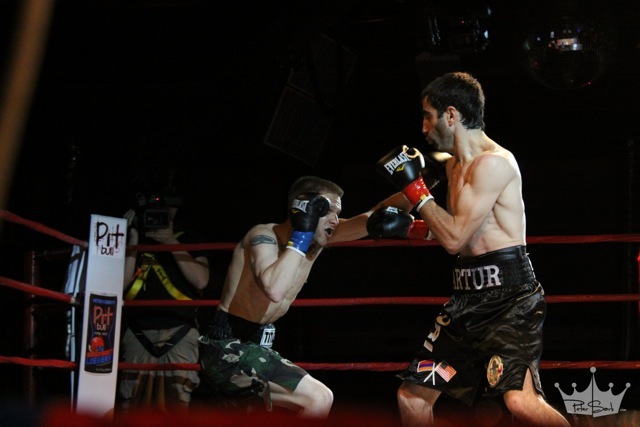 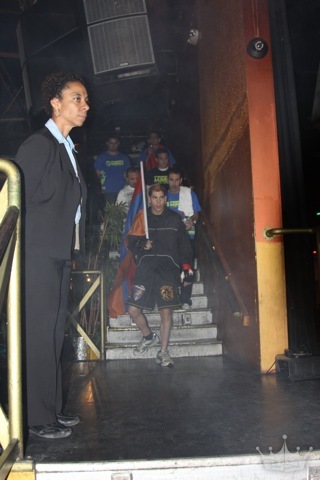 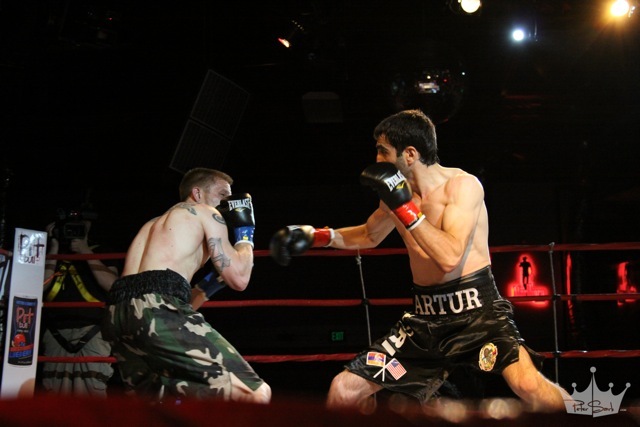 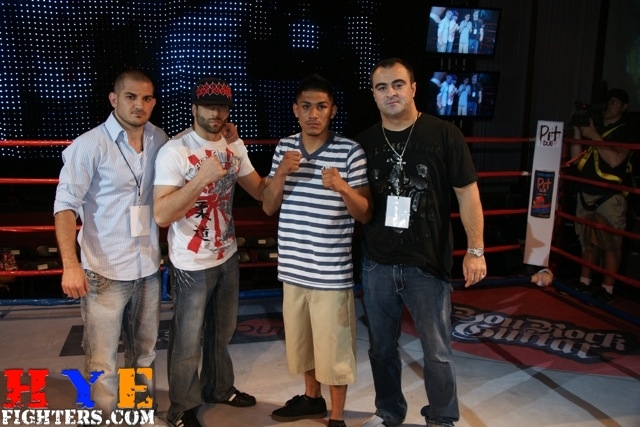 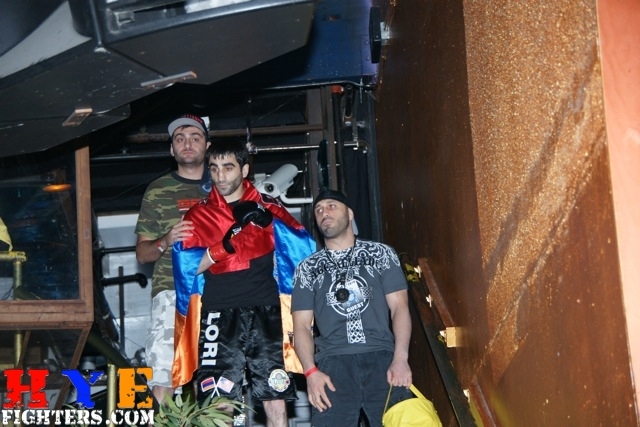 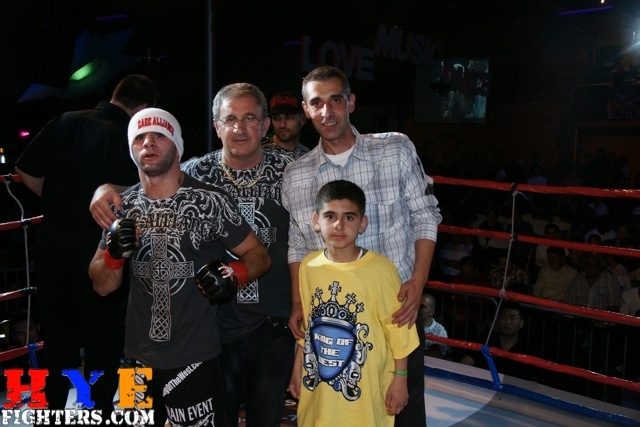 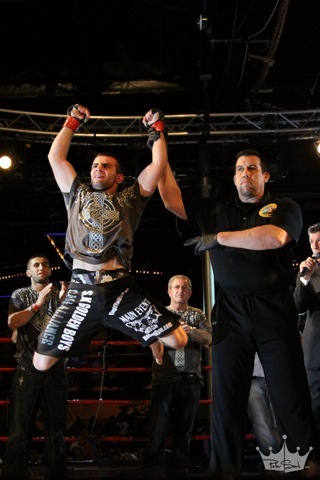 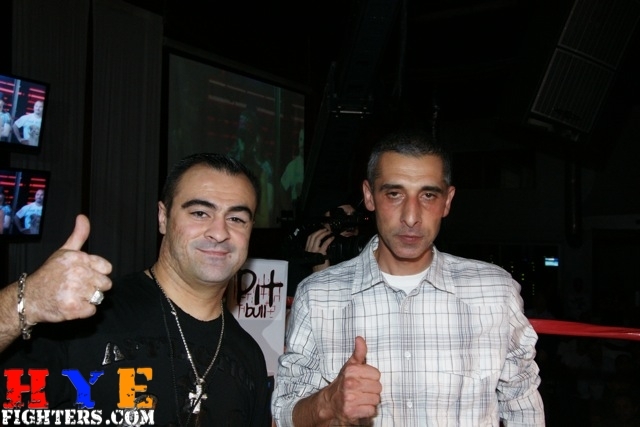 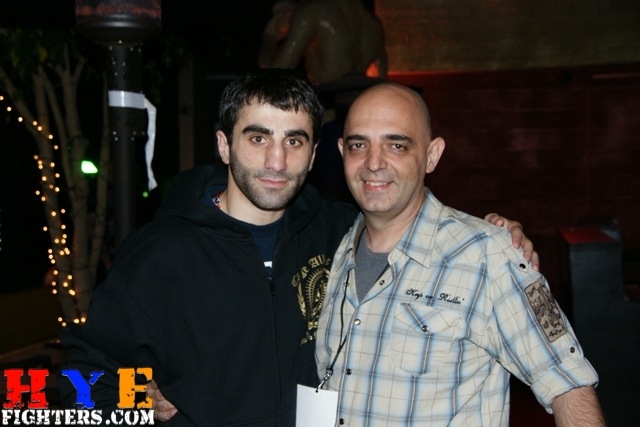 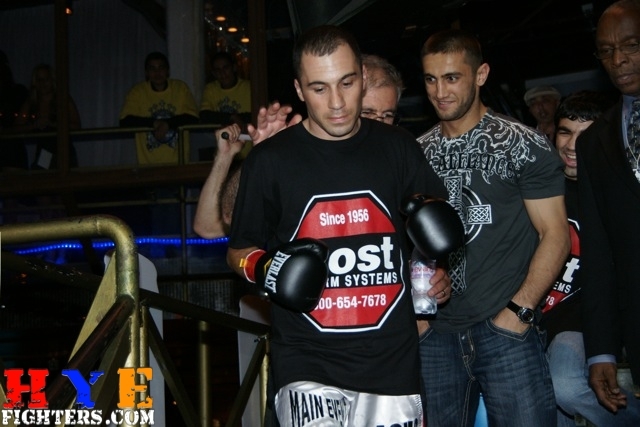 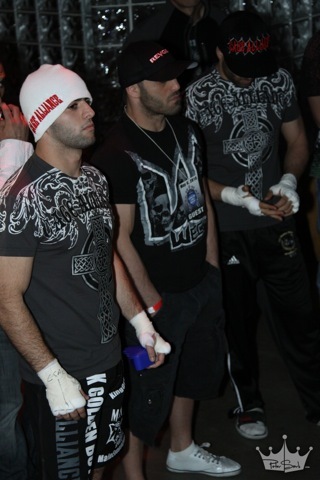 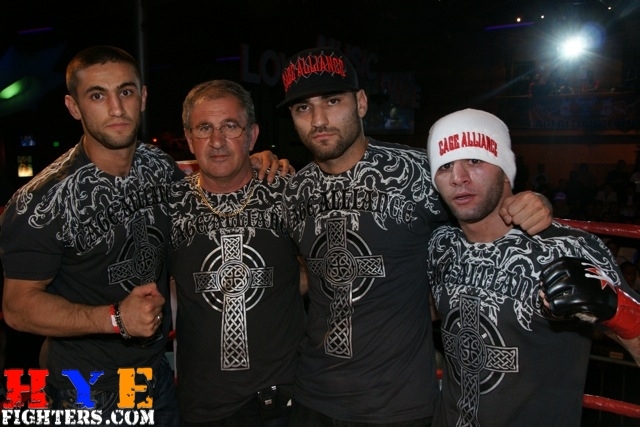 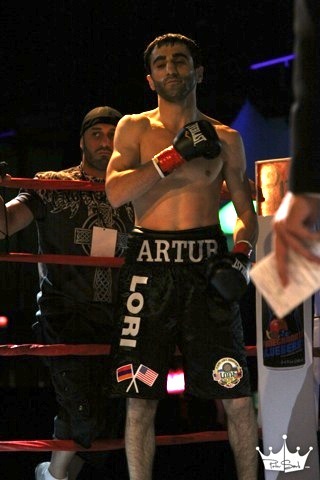 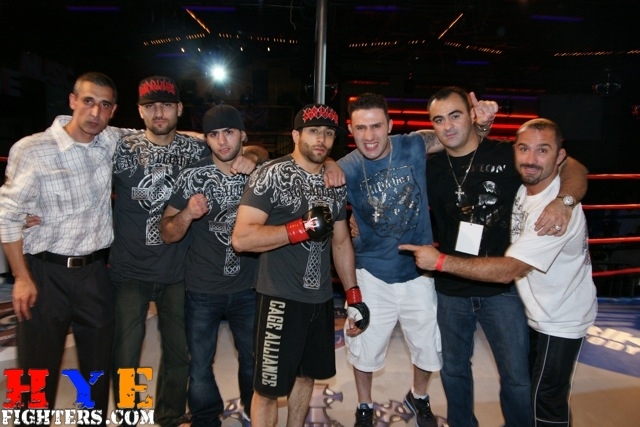 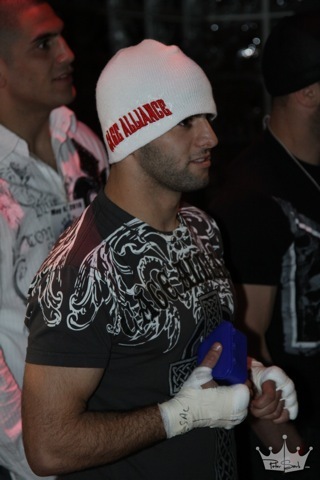 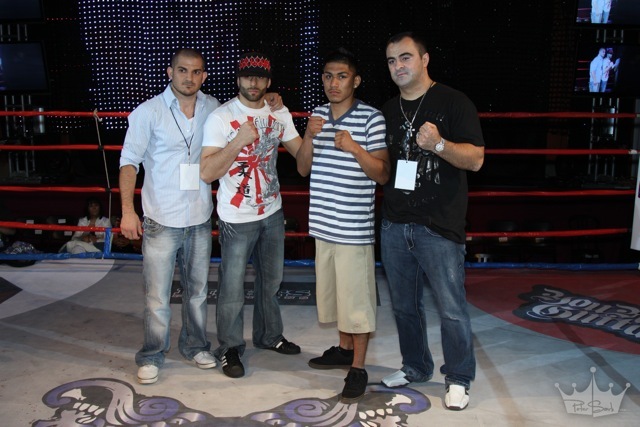 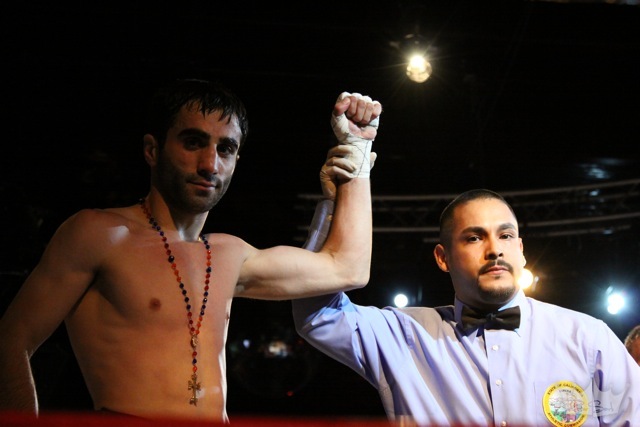 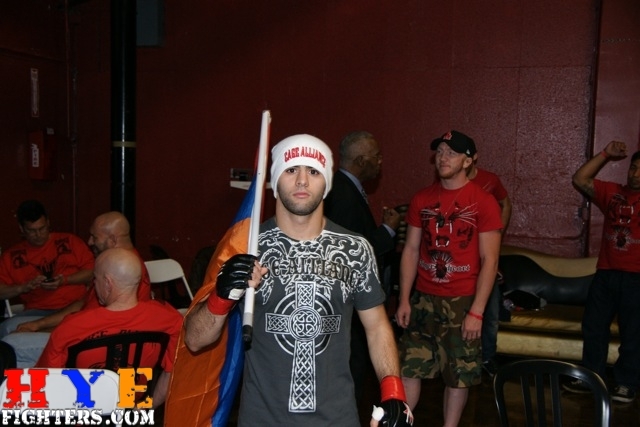 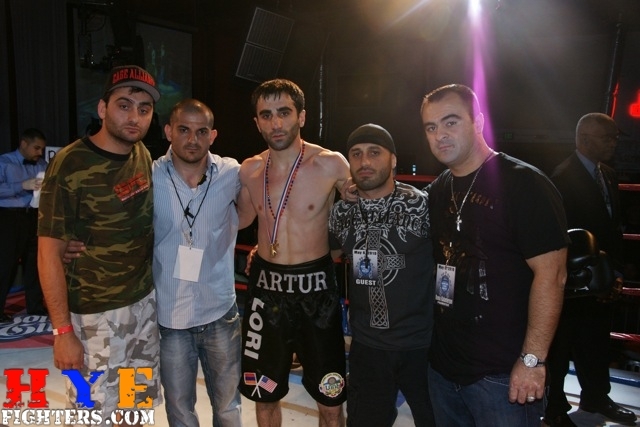 Bernetsyan, three others grab victory at Thursday’s King of West card; Avagyan falls in fight of the night. 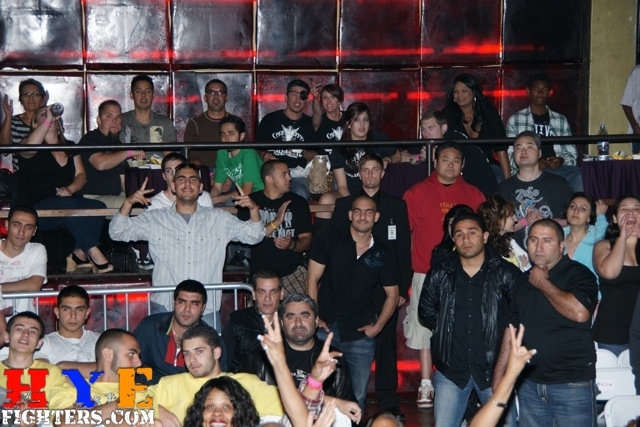 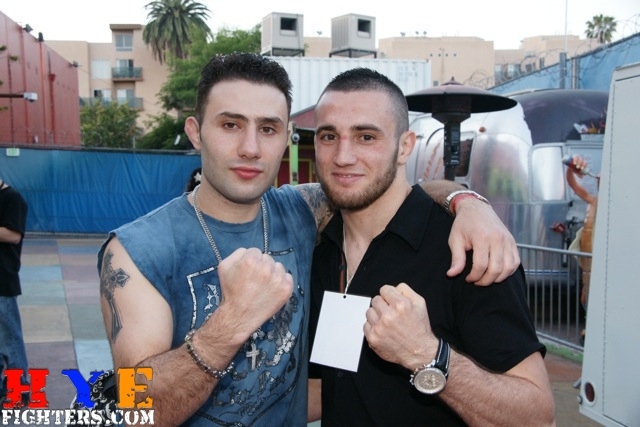 HOLLYWOOD, MAY 6, 2010 — Taking the latest step in what’s quickly becoming a promising career, Glendale boxer Artur Bernetsyan remained undefeated with a dominant knockout win late Thursday night as one of four fighters with local ties claiming victory at King of the West Promotions’ debut event, Rage Against the Ropes, at the Circus Disco in Hollywood. 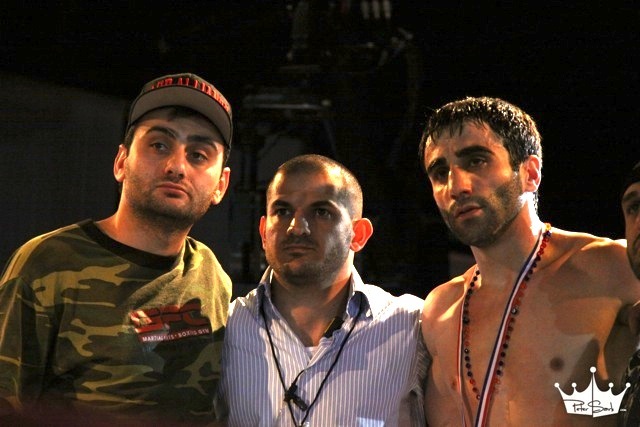 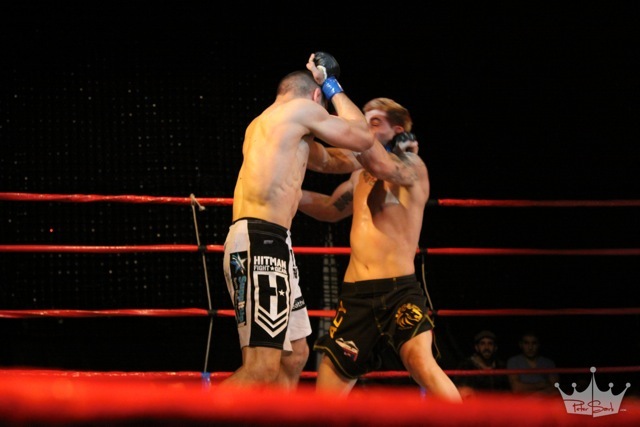 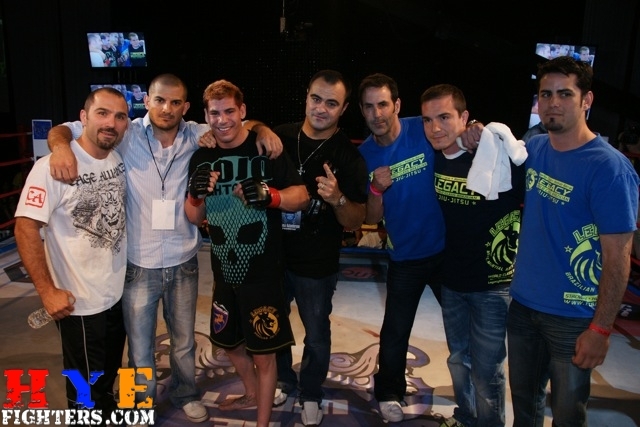 Bernetsyan continued his ascent with a second-round knockout of Nick Brannie, while the Glendale-trained trio of Andy Dermenjyan, Haik Tsaturyan and Jared Papazian were victorious in their mixed martial arts bouts. 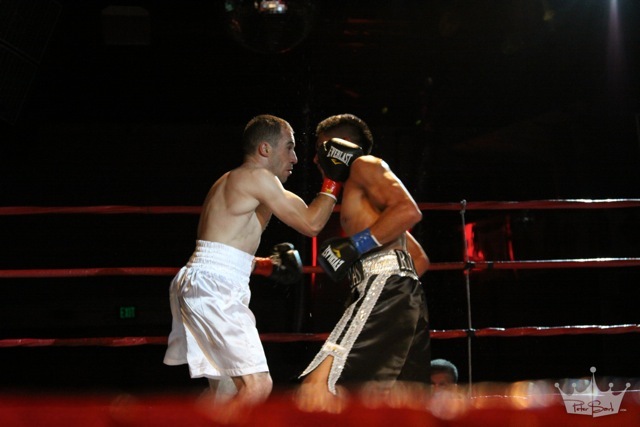 The only defeat to be had for a local fighter came when Glendale resident Vacho Avagyan was knocked out in the third round of his boxing bout with Richard Contreras in what was later named the promotion’s fight of the night. 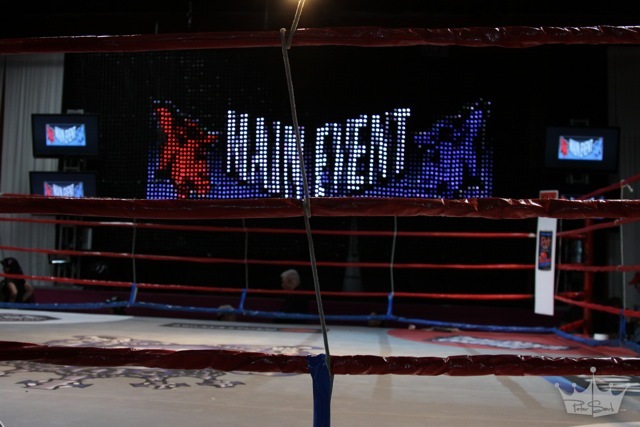 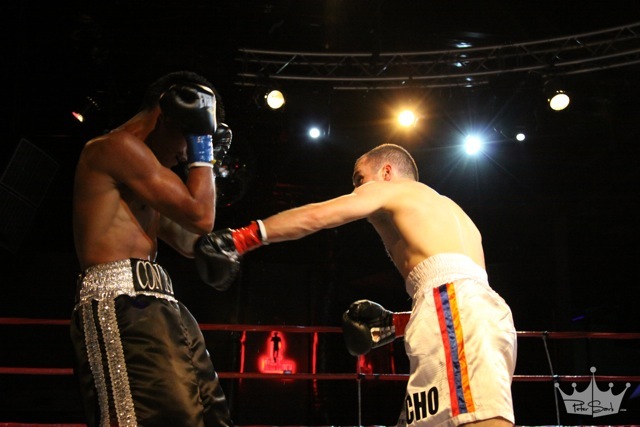 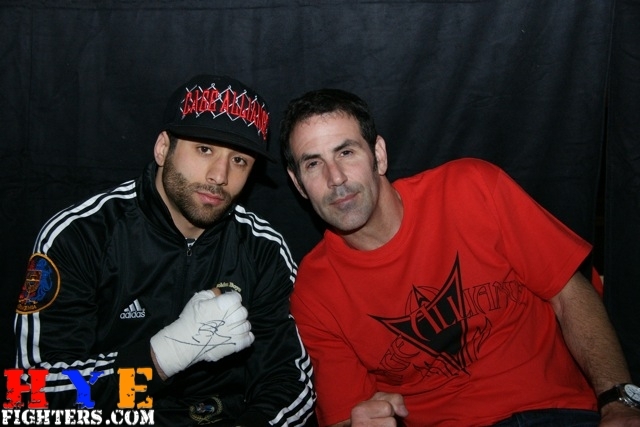 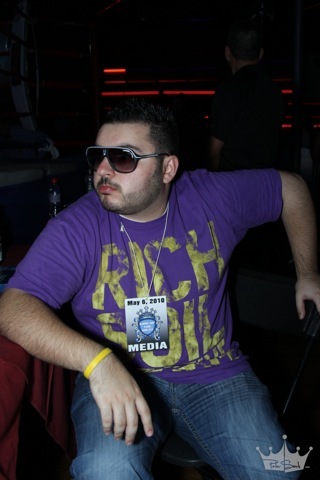 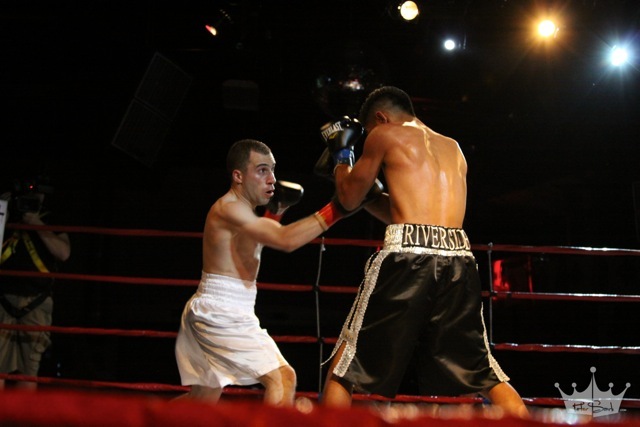 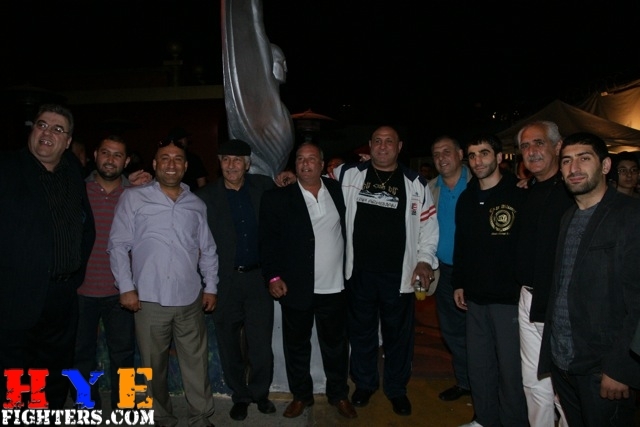 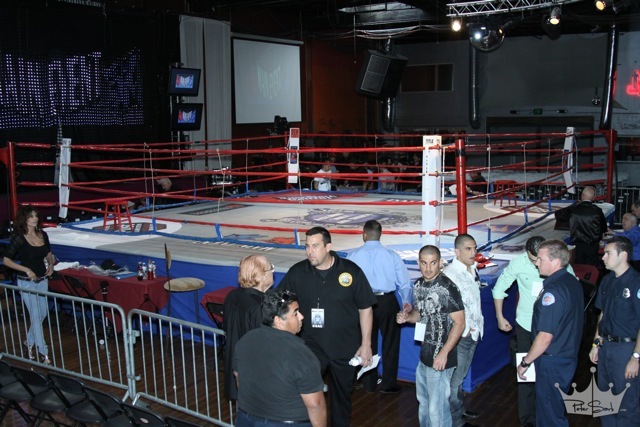 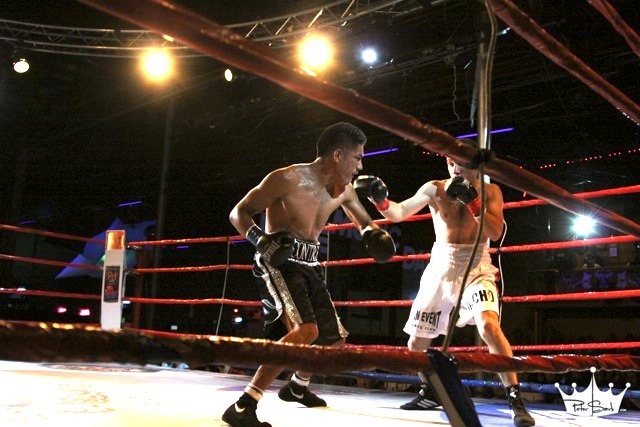 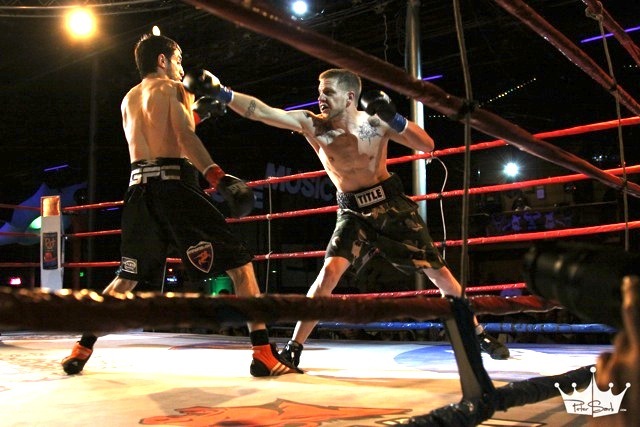 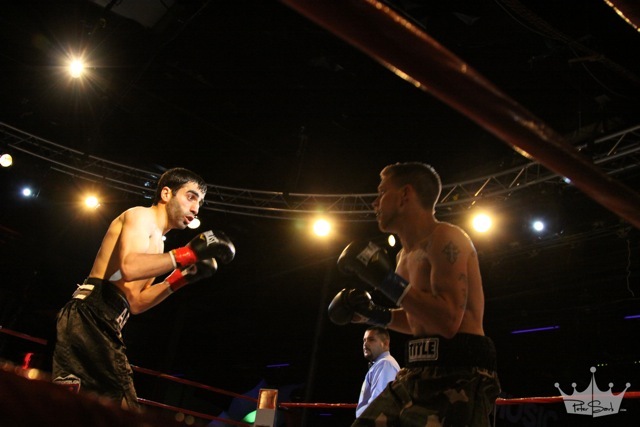 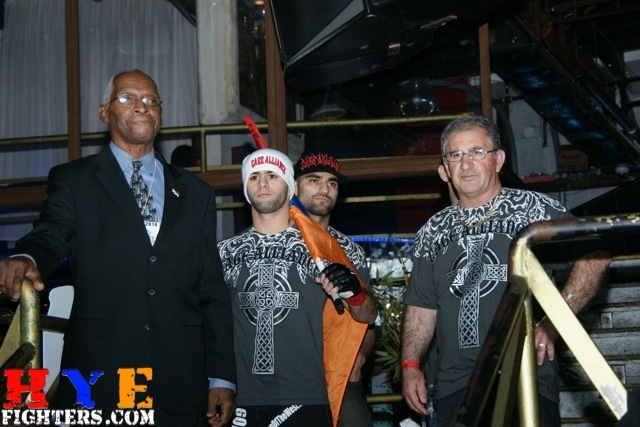 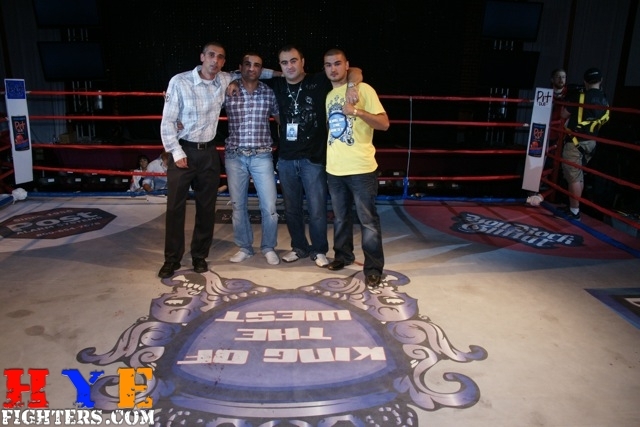 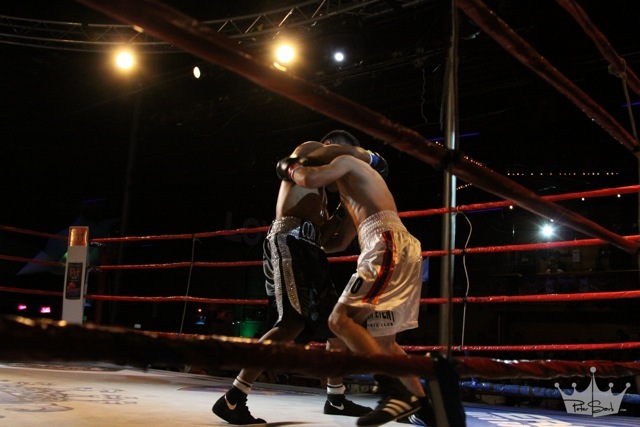 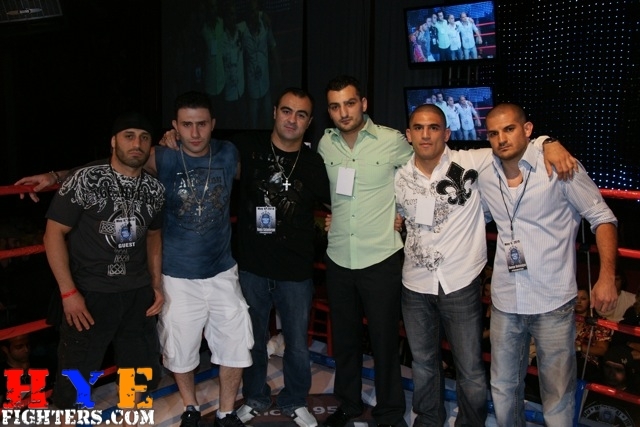 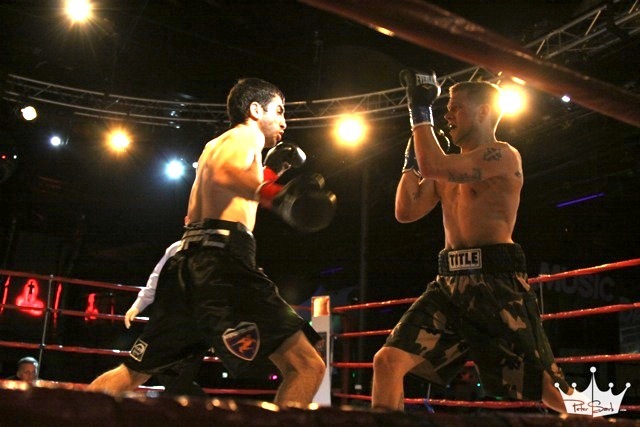 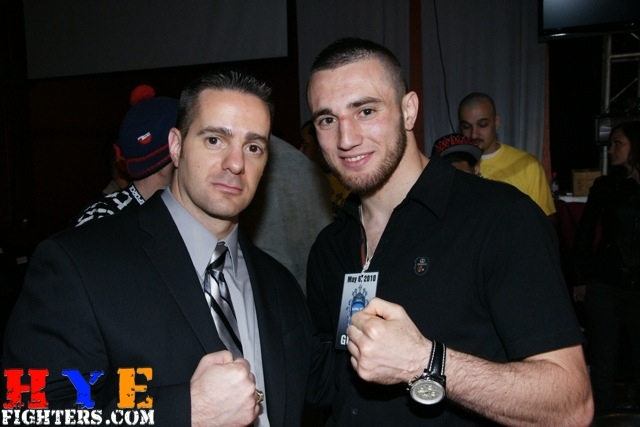 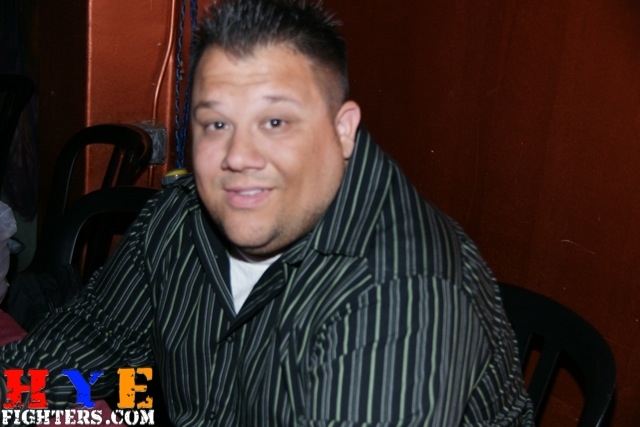 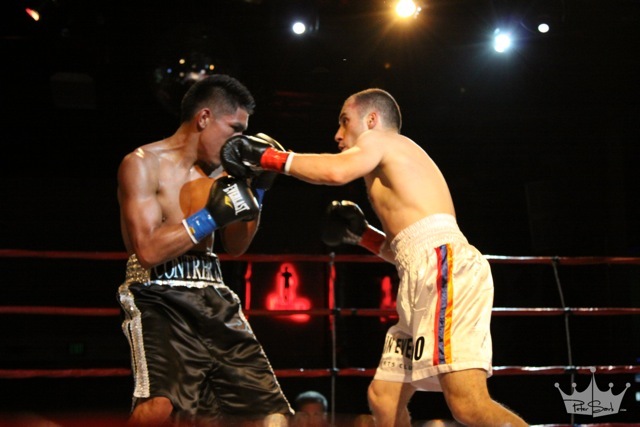 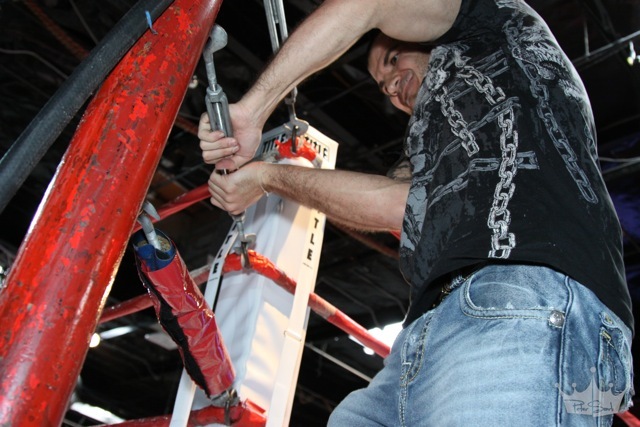 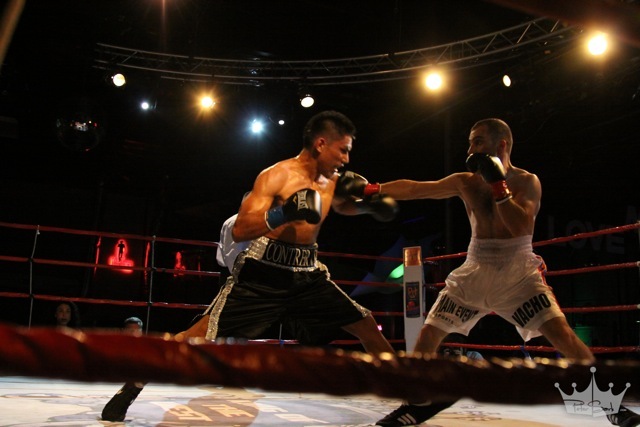 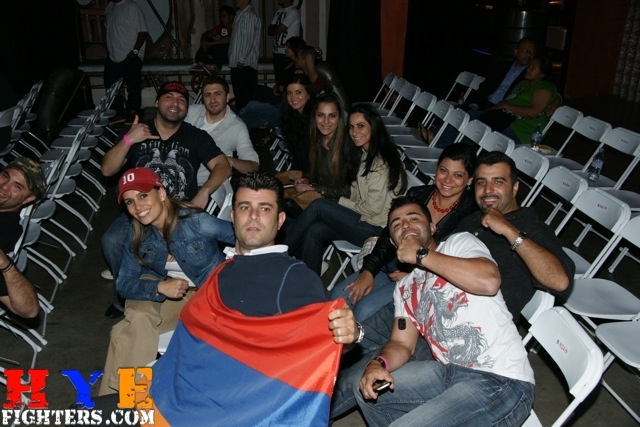 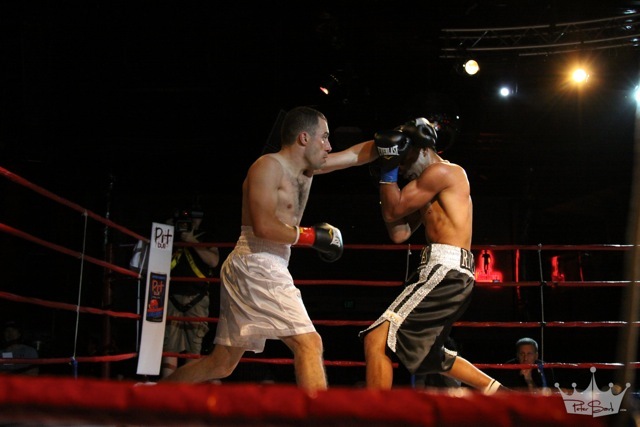 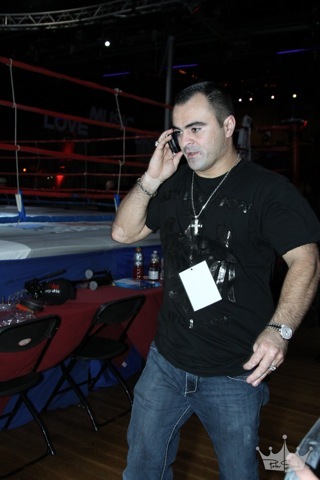 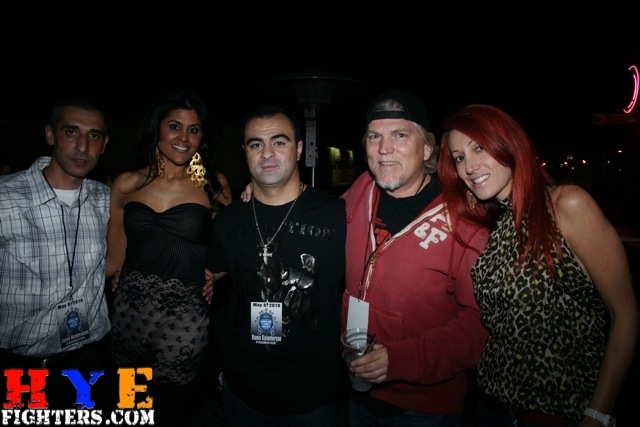 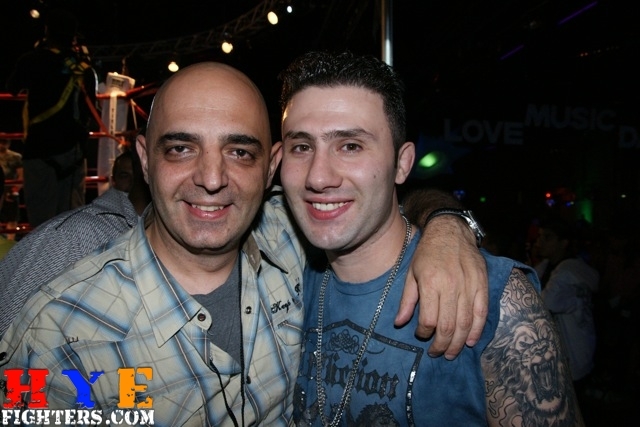 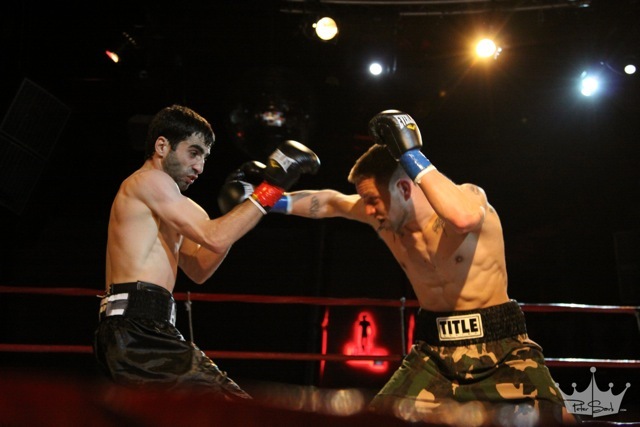 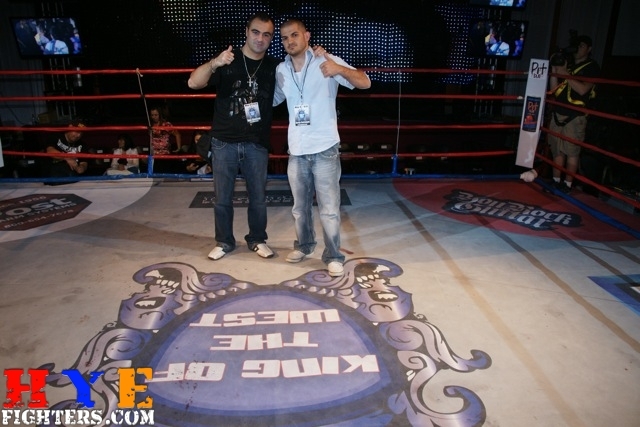 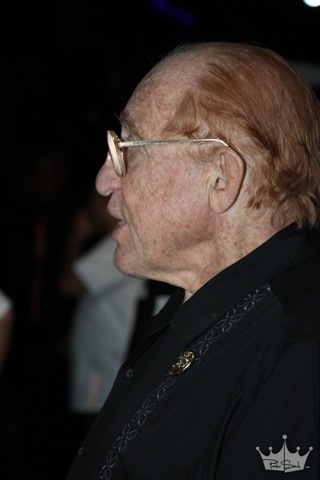 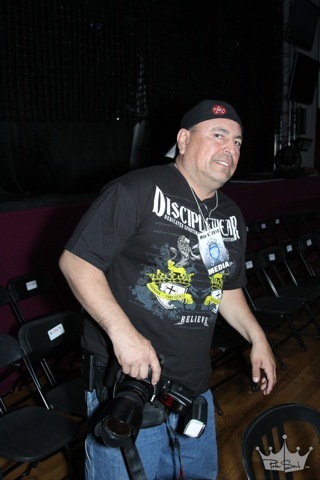 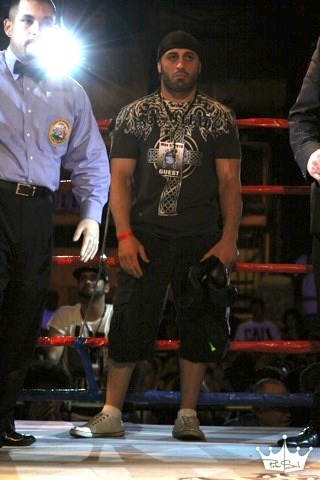 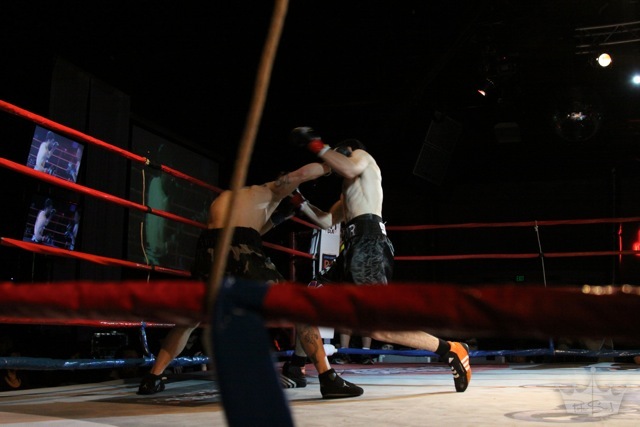 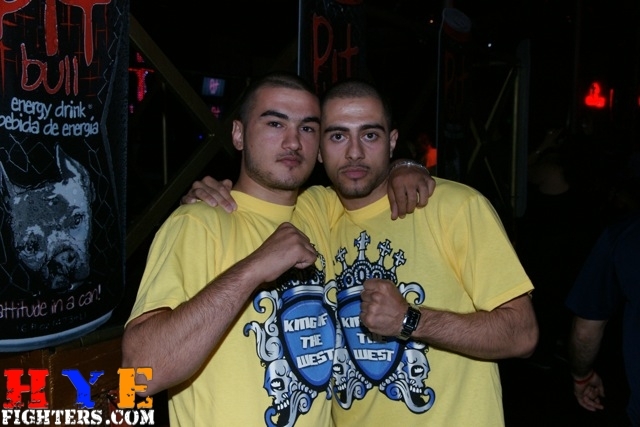 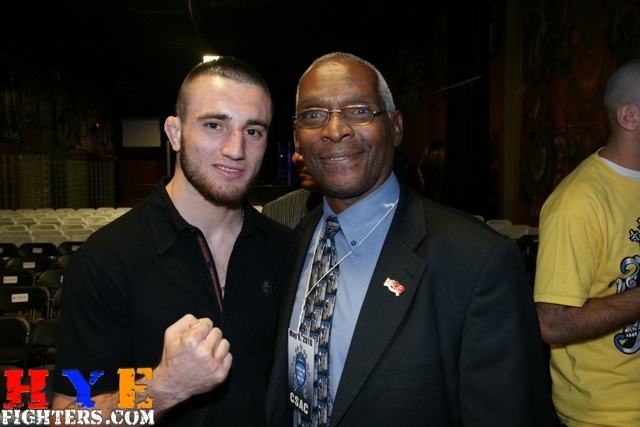 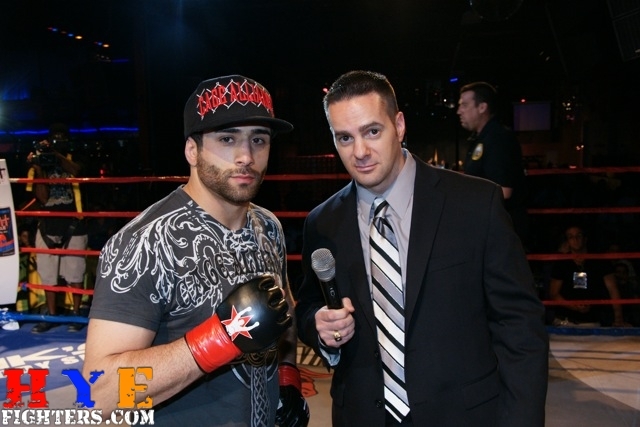 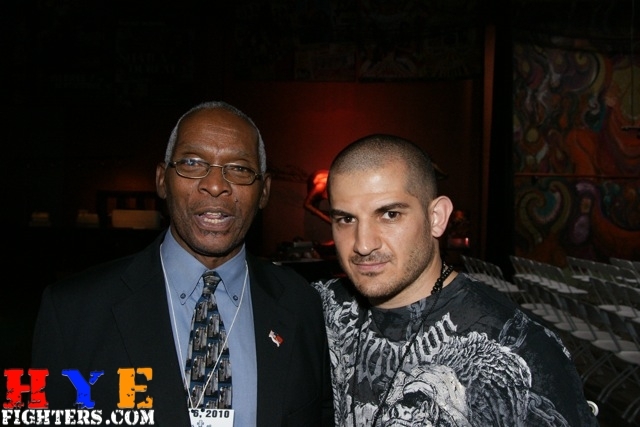 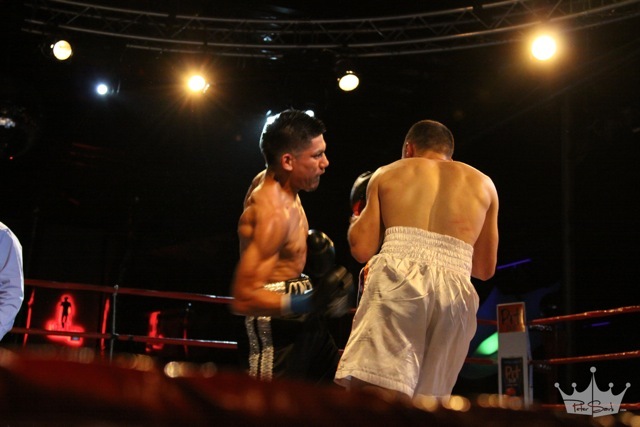 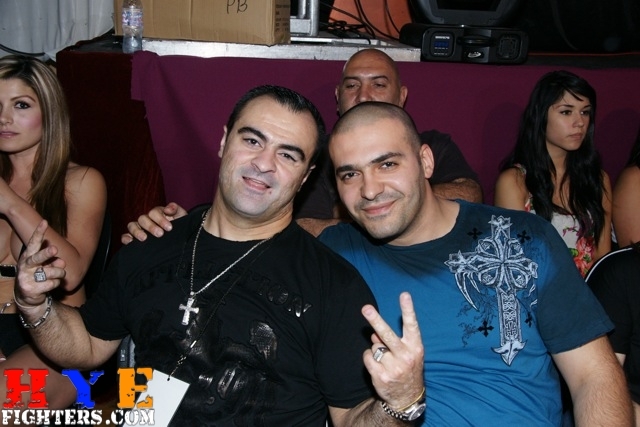 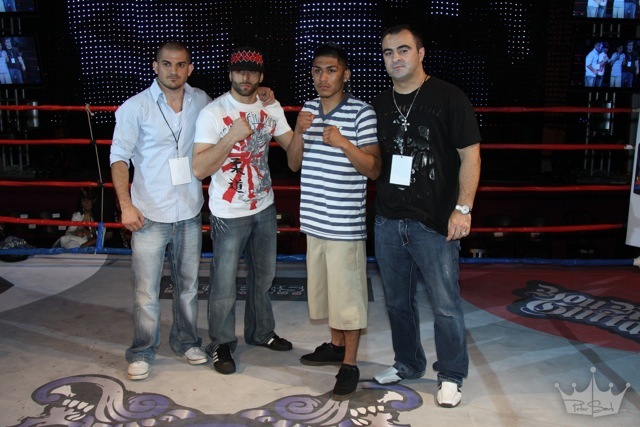 The nine-fight card featured a mix of boxing and MMA and the debut presentation for King of the West, which is co-promoted by Roma Kalantaryan, the proprietor of the Main Event Sports Club in Glendale. 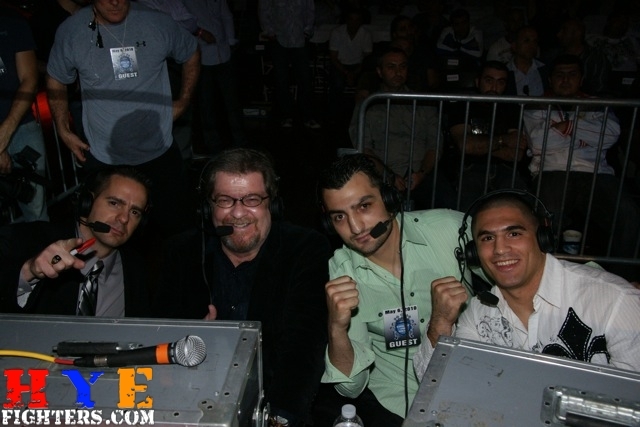 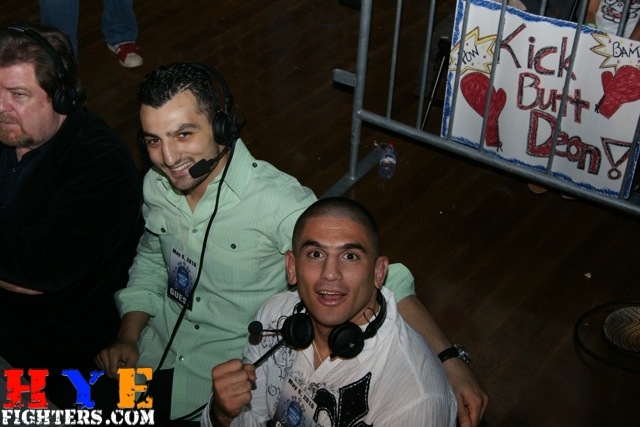 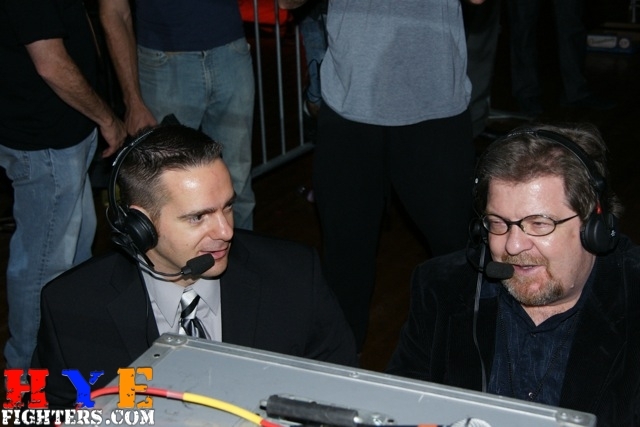 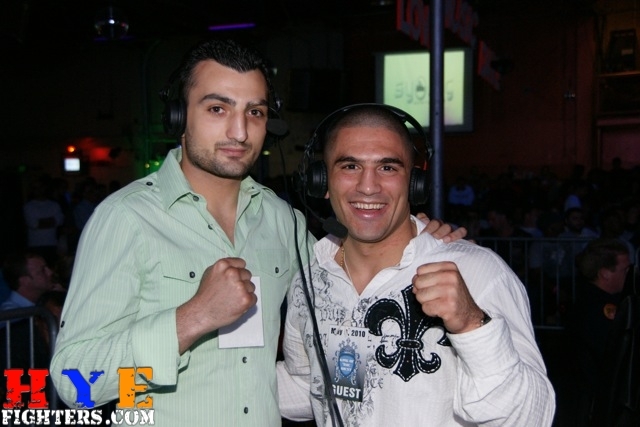 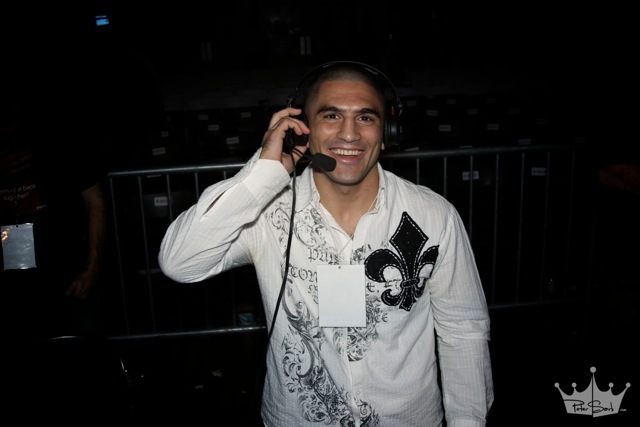 The taped broadcast also featured commentary from undefeated Glendale boxer Vanes Martirosyan and World Extreme Cagefighting lightweight Karen Darabedyan. 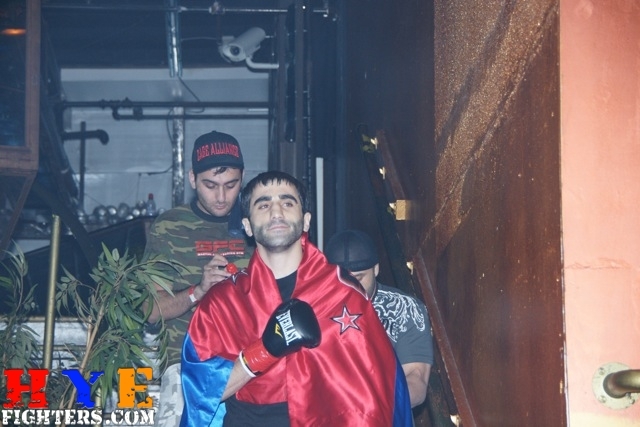 Bernetsyan (3-0, 2 KOs), fighting out of Tarverdyan’s Glendale Fighting Club, had a gameplan to settle down and box and use his body punches. 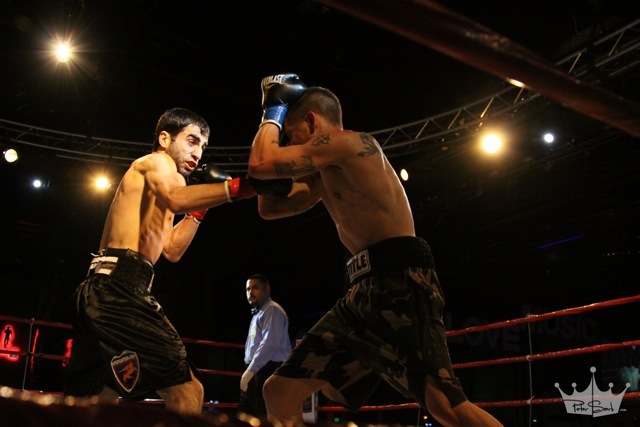 Both elements came to play in a dominant victory in the welterweight fight some 14 pounds north of the 130 pounds Bernetsyan generally fights at. 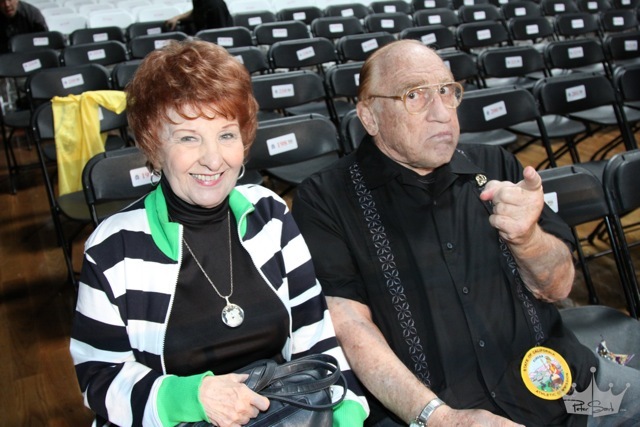 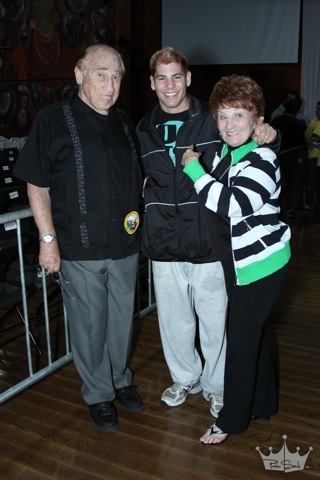 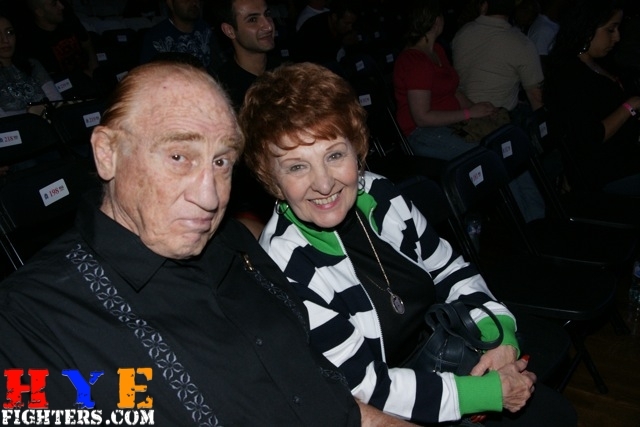 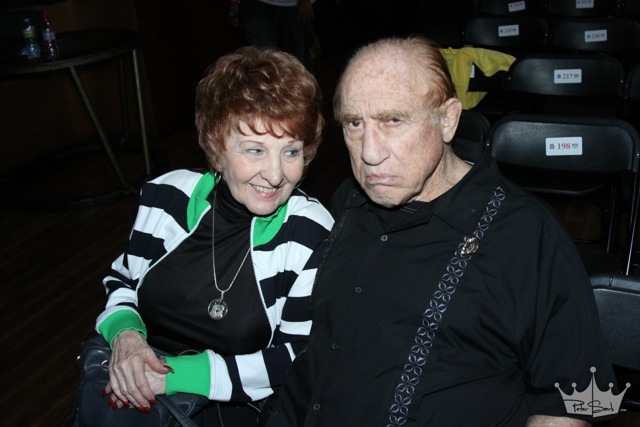 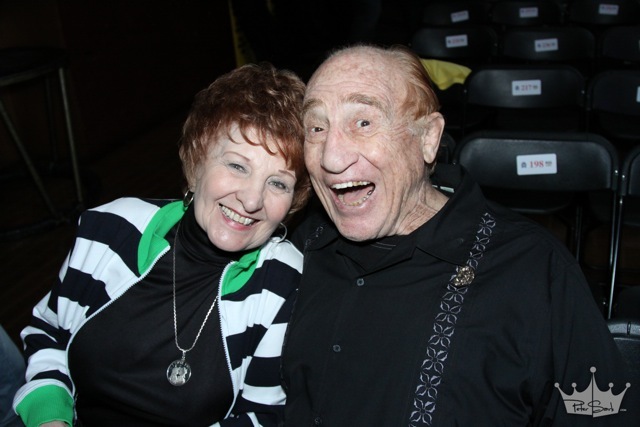 His original opponent backed out at the last minute due to a death in the family. 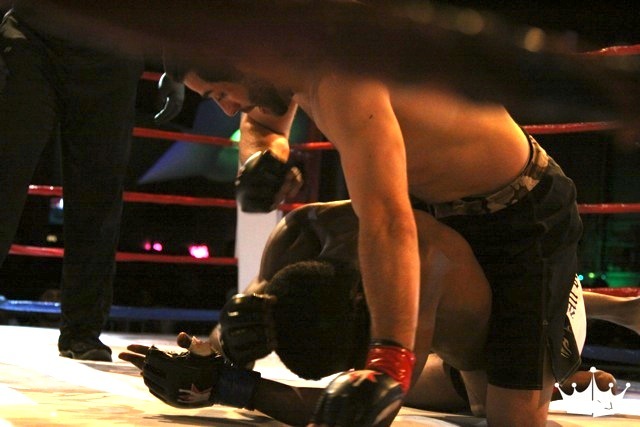 Brannie (1-5) promptly stepped up and was soon knocked down. 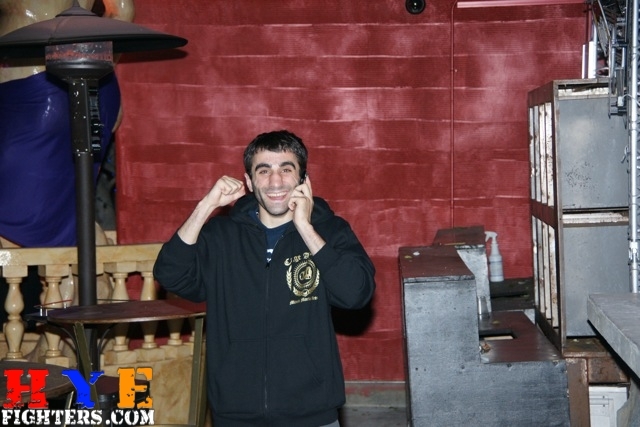 Bernetsyan rocked Brannie late in the first round with a right hook right on the chin and the Armenian southpaw followed with a straight left that floored Brannie, who just made the count right as the bell to end the first round sounded. 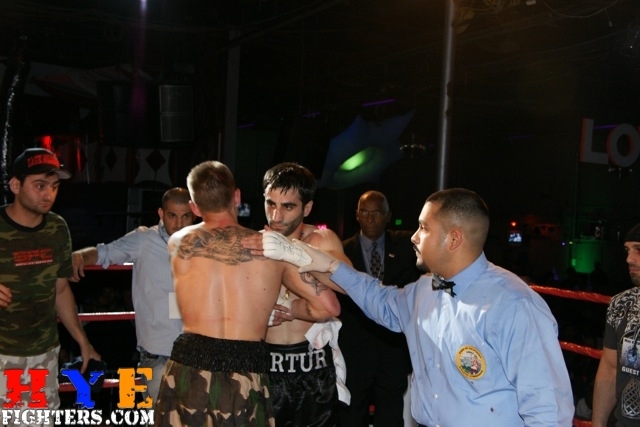 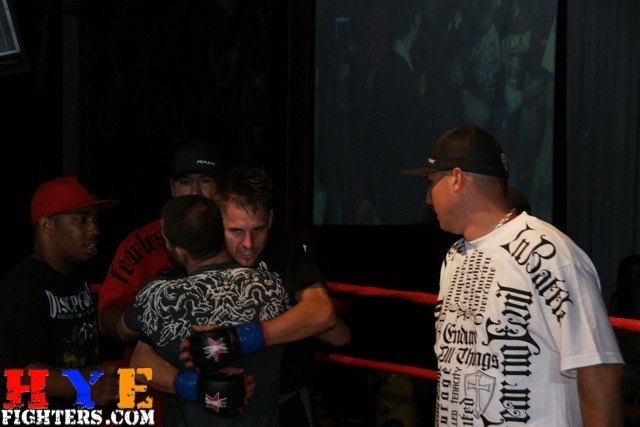 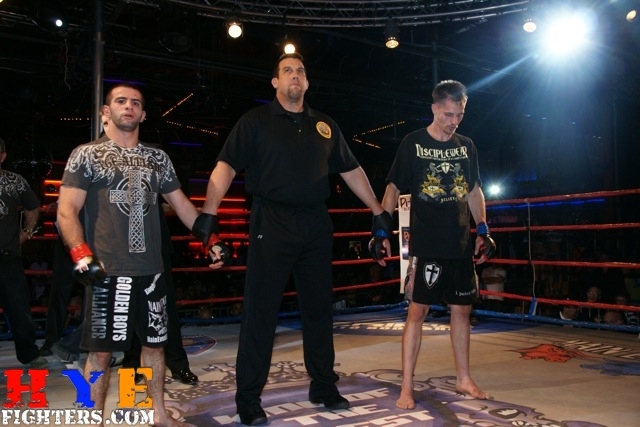 Brannie came out swinging in the second, but for the most part, Bernetsyan resisted engaging in a brawl. 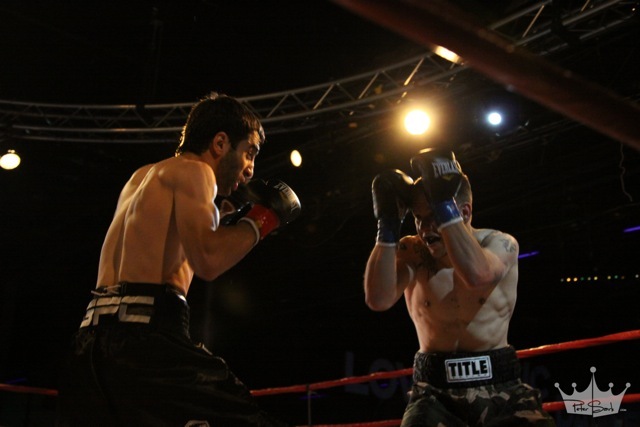 Bernetsyan began working the body with a damaging left hook to the ribs that hurt Brannie. 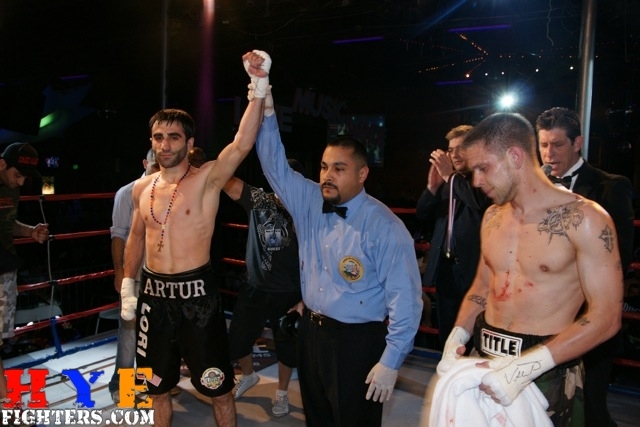 Shortly after a stream of body shots had worn down Brannie, Bernetsyan went upstairs with a right hook that ended the fight. 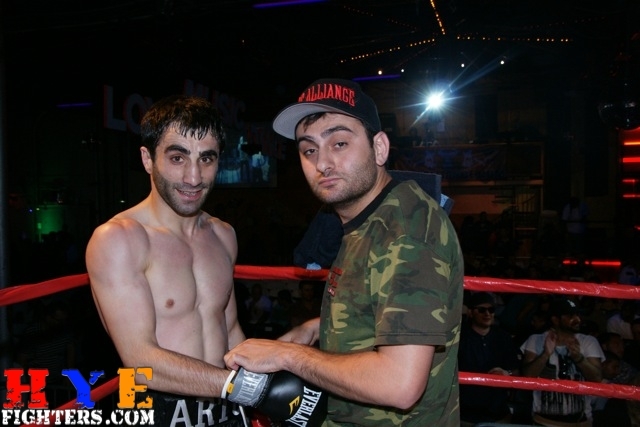 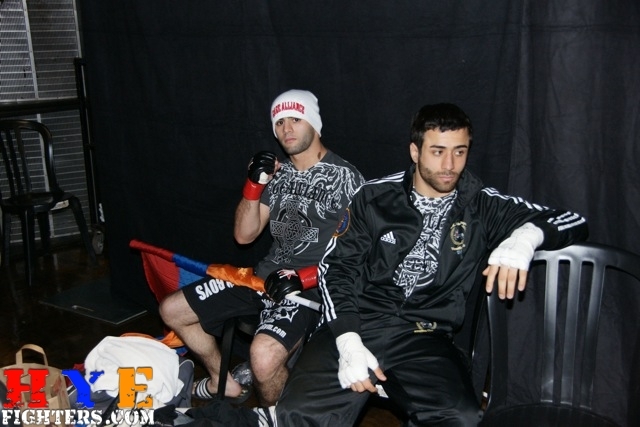 Two bouts prior to Bernetysan’s, Avagyan (2-1, 1 KO) made his return to the ring after nearly a year away and was winning a spirited bantamweight (122 pounds) boxing match before losing a slugfest. 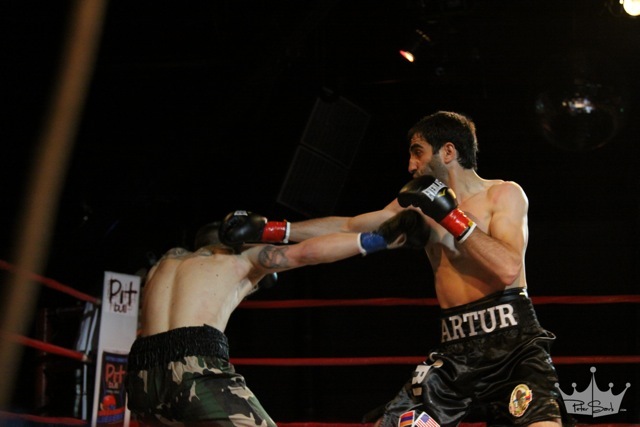 Avagyan, also a southpaw, danced in and out, sticking and moving, using a straight left masterfully against Richard Contreras (1-0, 1 KO), who was making his pro debut. 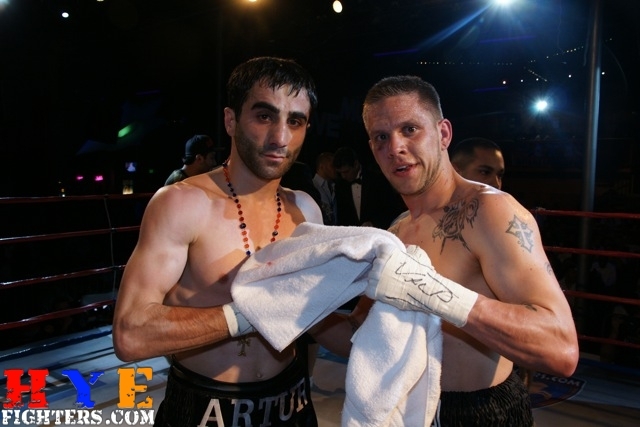 Contreras threw his punches with authority, but Avagyan made him miss often, landing with single punches largely from the outside and flurrying on the inside before dancing back out of danger to take each of the first two rounds, 10-9, on the News-Press scorecard. 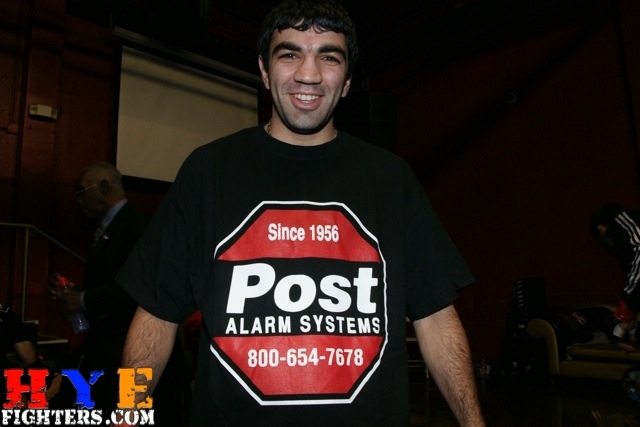 In the third, however, Avagyan had his knees buckled by a right uppercut and seconds later was on the canvas after a right cross. 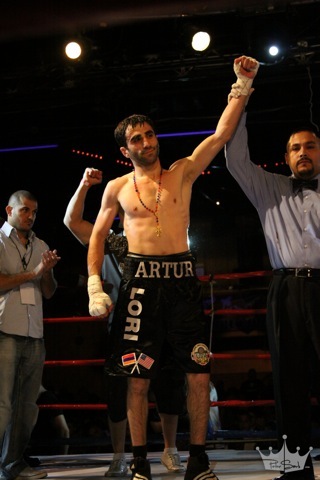 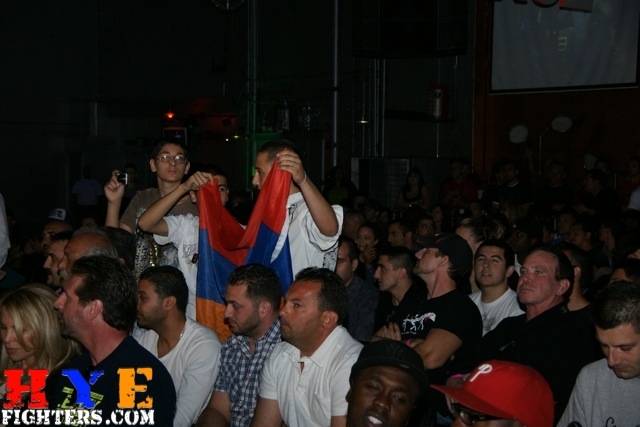 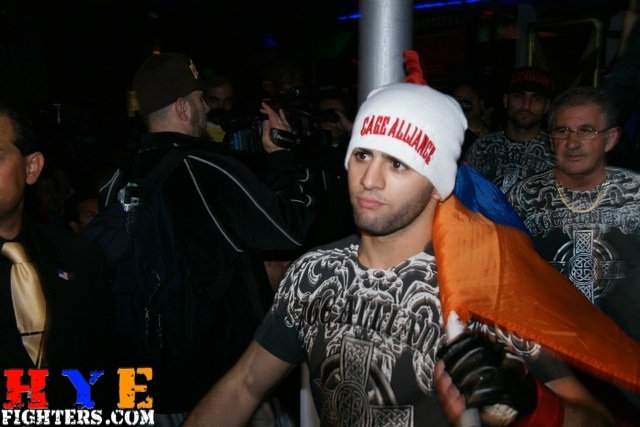 Avagyan returned to his feet and never took a step back, engaging Contreras and, at one point, seemingly starting to take over as the two squared up and traded punches, bringing the crowd to its feet. 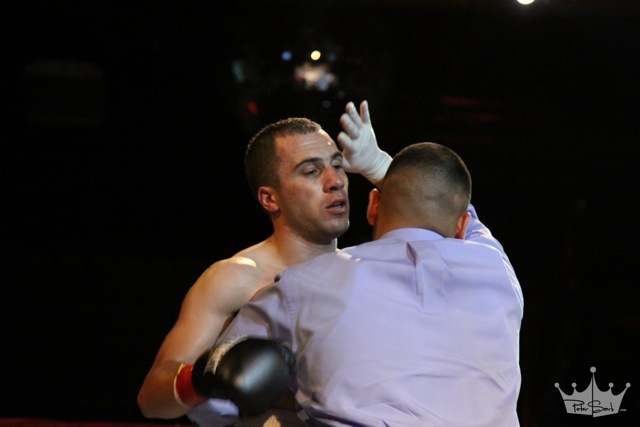 But just as Avagyan looked to have turned the tides, Contreras landed a savage right uppercut that crumpled the Glendale fighter, his left knee going out from under him. 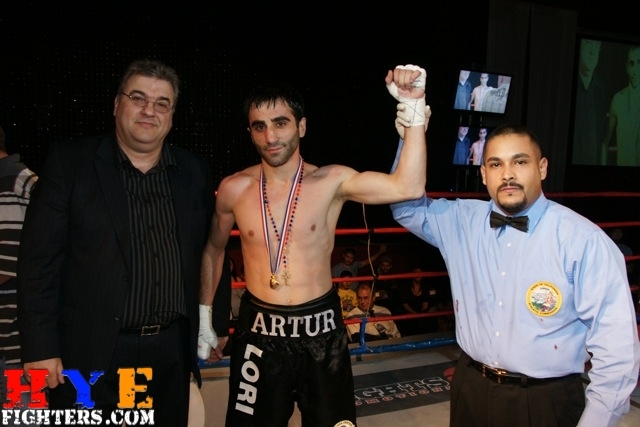 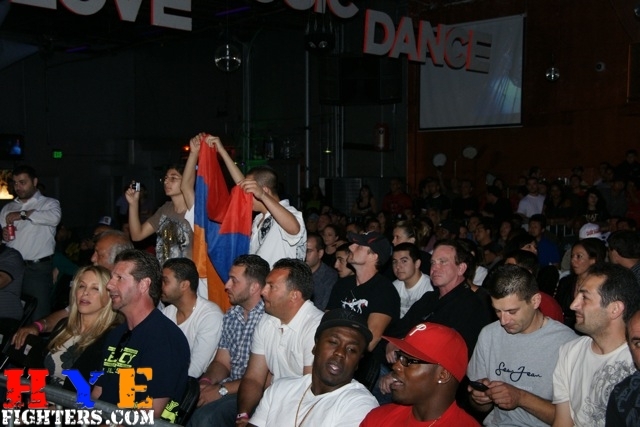 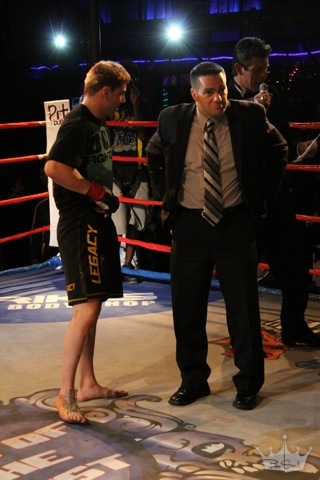 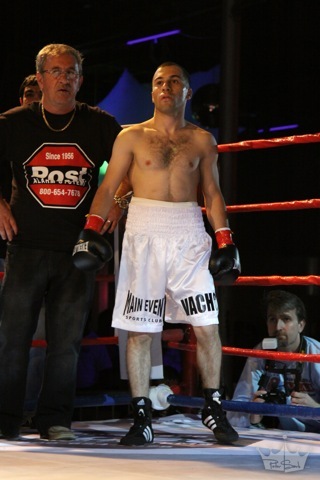 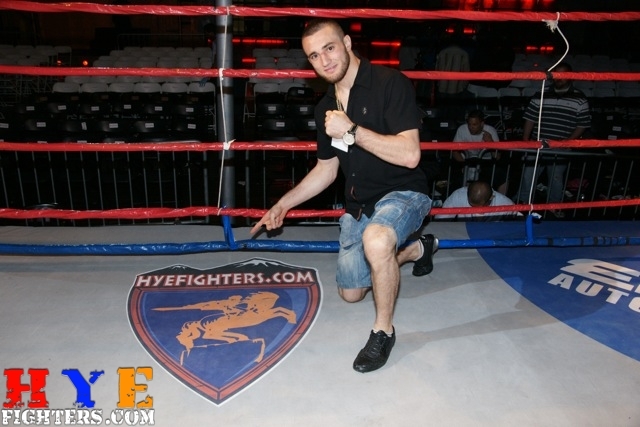 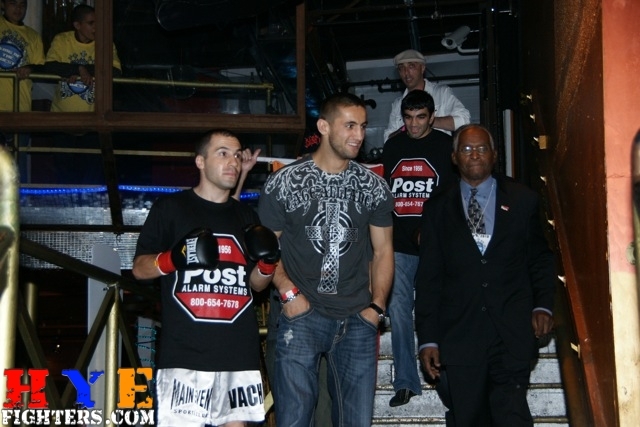 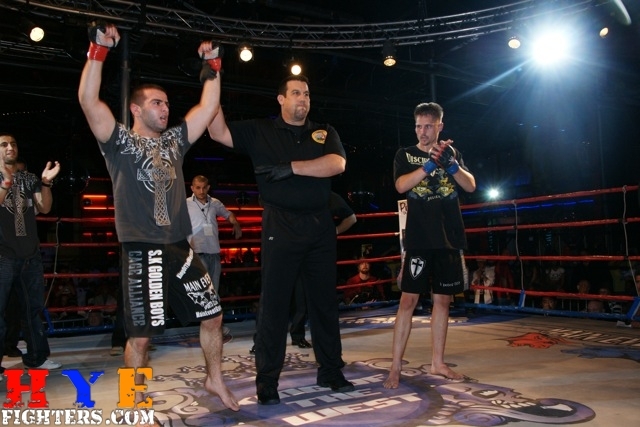 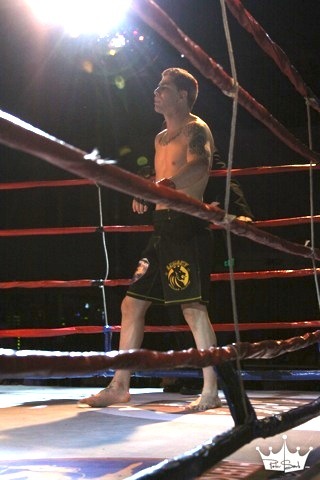 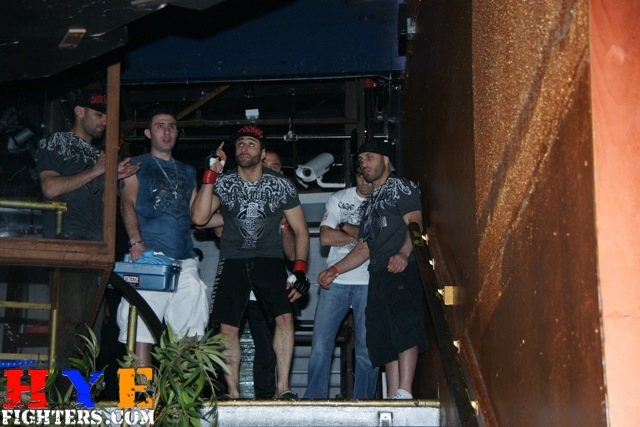 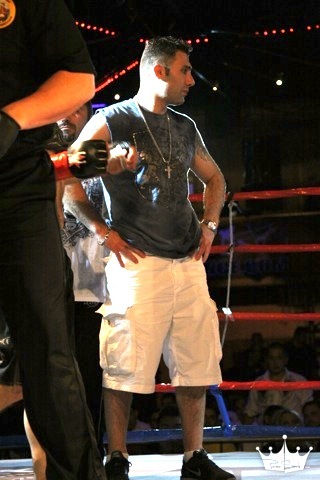 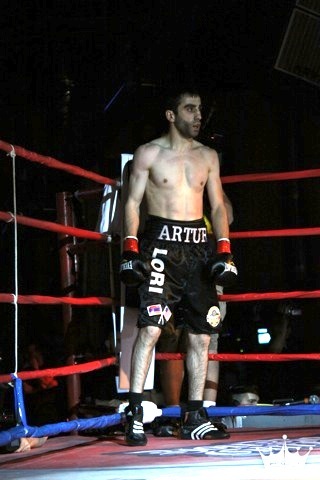 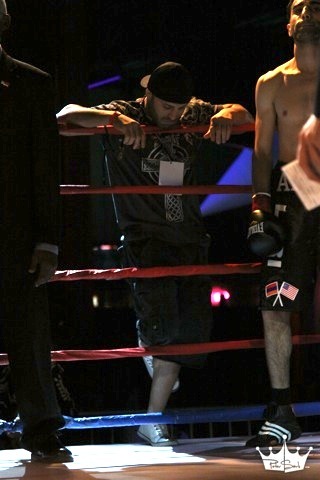 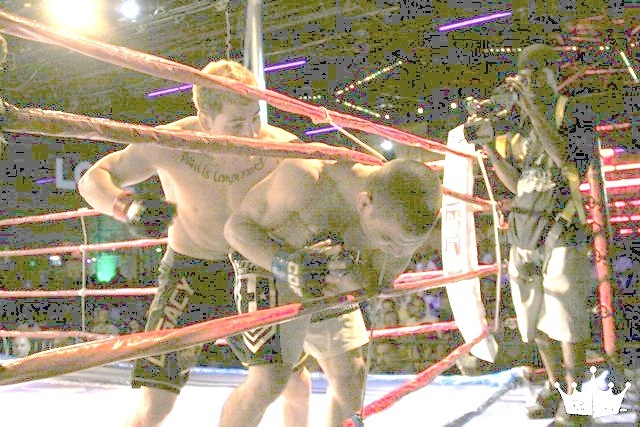 Avagyan staggered to his feet in an effort to beat the count, but the referee put a halt to the bout. 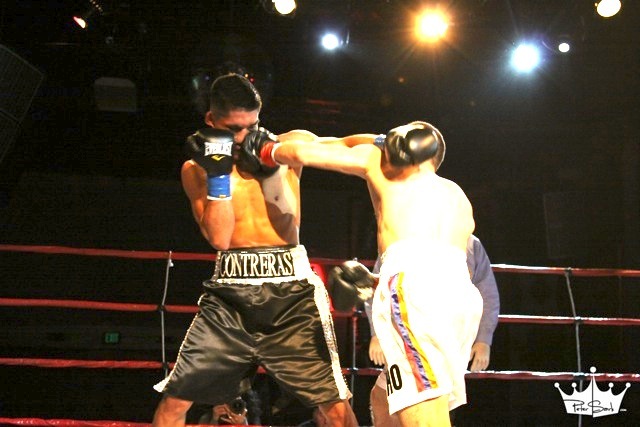 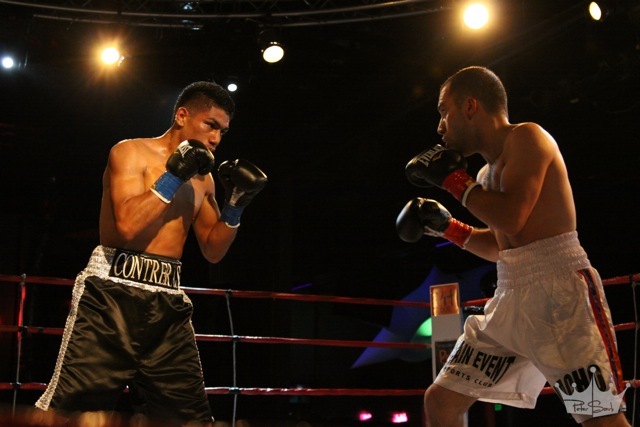 Contreras’ win was later named knockout of the night. 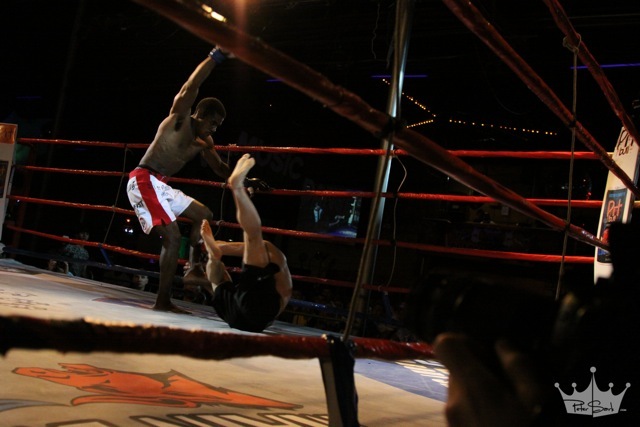 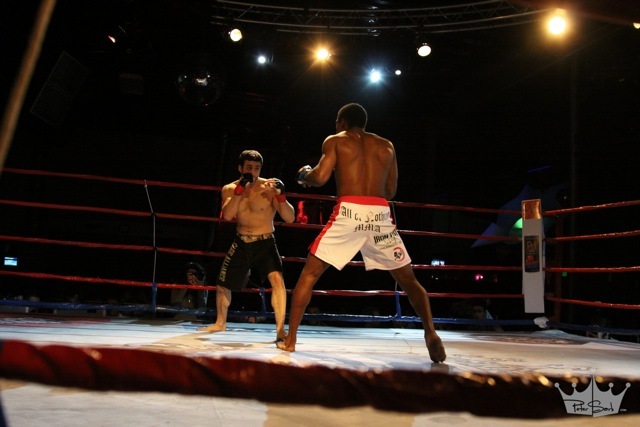 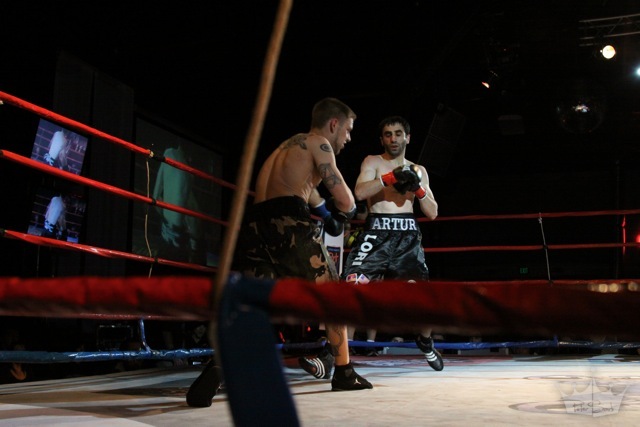 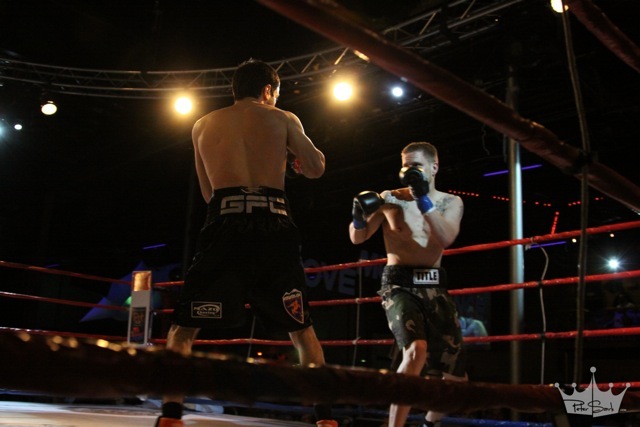 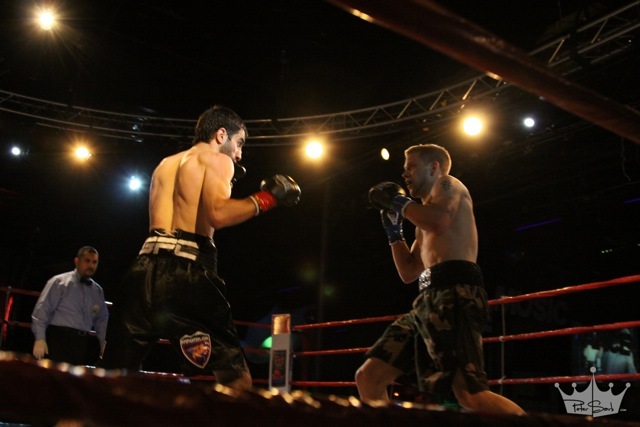 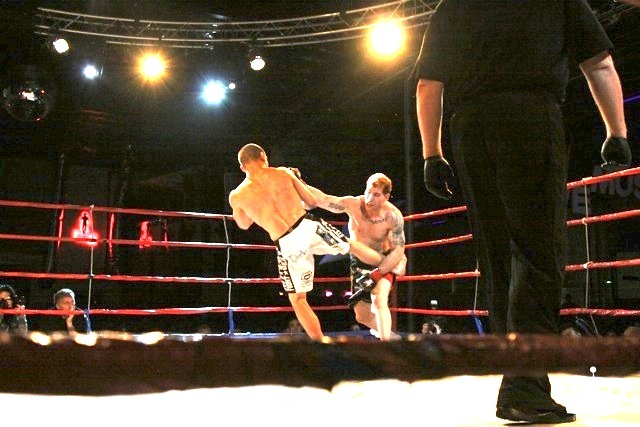 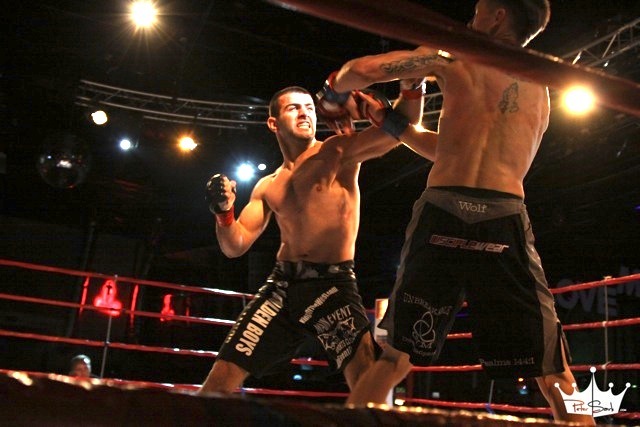 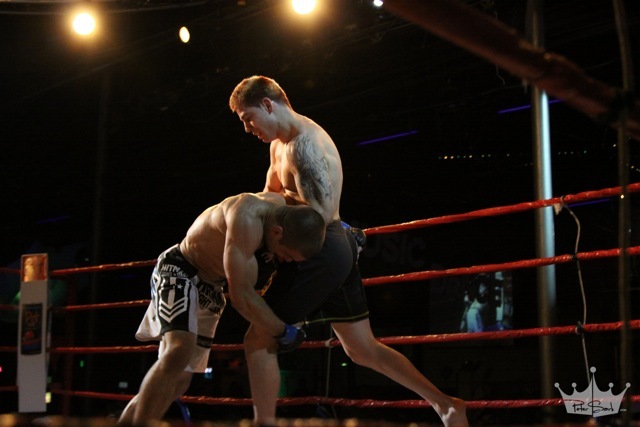 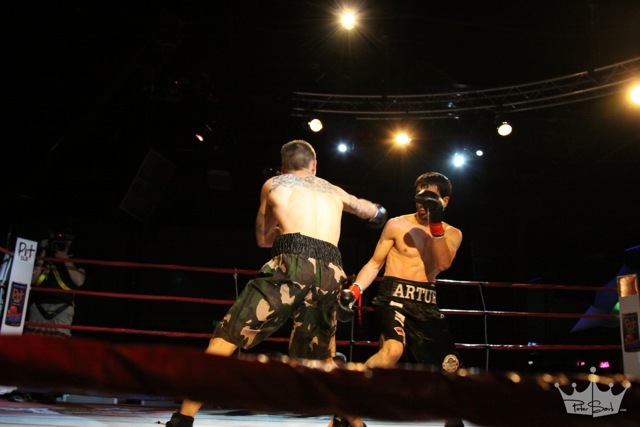 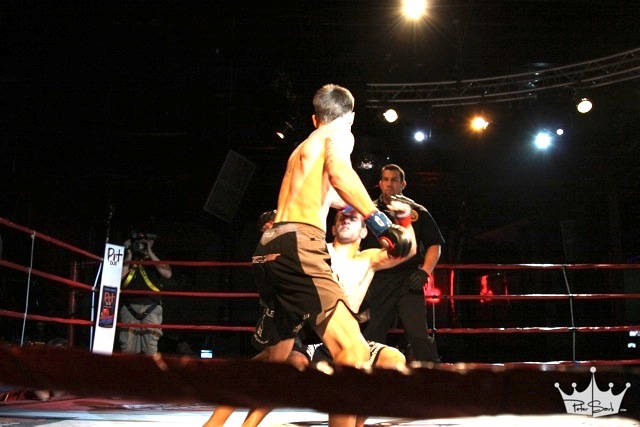 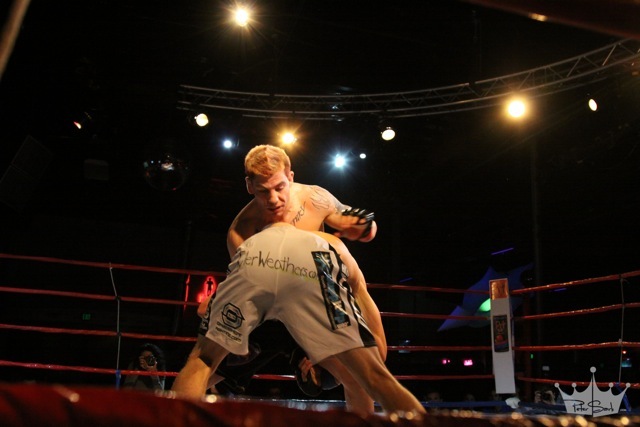 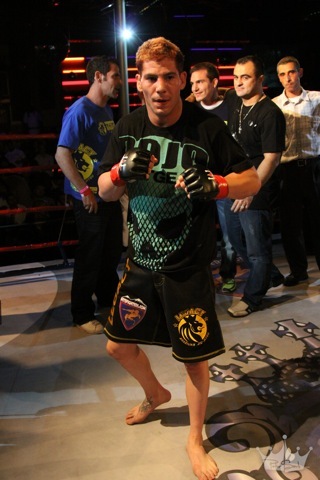 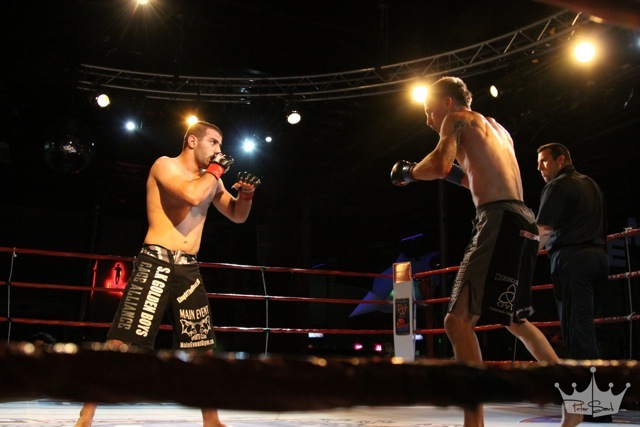 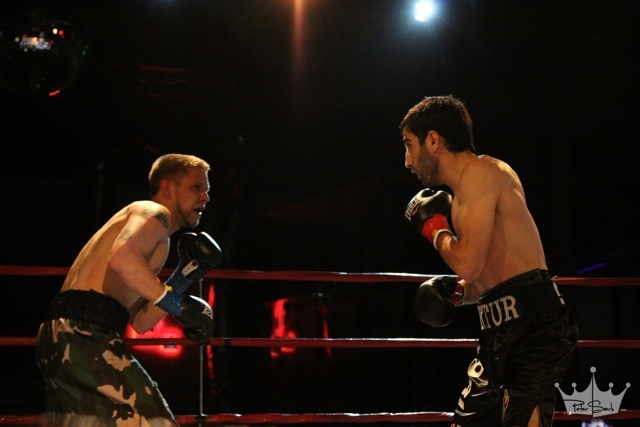 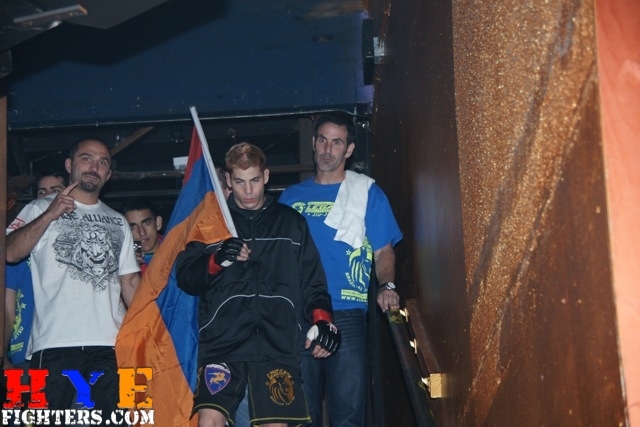 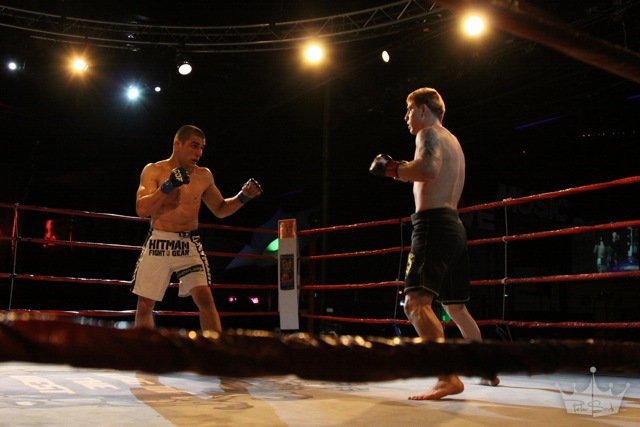 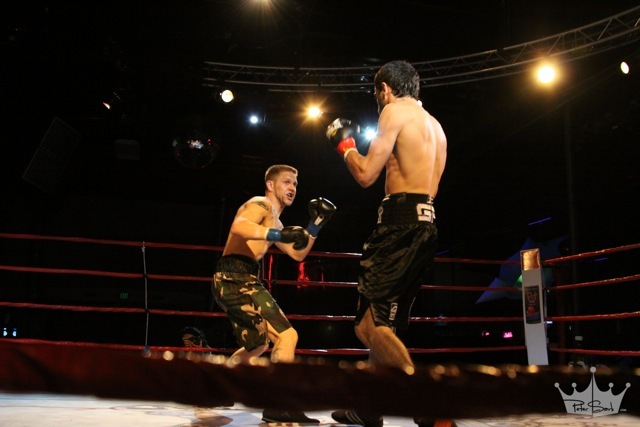 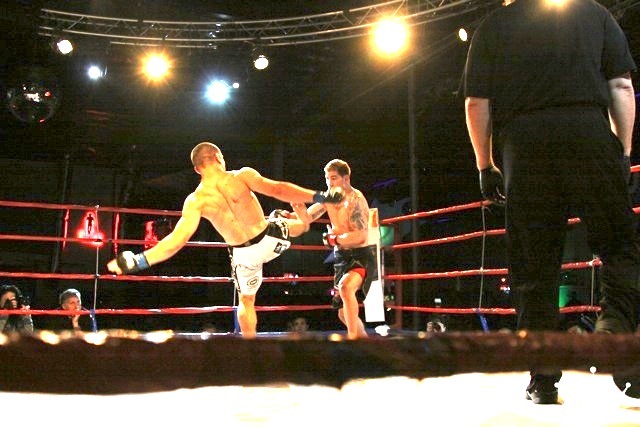 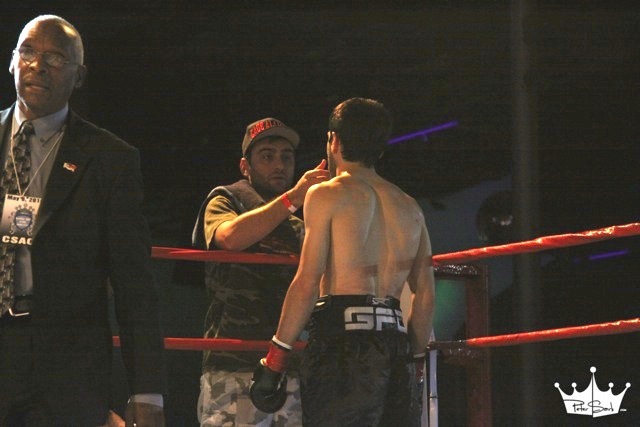 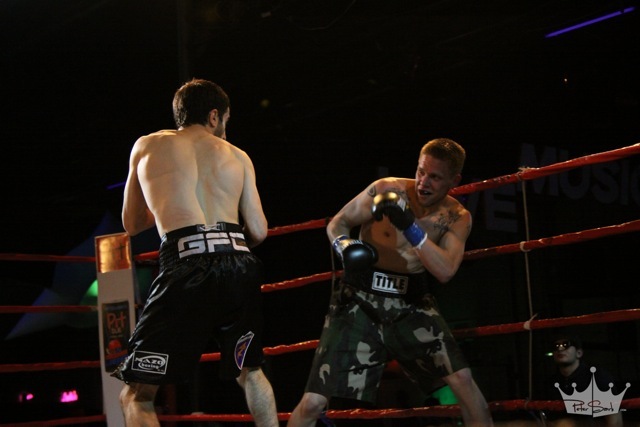 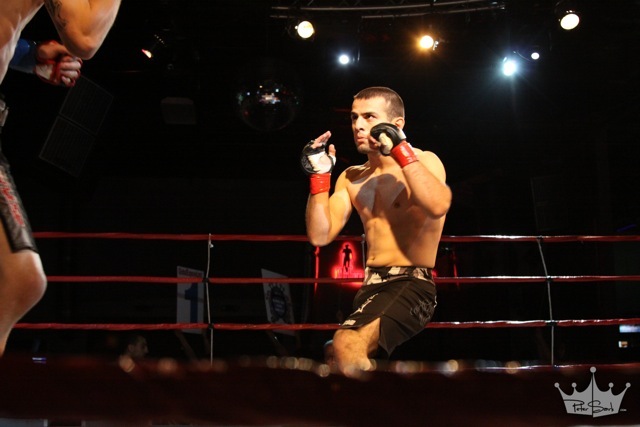 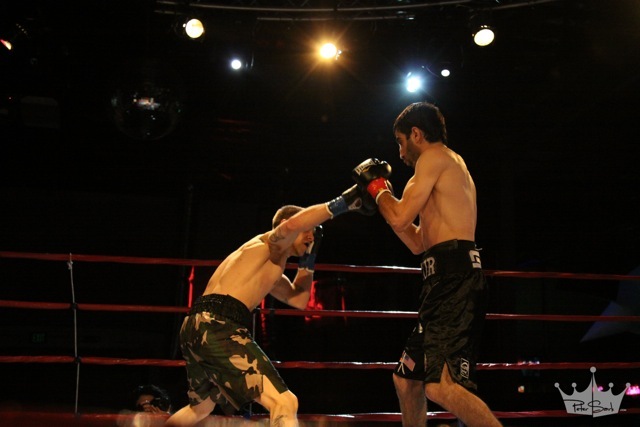 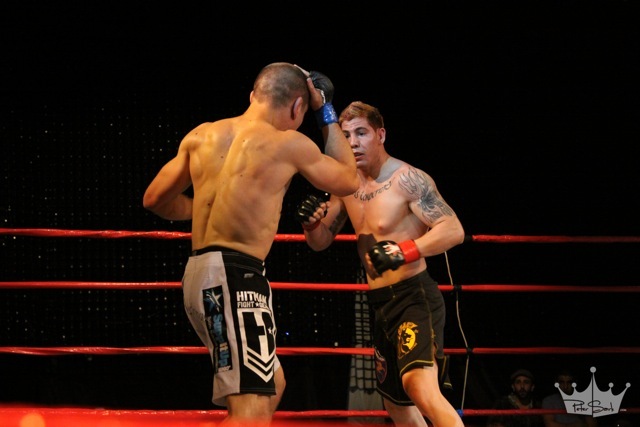 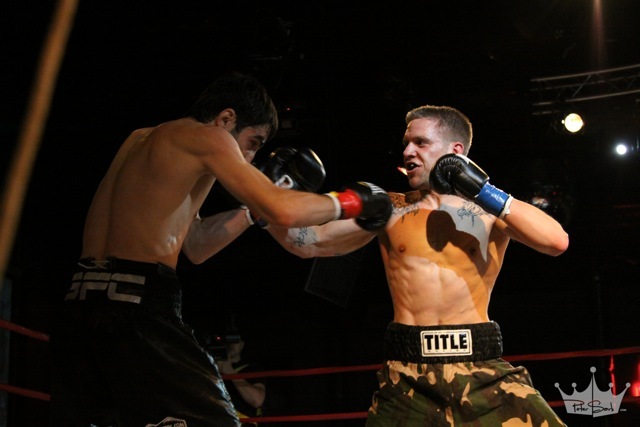 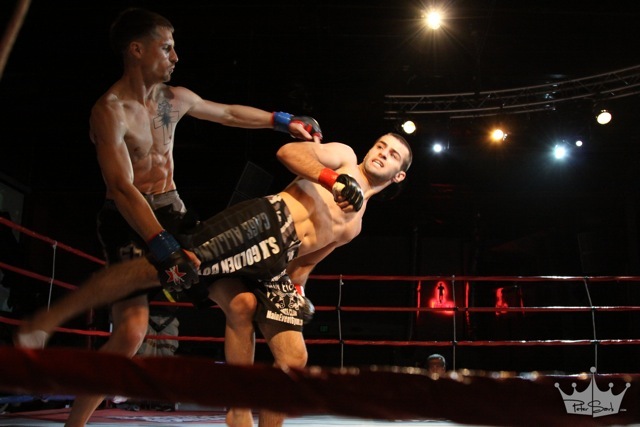 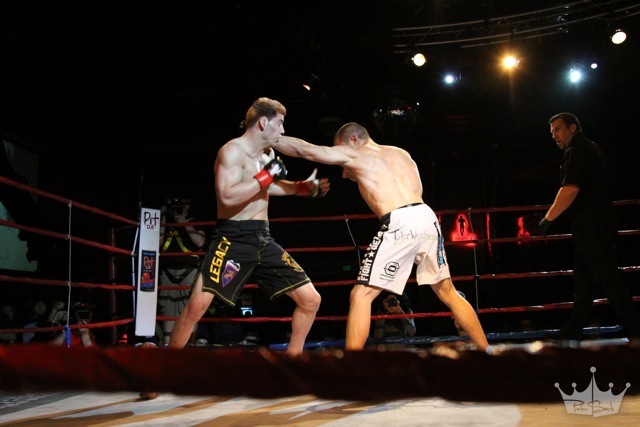 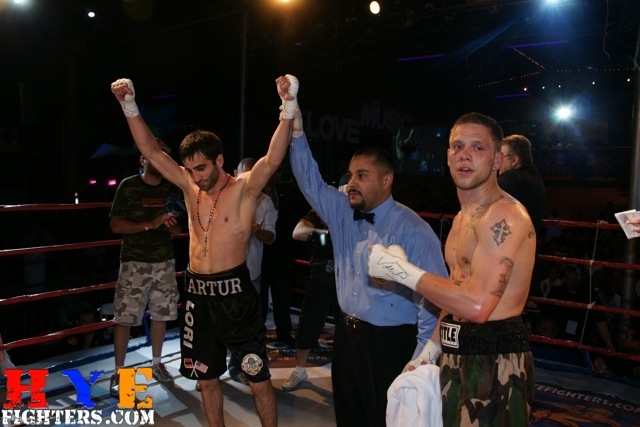 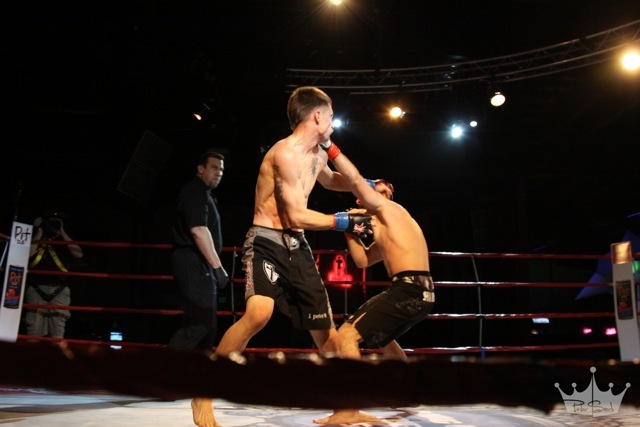 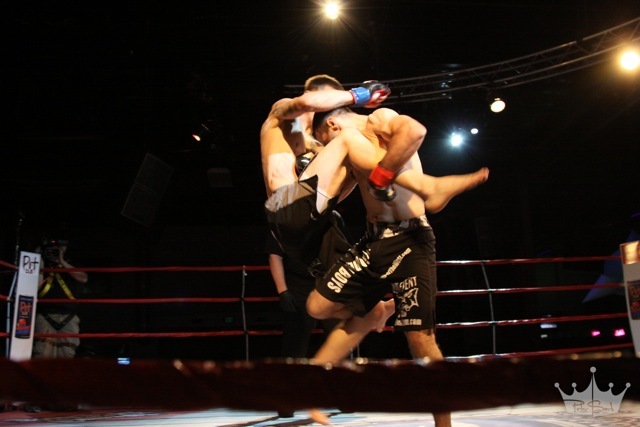 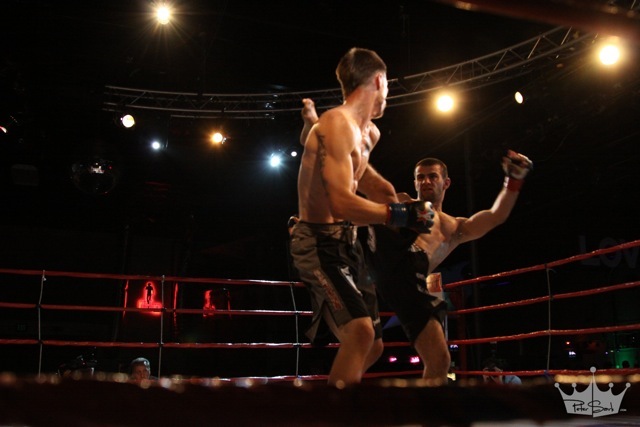 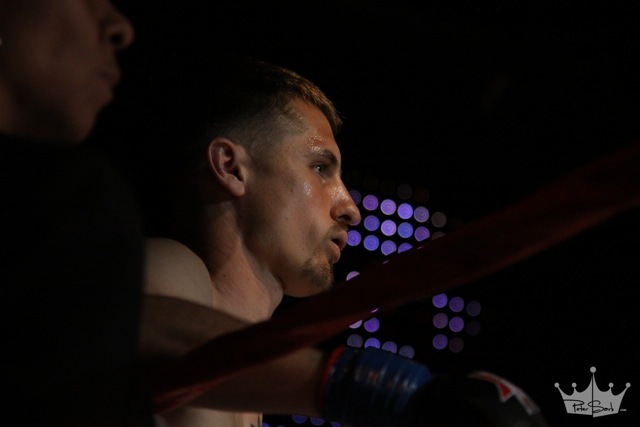 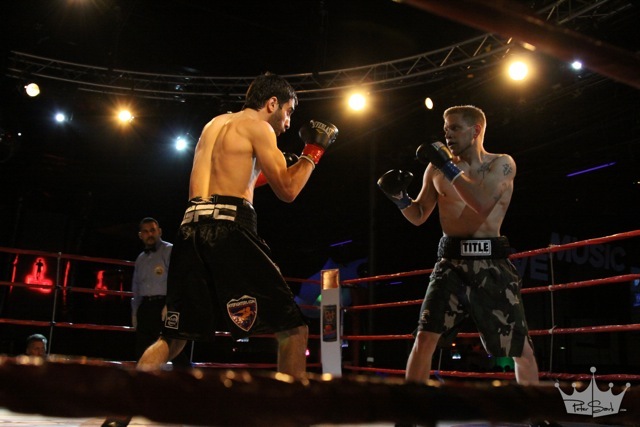 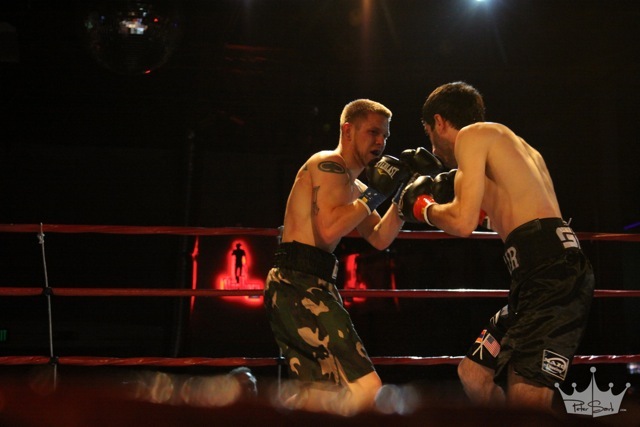 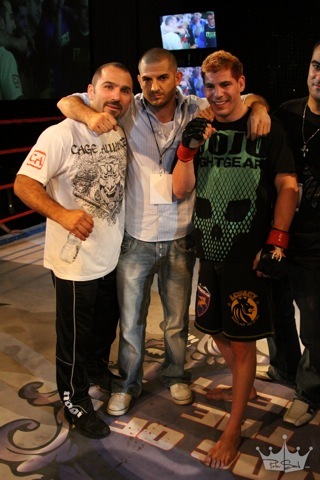 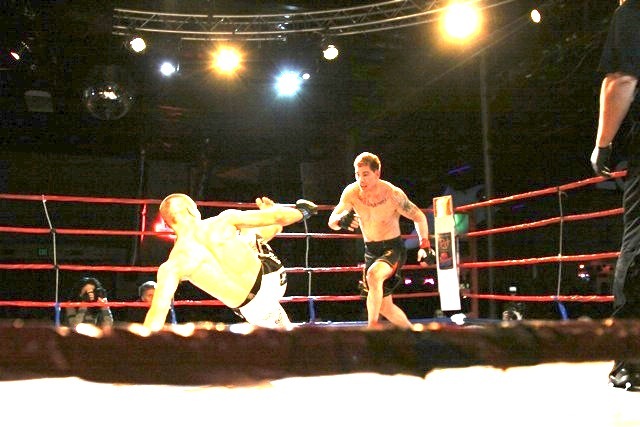 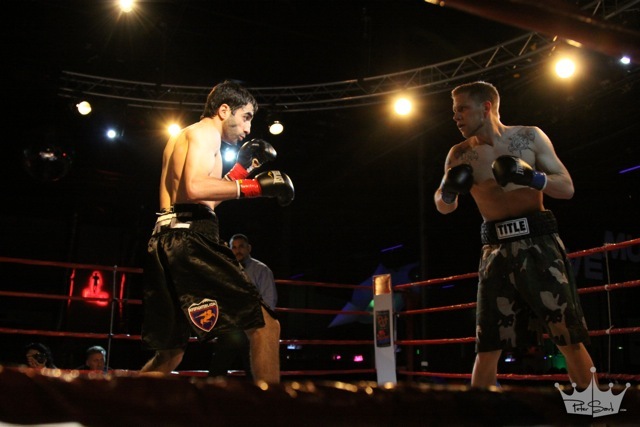 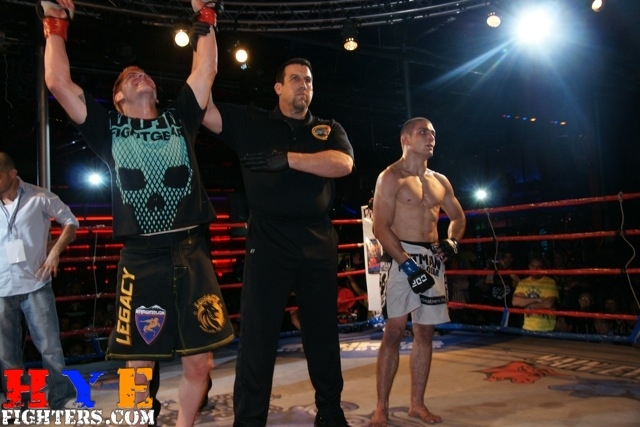 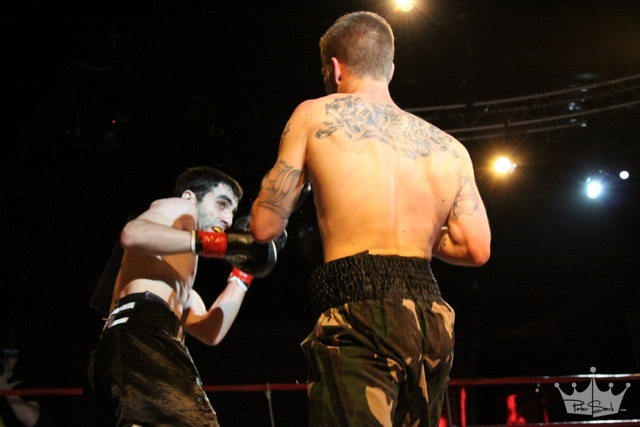 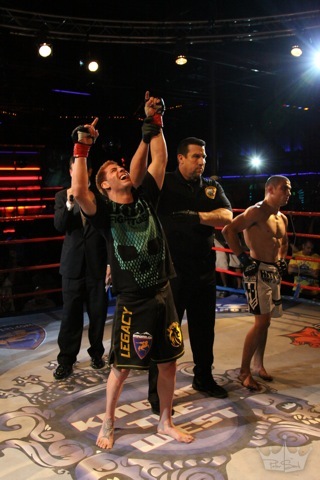 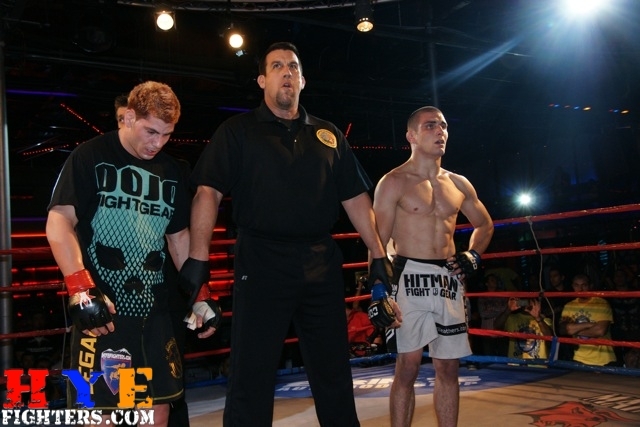 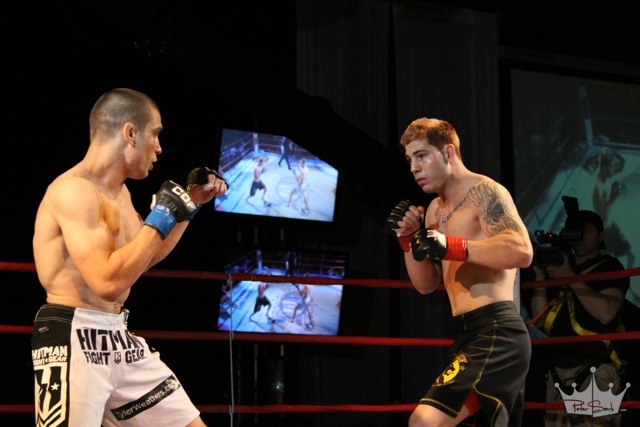 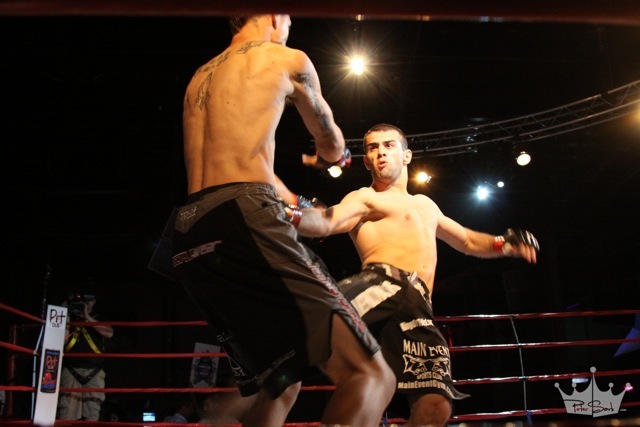 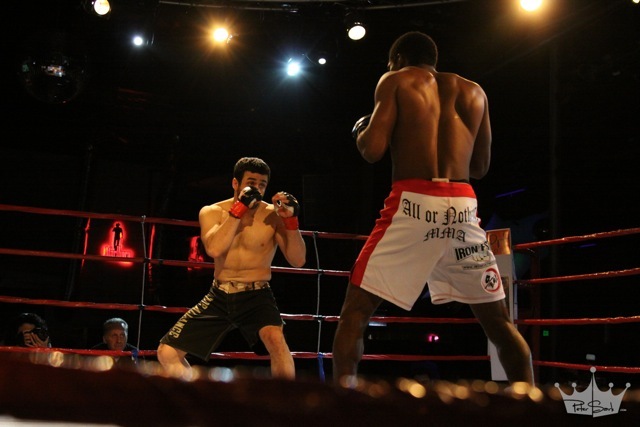 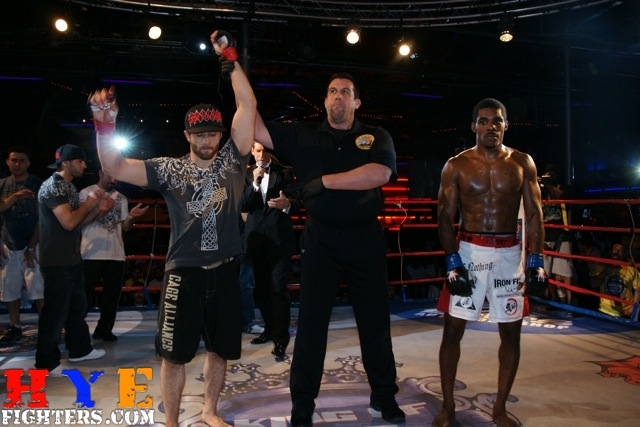 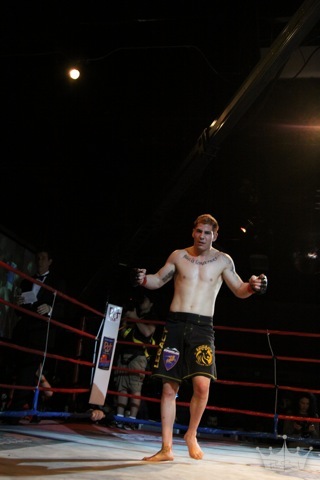 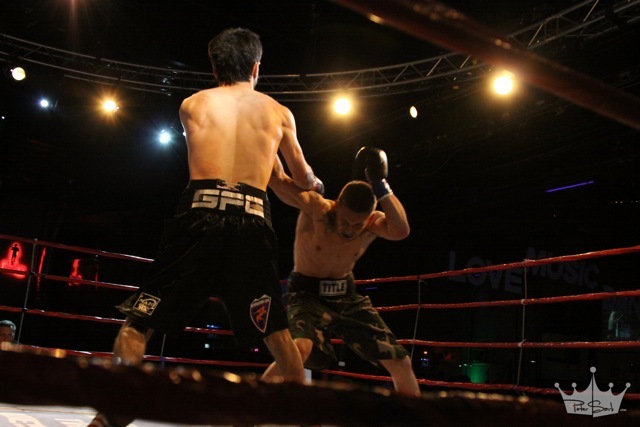 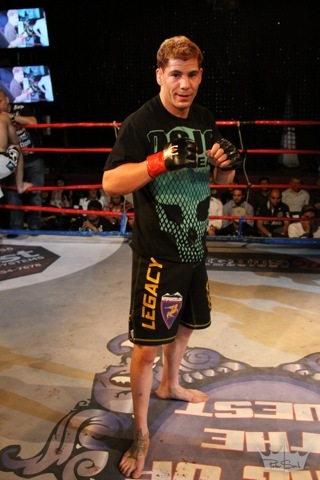 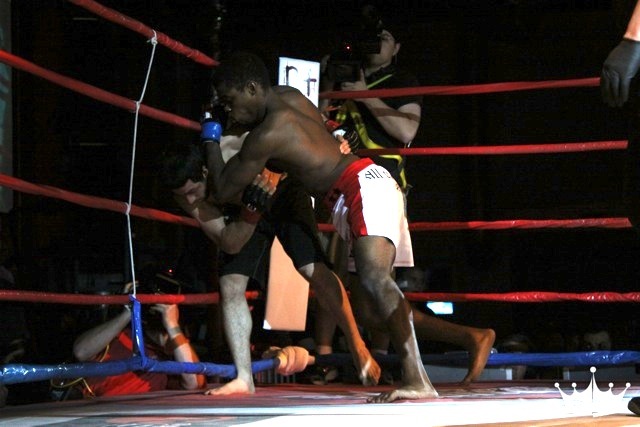 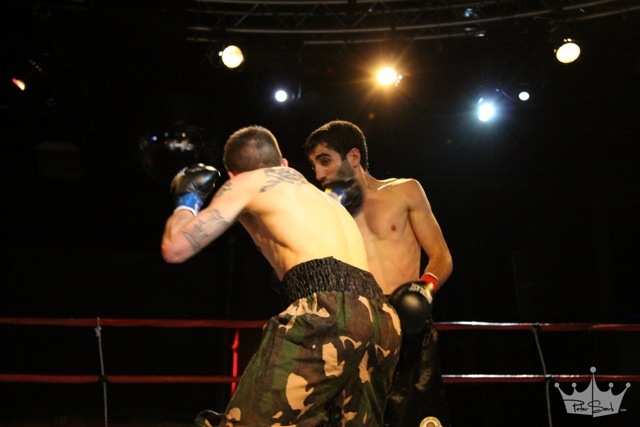 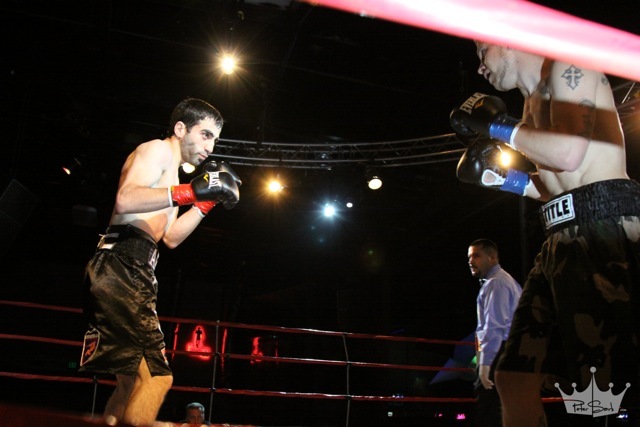 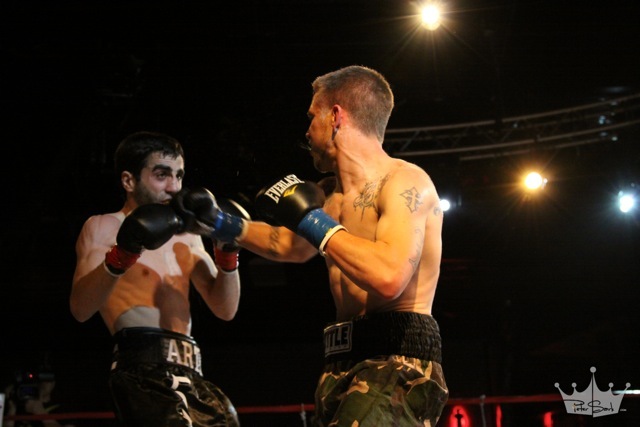 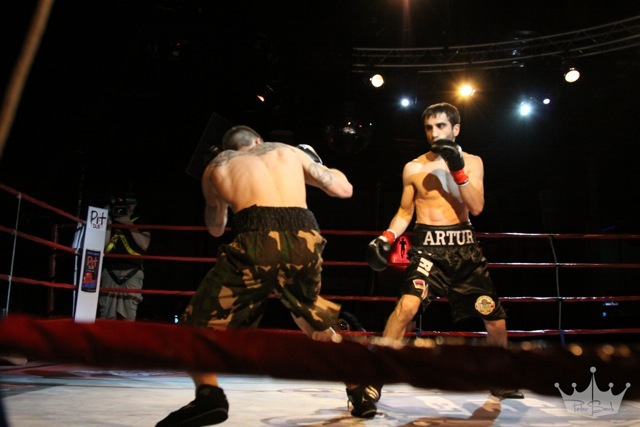 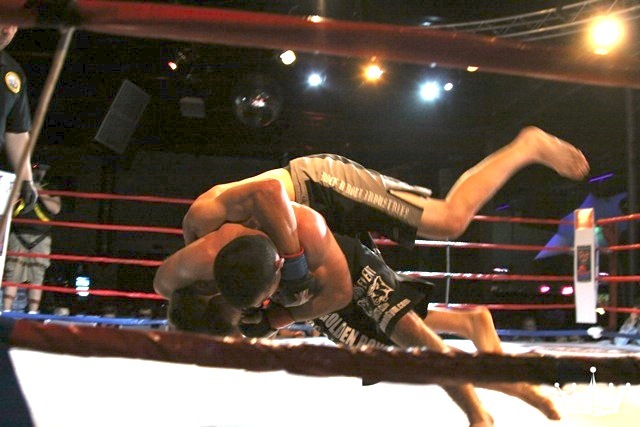 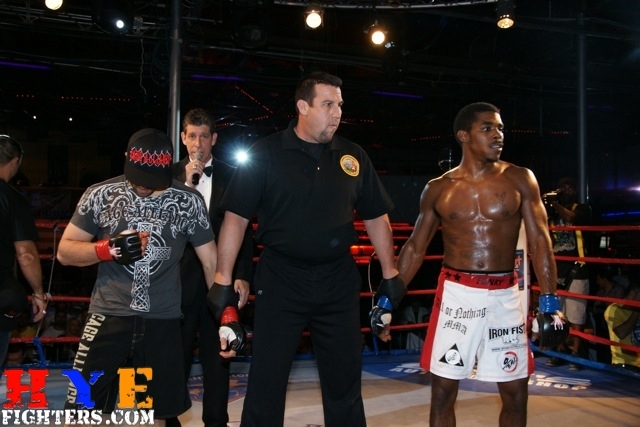 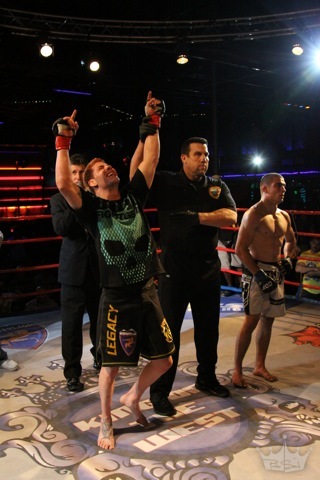 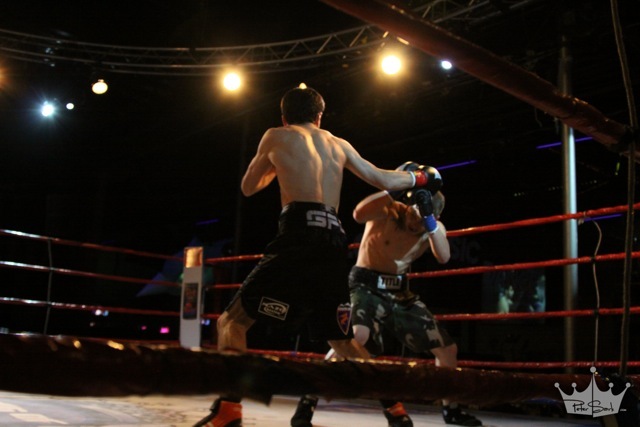 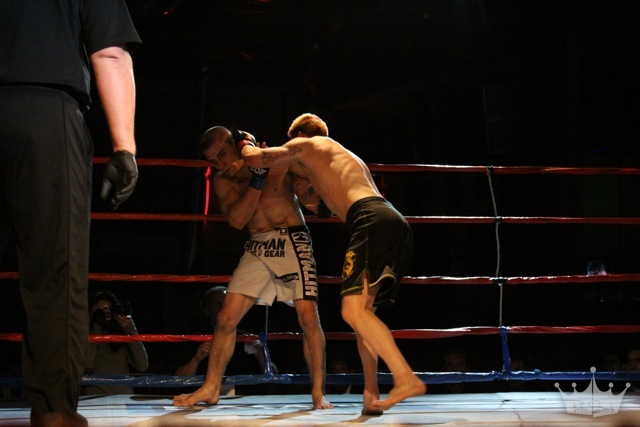 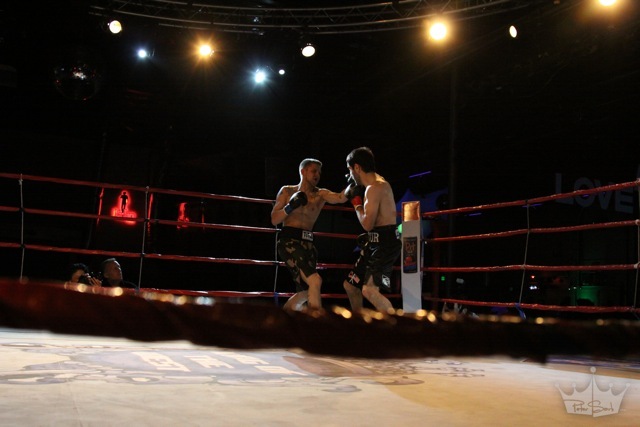 In the night’s first fight, a bantamweight (135) MMA bout, the 20-year-old Tsaturyan, fighting out of Main Event, won a unanimous decision against Chris Wolff (0-4). 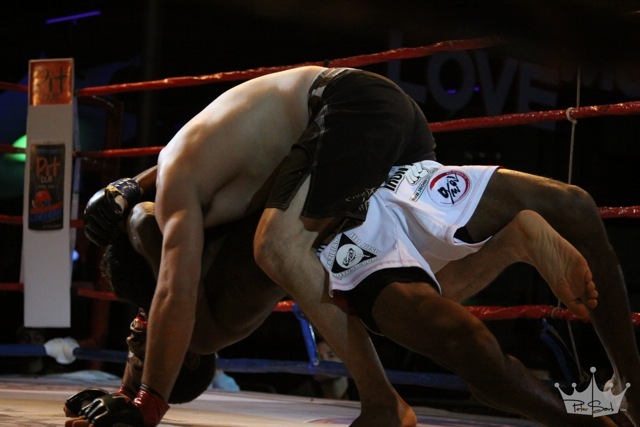 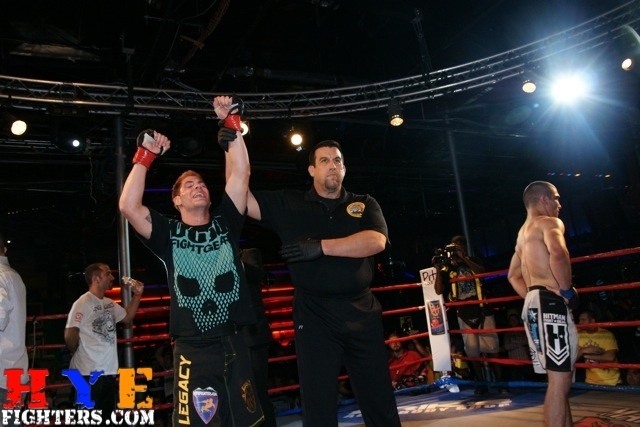 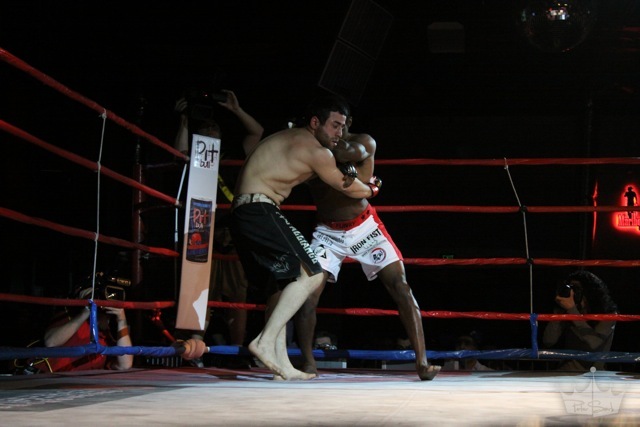 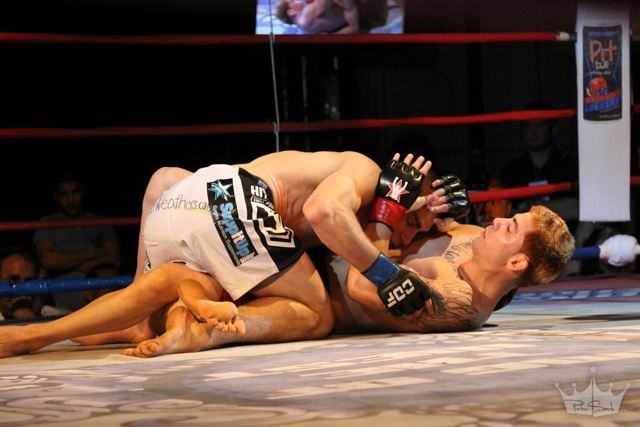 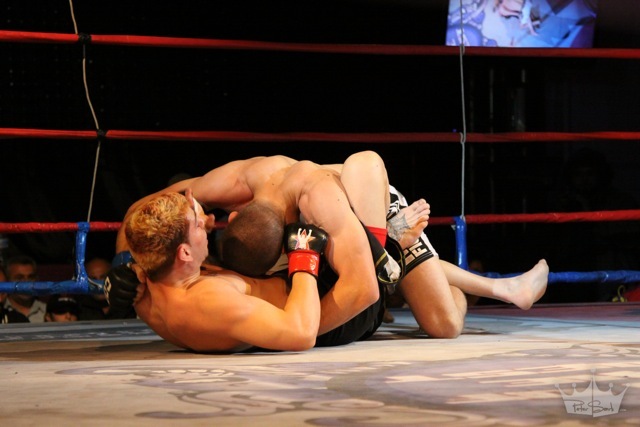 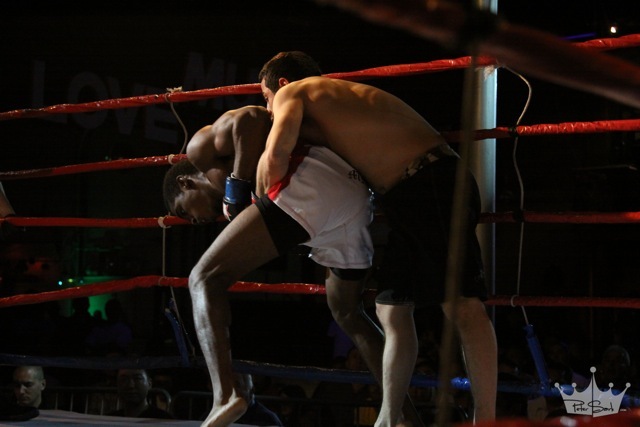 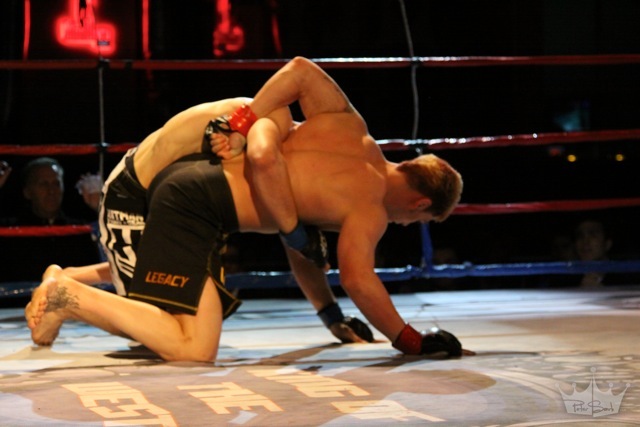 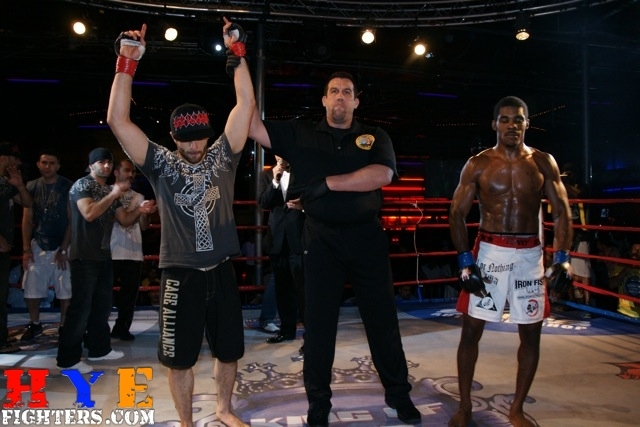 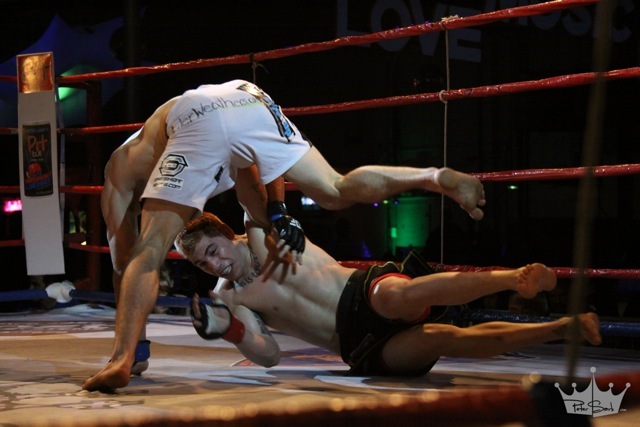 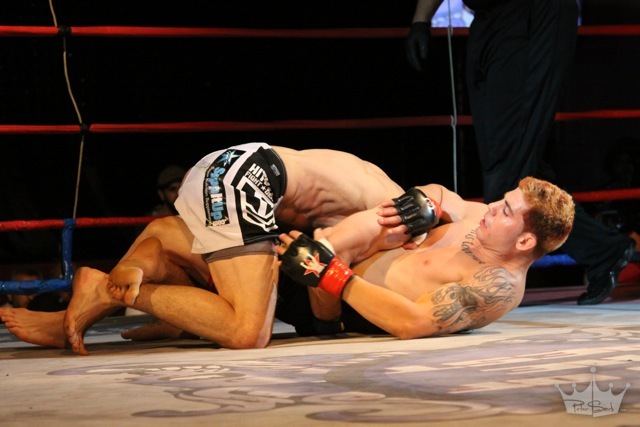 Tsaturyan earned scores of 30-27 twice and 29-28 for the decision, as he used multiple takedowns in each round, including an unconventional headlock takedown in the third, to secure the win. 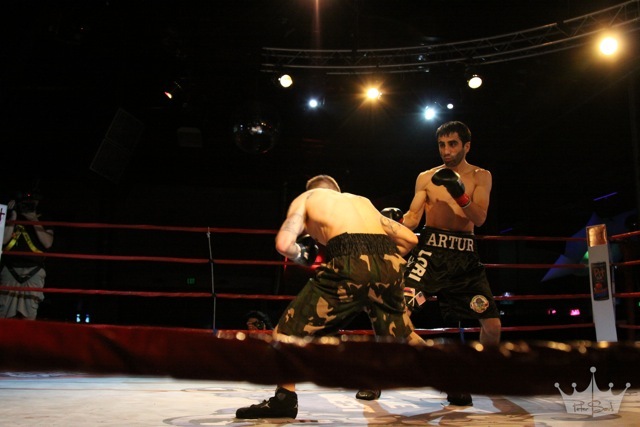 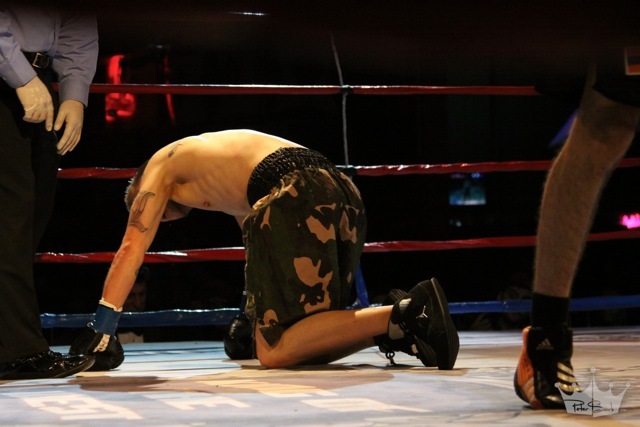 The only round in jeopardy was the first, in which the majority of the round was controlled by Tsaturyan, but he was floored by a left hook, only to quickly get back up. 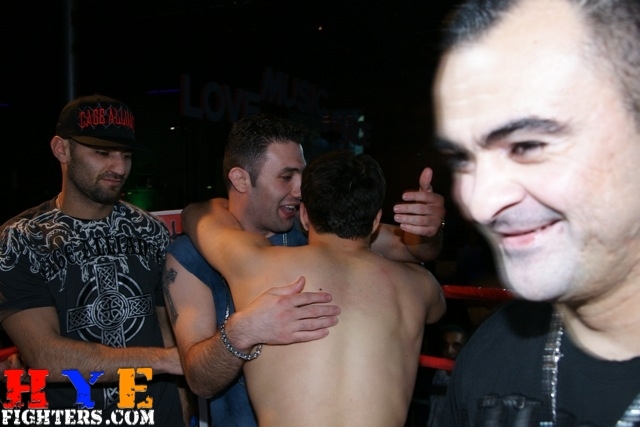 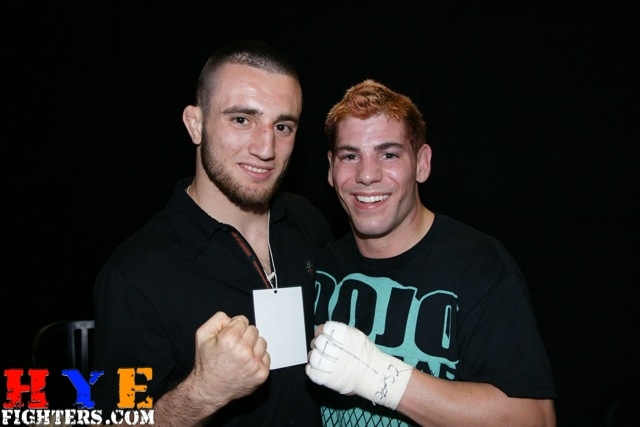 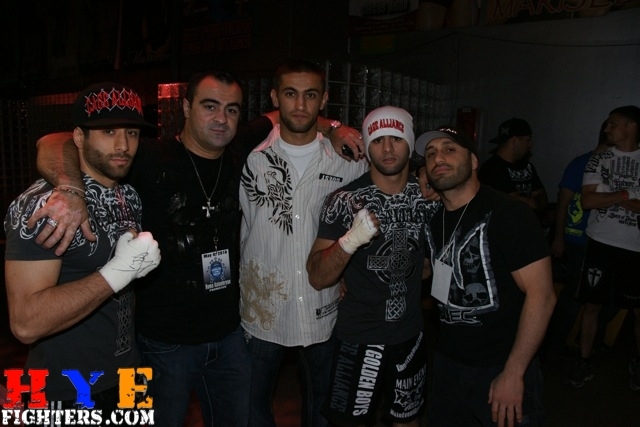 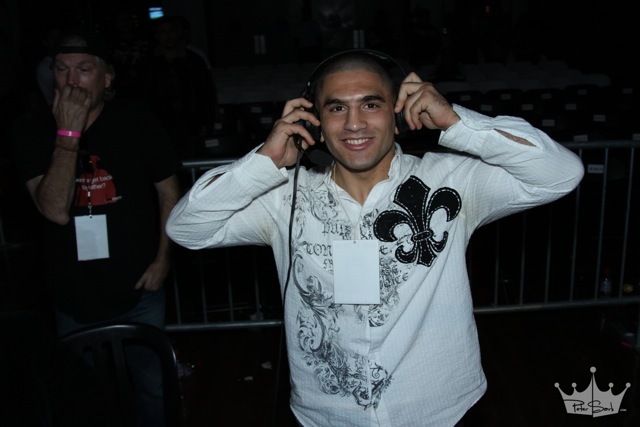 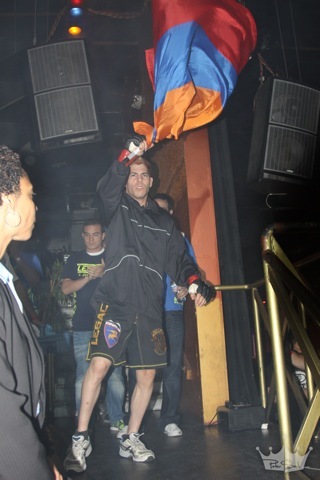 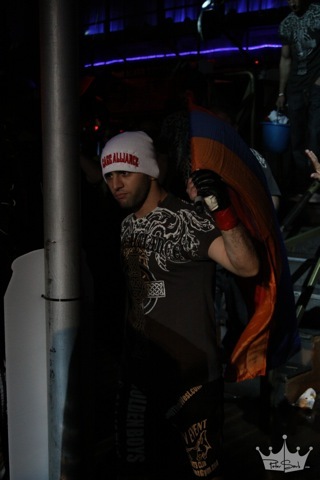 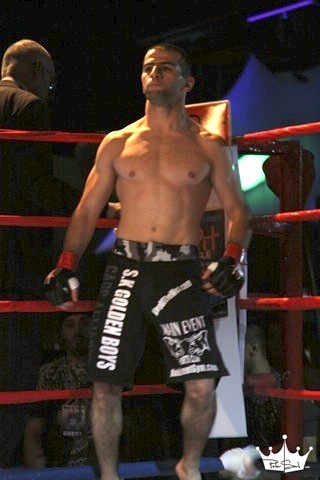 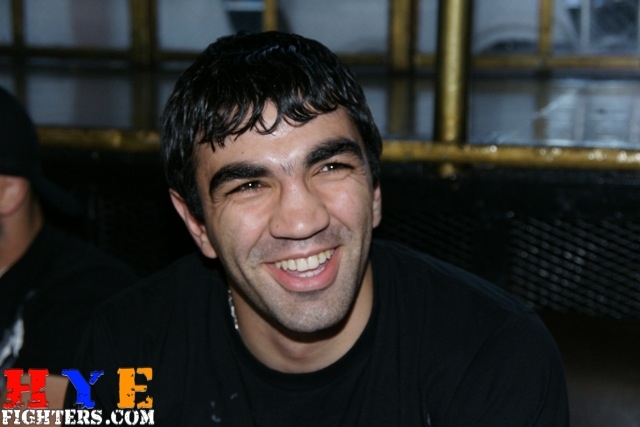 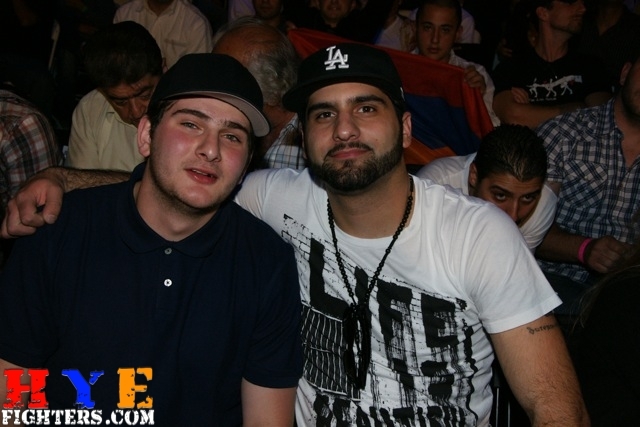 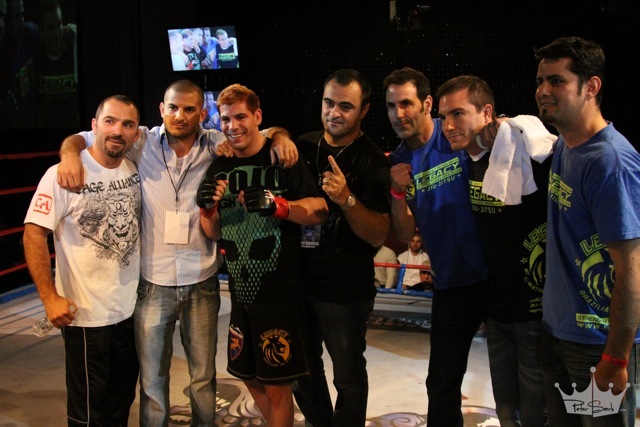 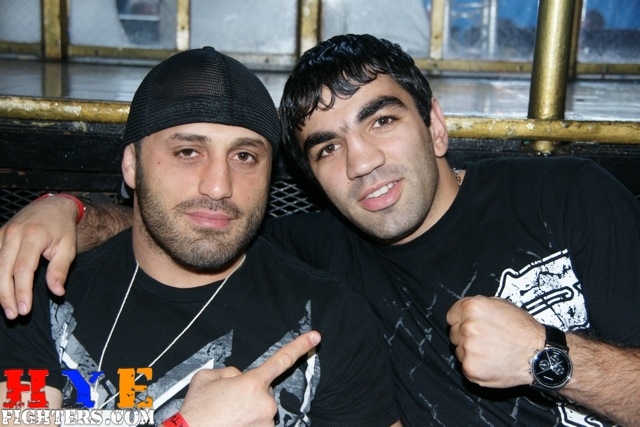 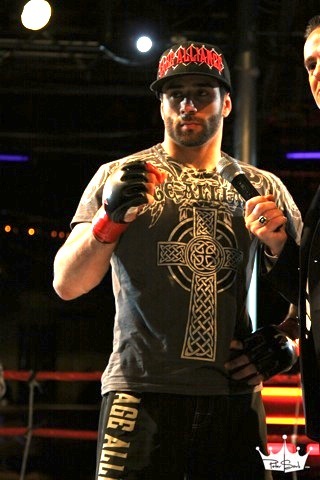 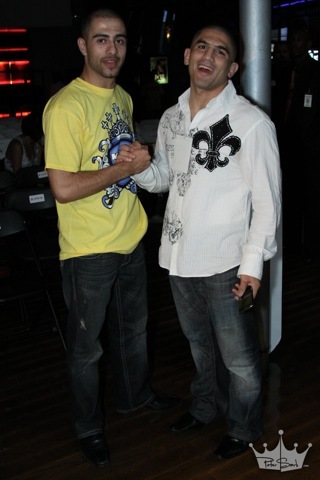 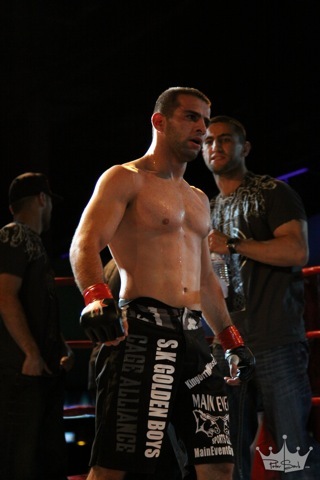 Tsaturyan’s training partner, Dermenjyan (3-1), who trains out of Main Event, Team Hayastan in Hollywood and SK Golden Boys in Van Nuys, rebounded from his first career loss in his last fight with a first-round submission win over Jason Williams (1-2). 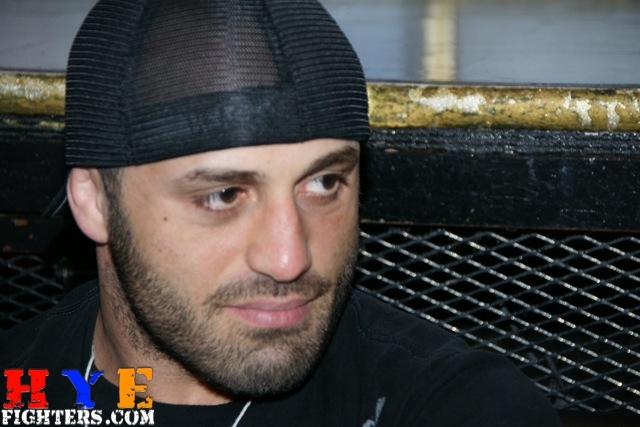 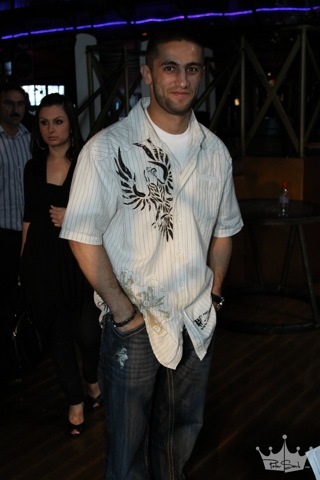 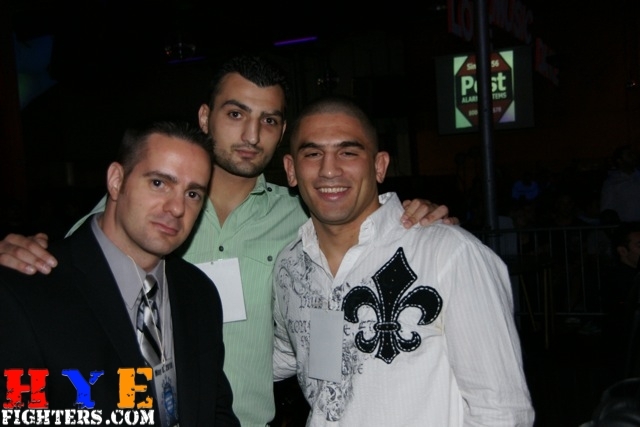 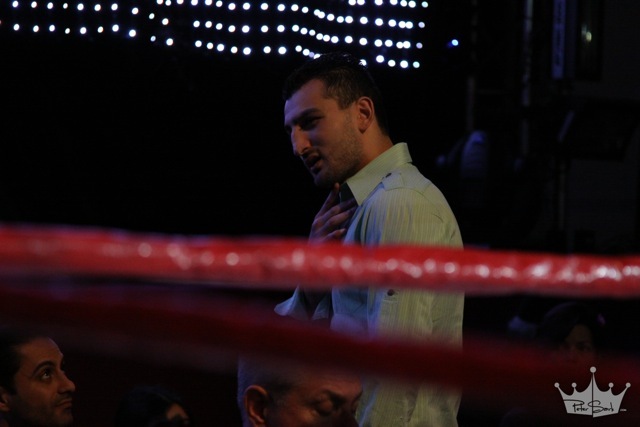 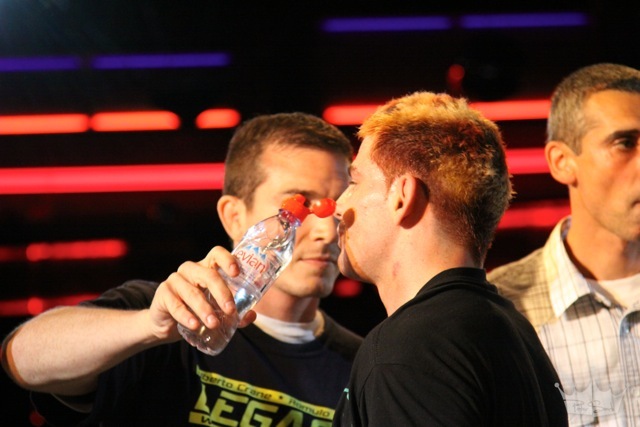 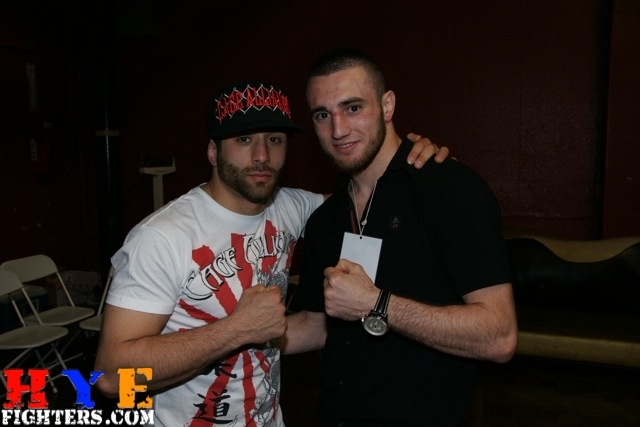 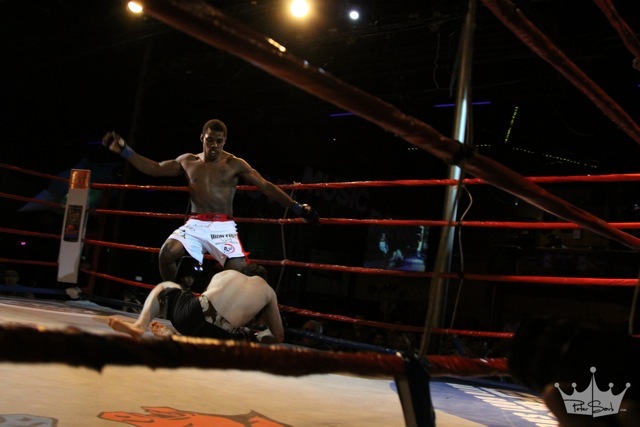 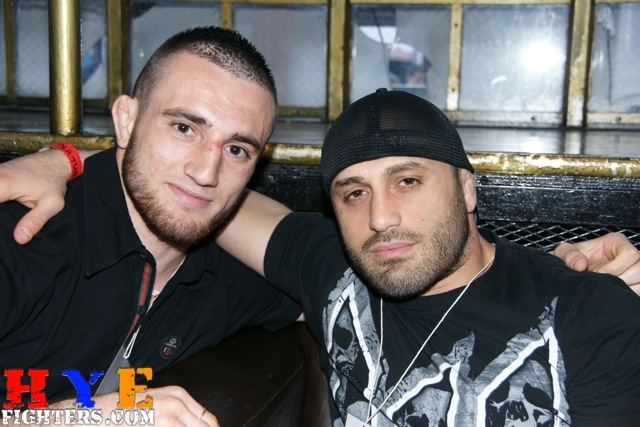 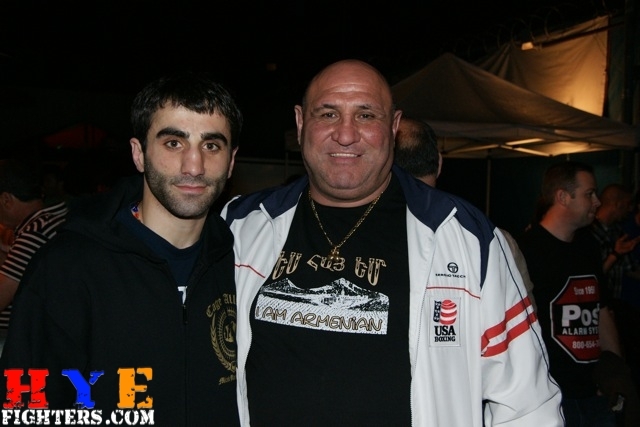 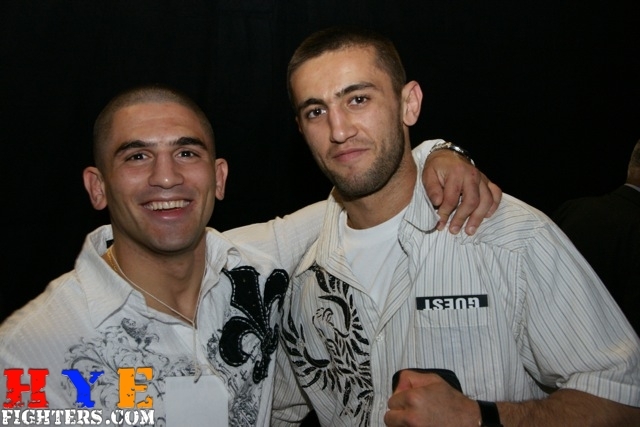 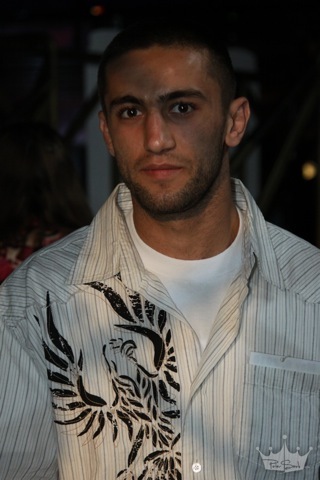 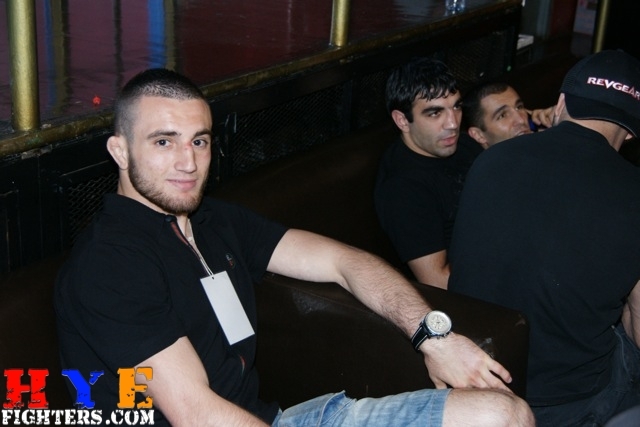 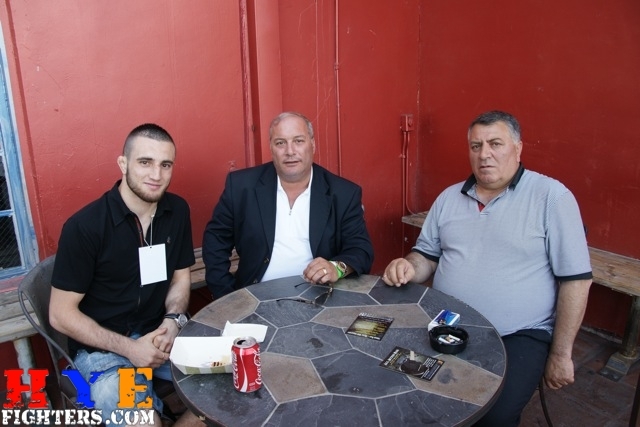 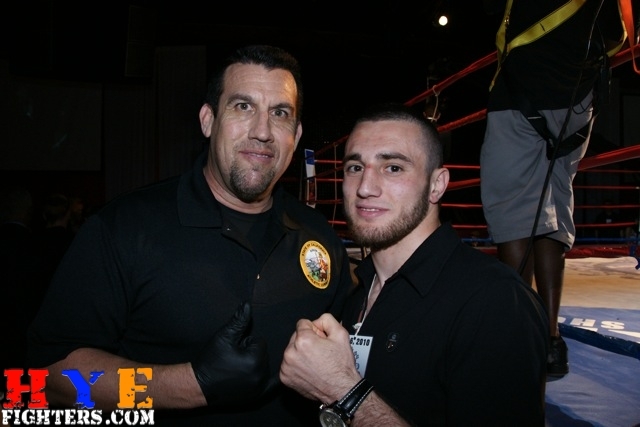 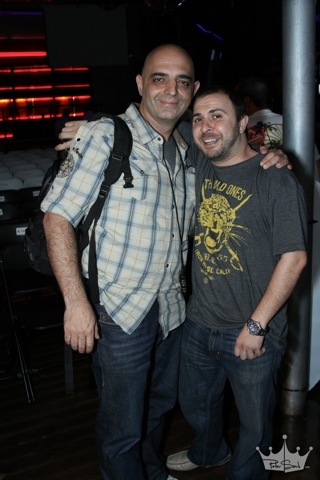 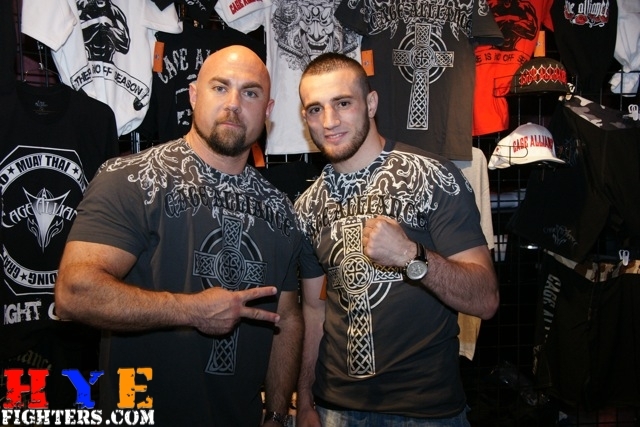 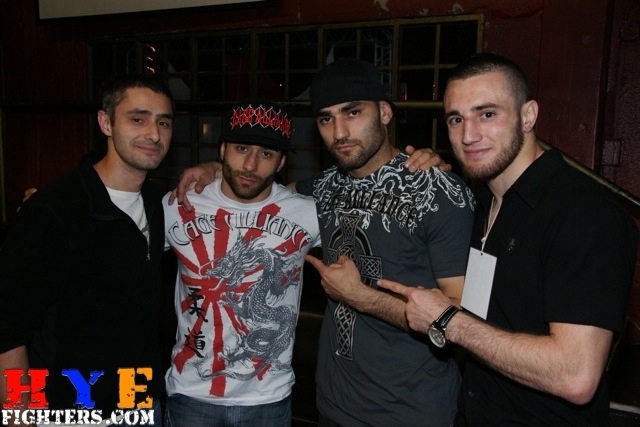 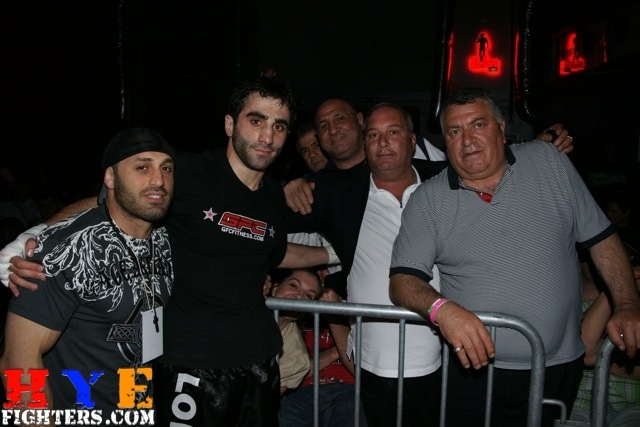 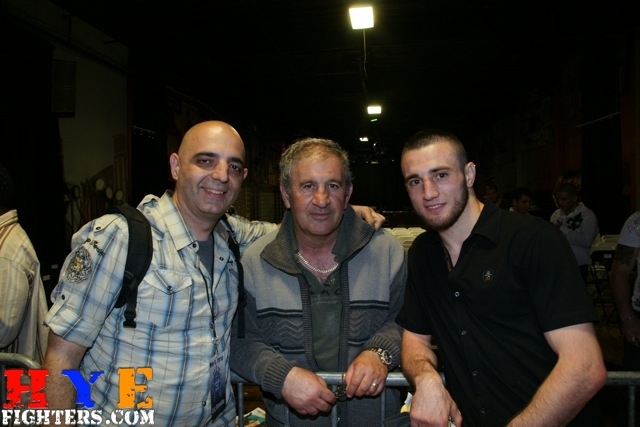 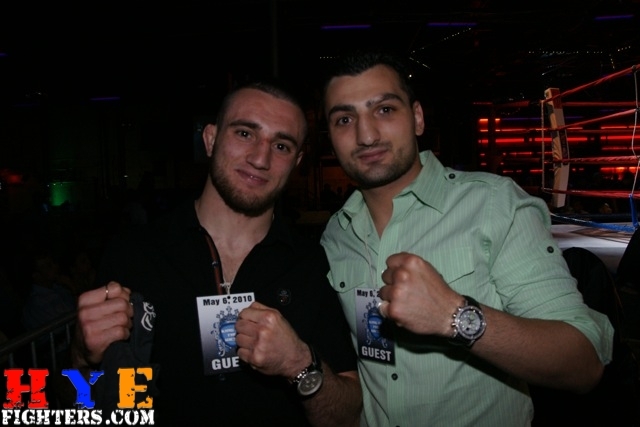 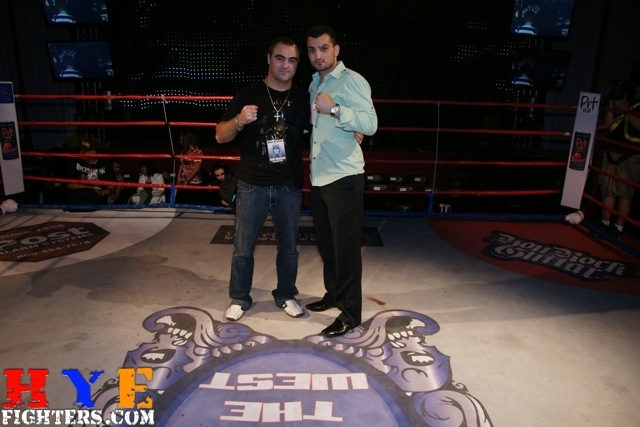 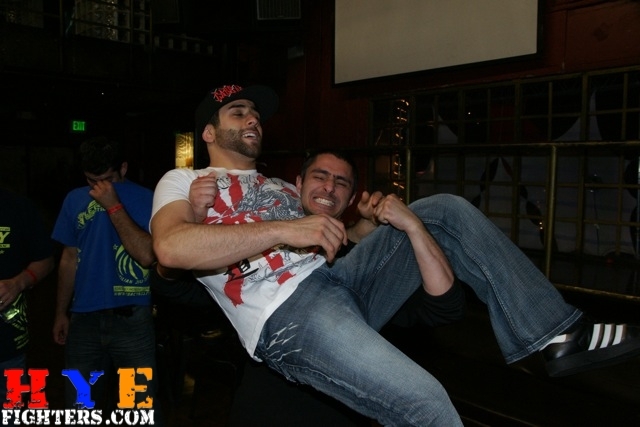 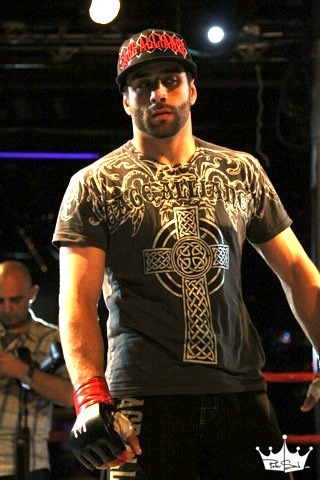 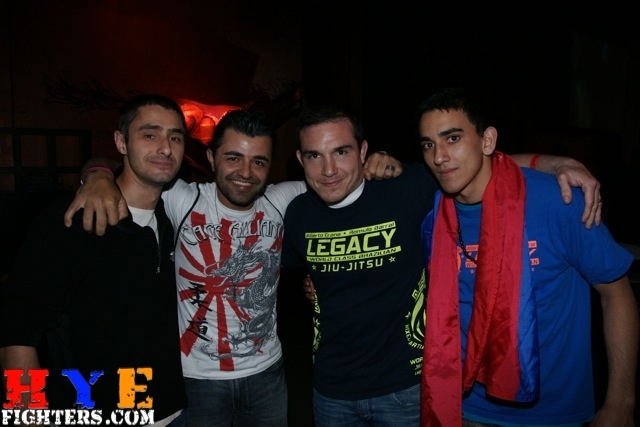 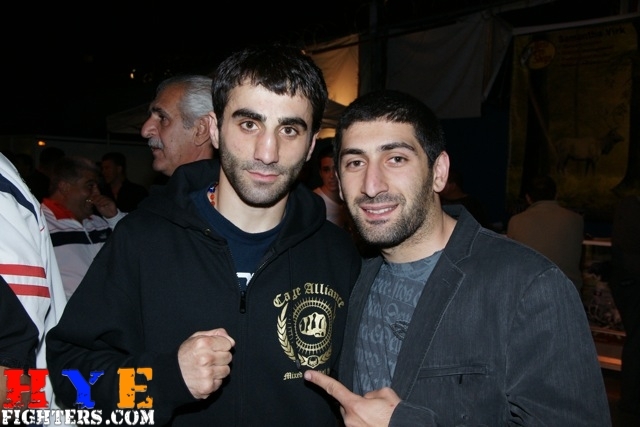 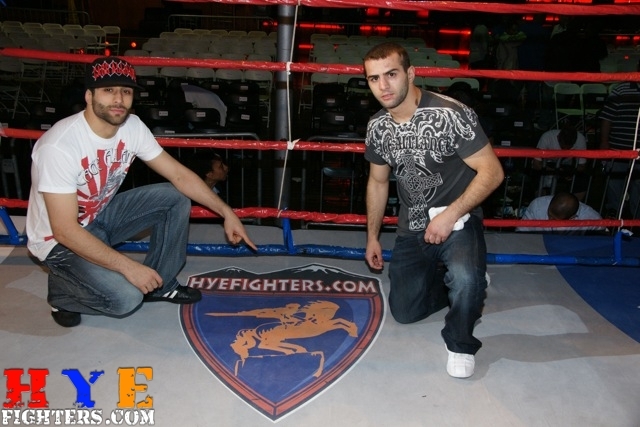 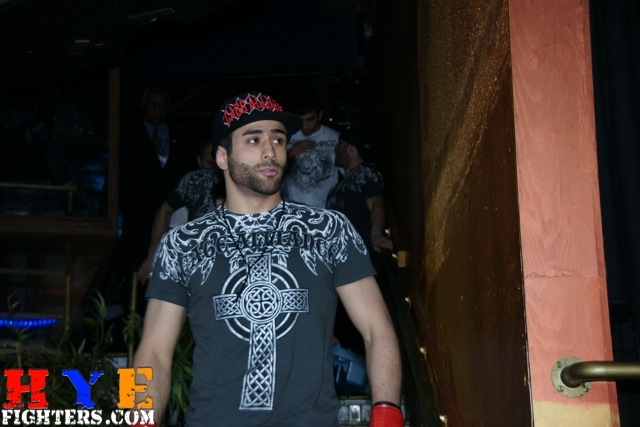 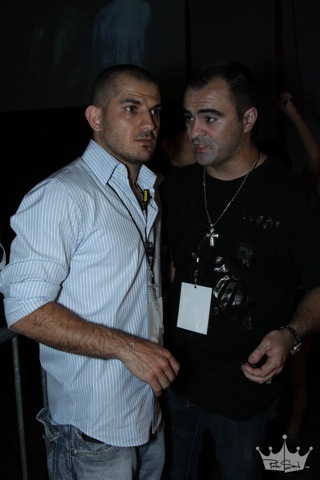 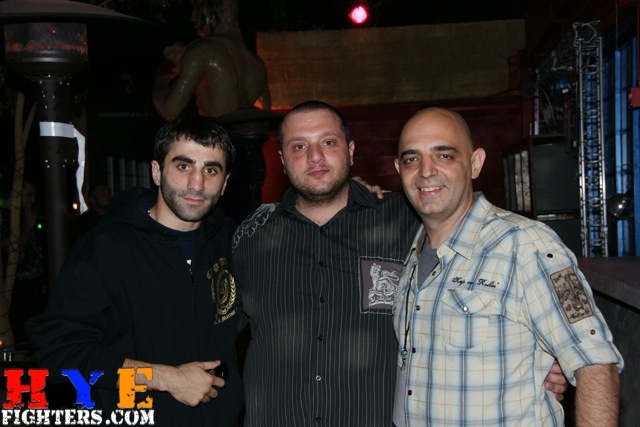 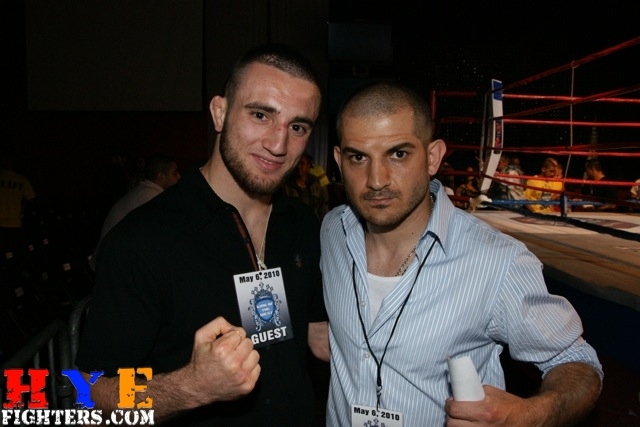 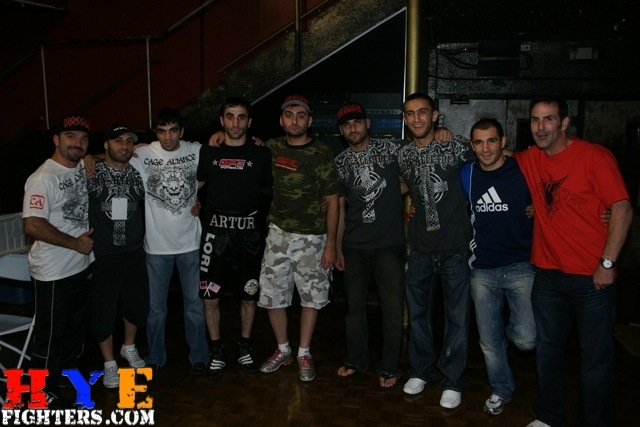 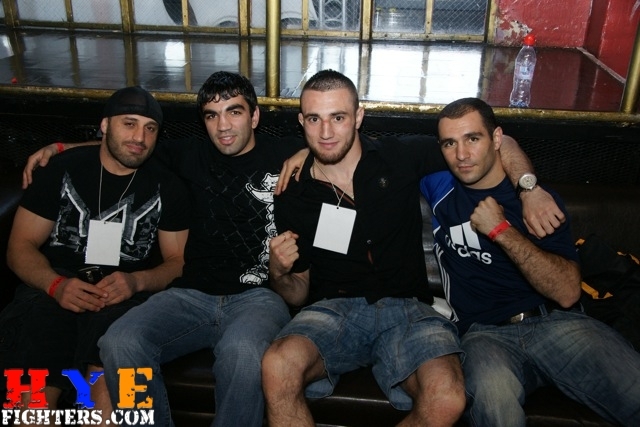 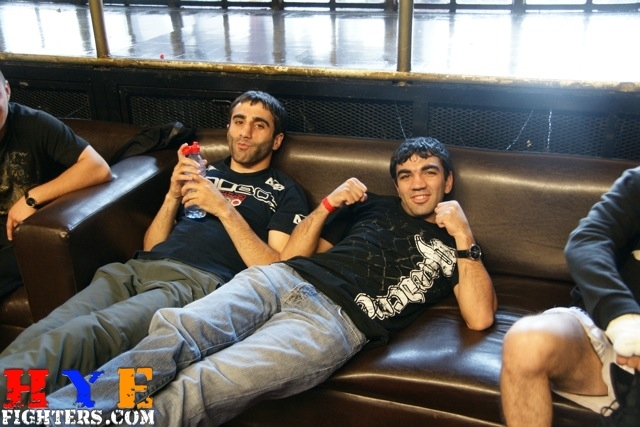 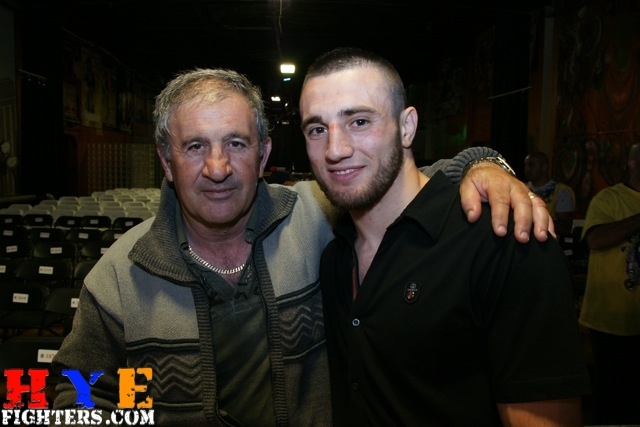 Having exhibited marked improvement in the third bout of his career, Dermenjyan went back to basics and worked for a takedown from the start. 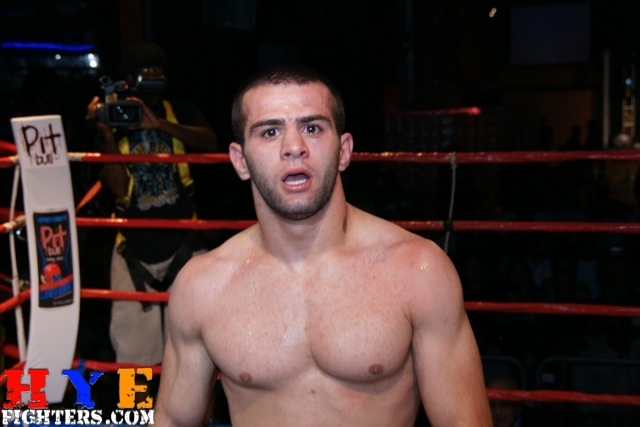 Dermenjyan burst forward with an overhand right that missed and shot in for a takedown, grabbing Williams’ ankle. 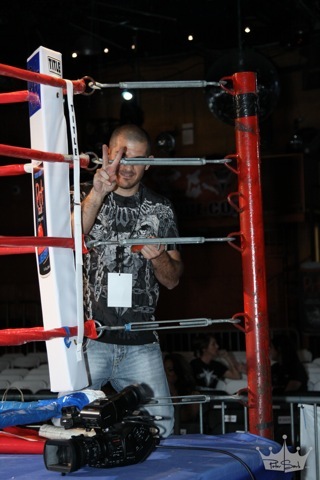 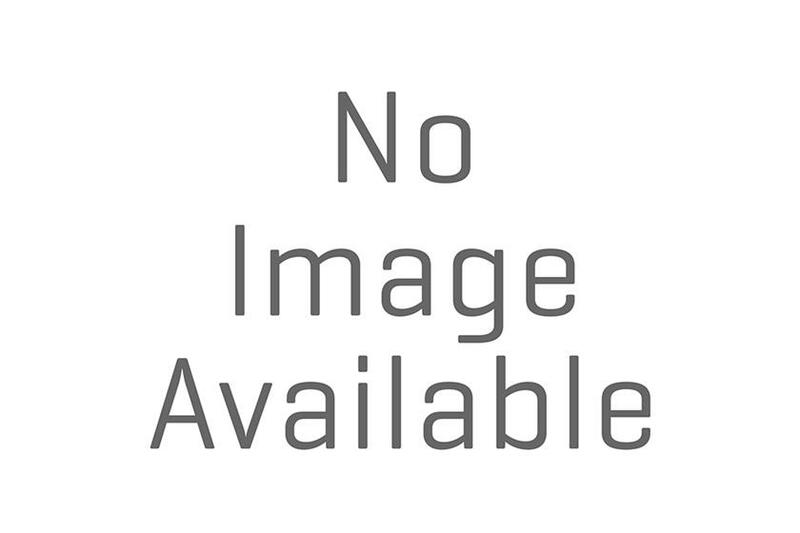 During a subsequent scramble, Dermenjyan, actually bounced up and off the bottom ring rope. 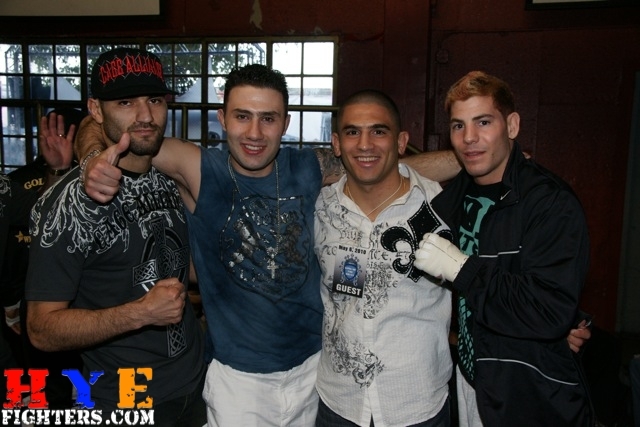 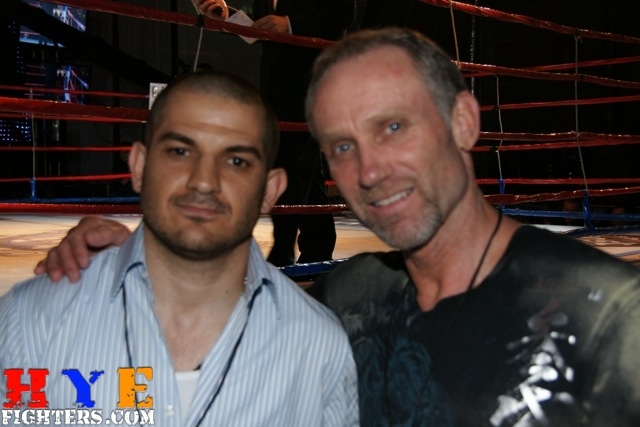 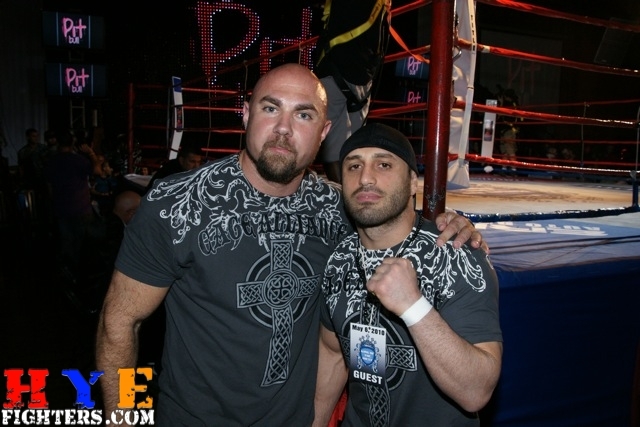 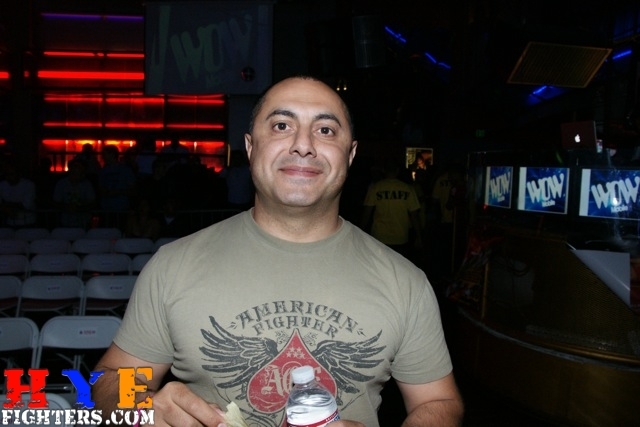 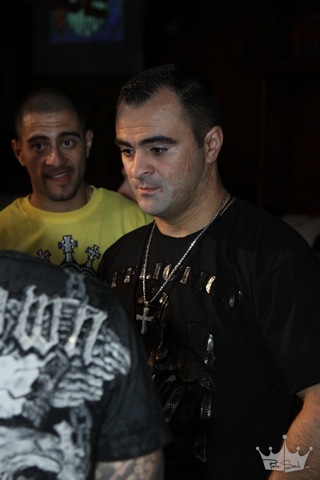 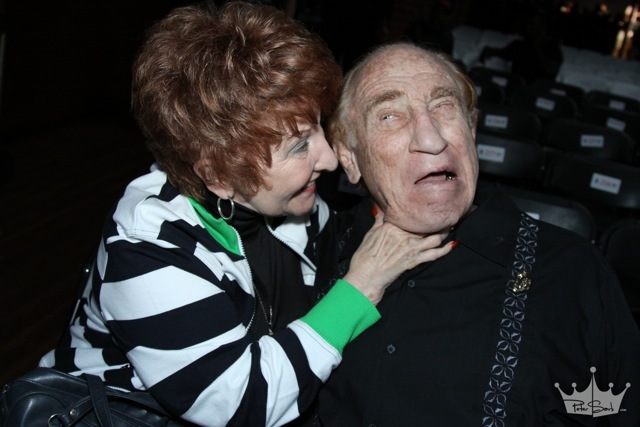 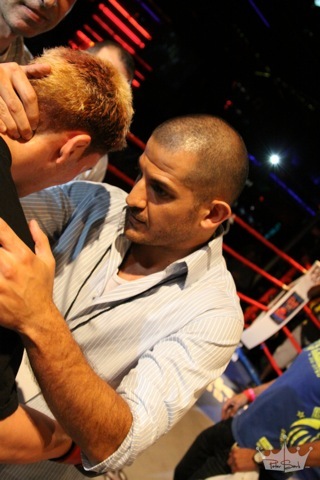 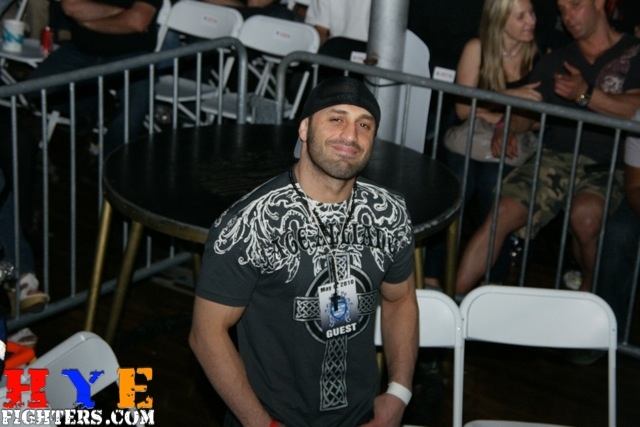 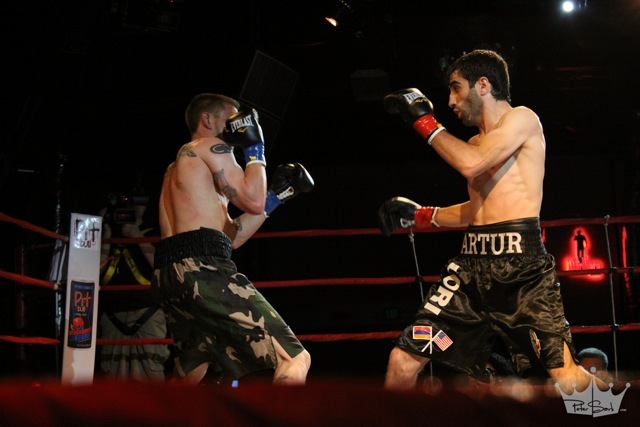 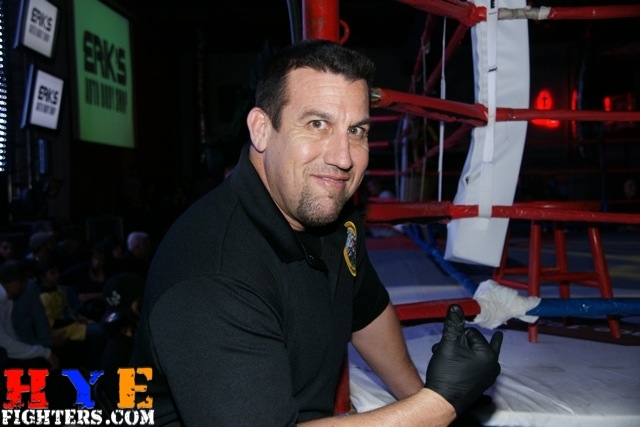 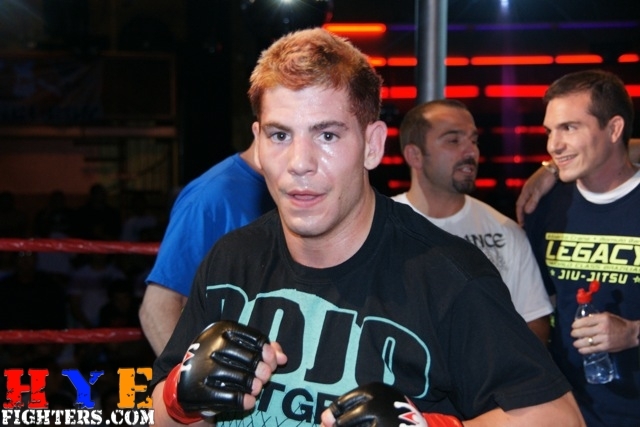 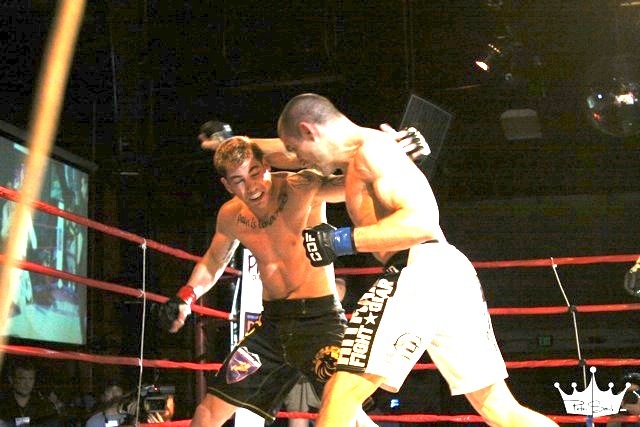 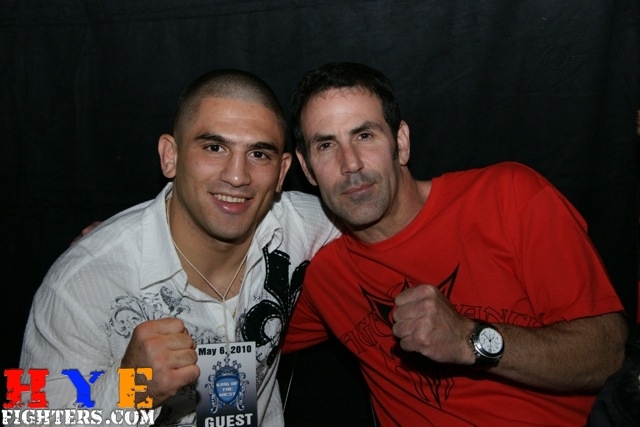 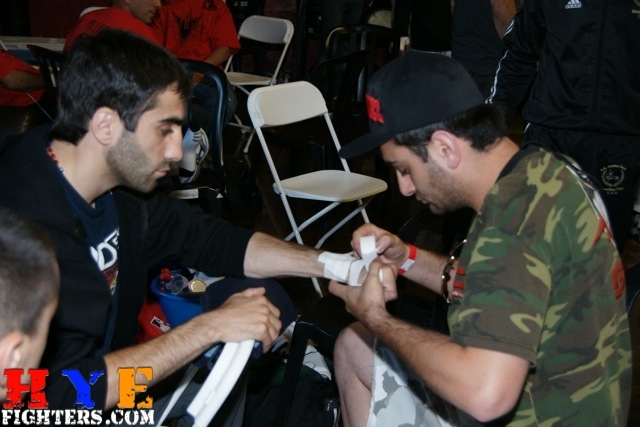 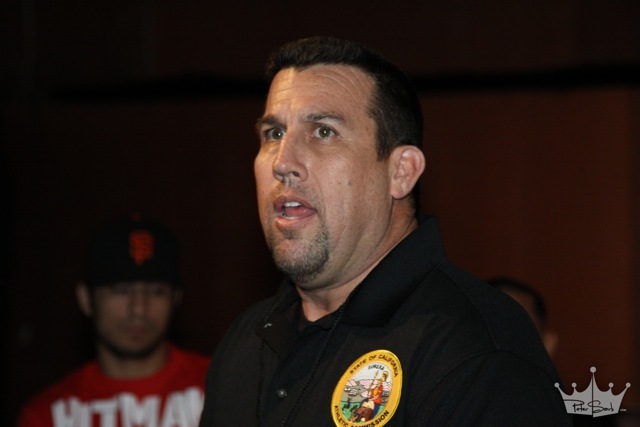 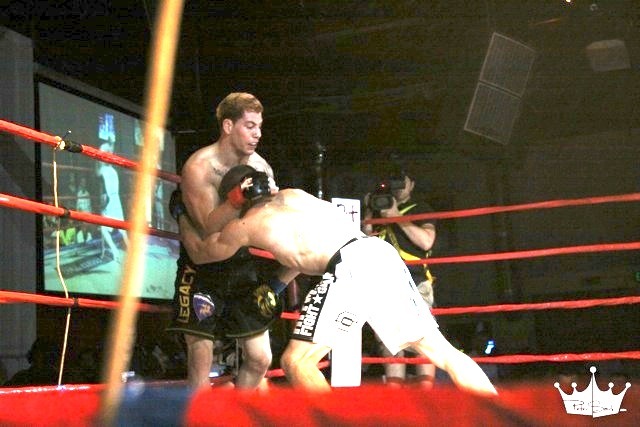 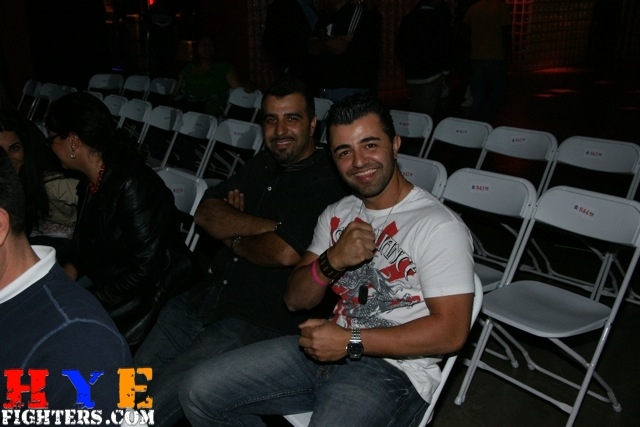 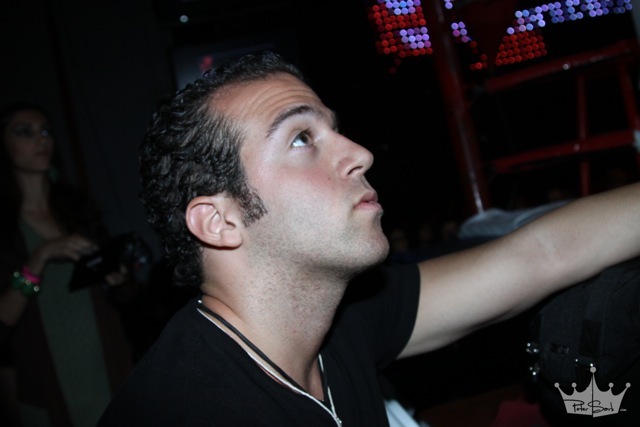 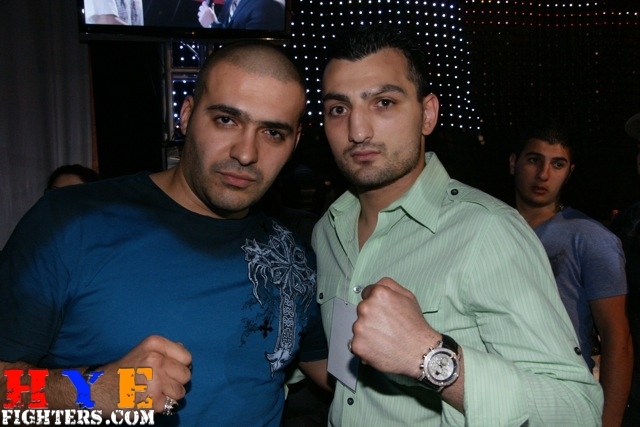 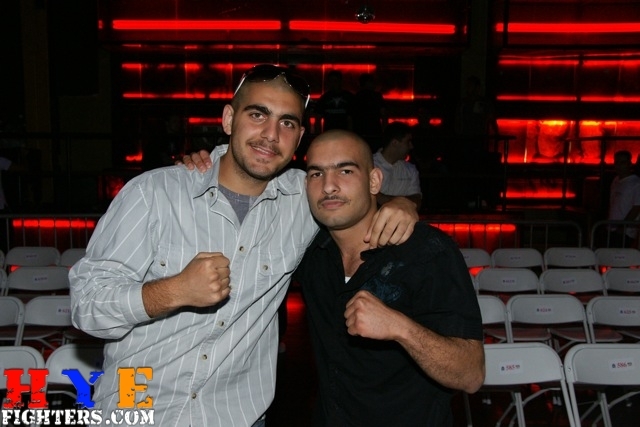 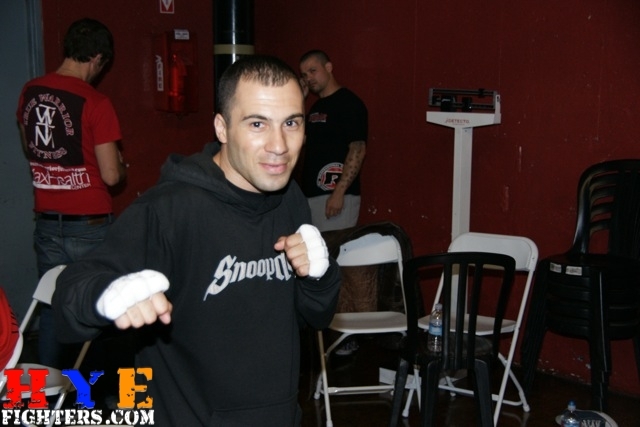 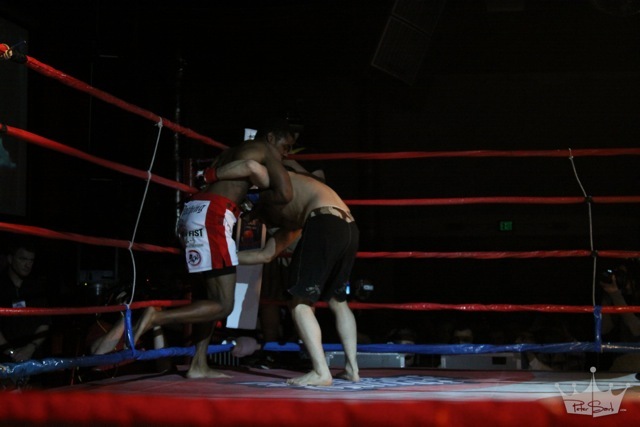 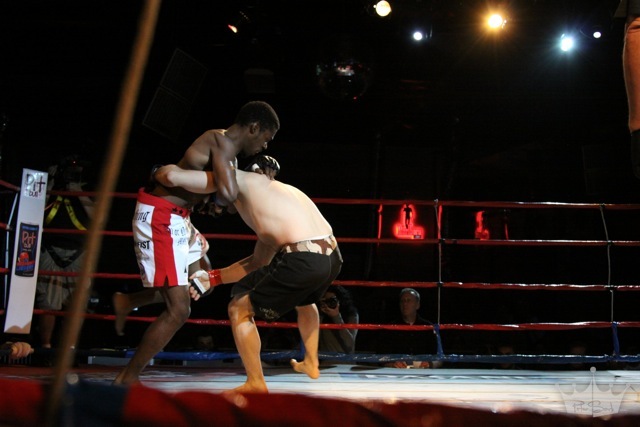 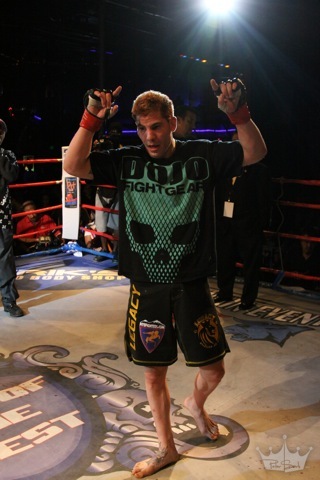 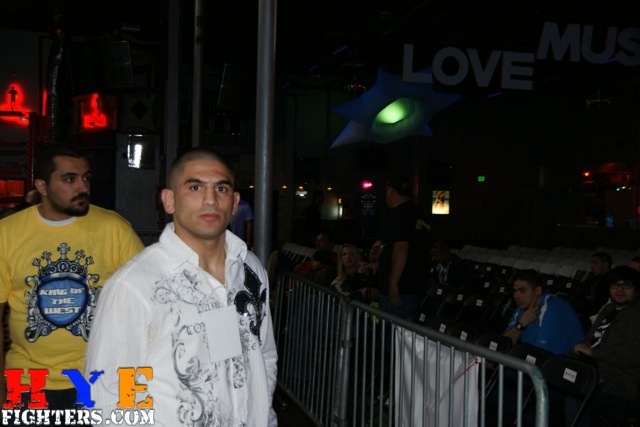 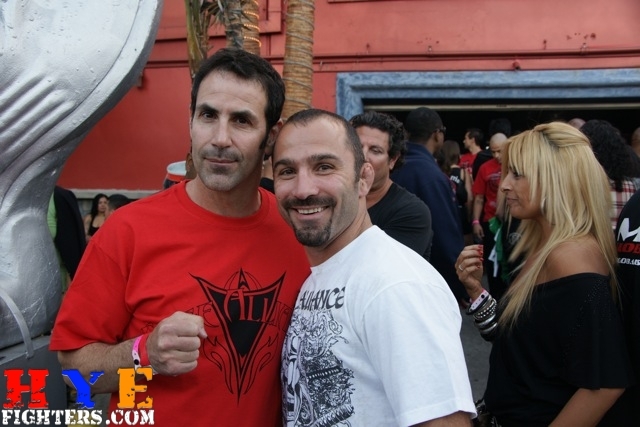 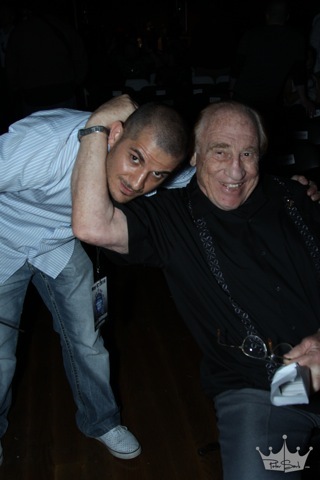 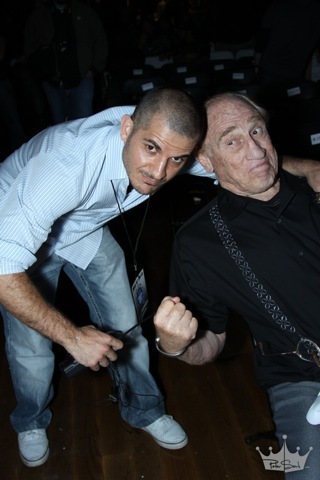 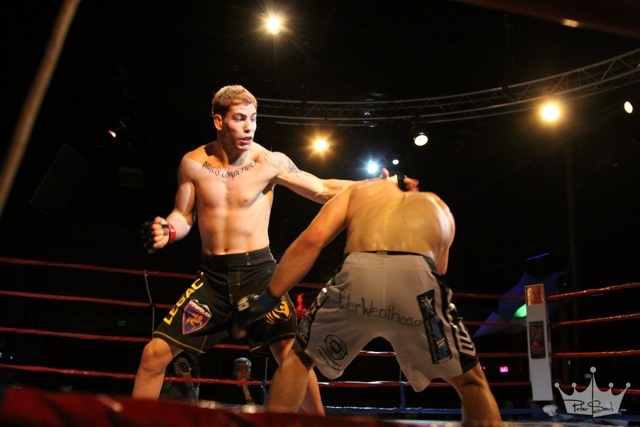 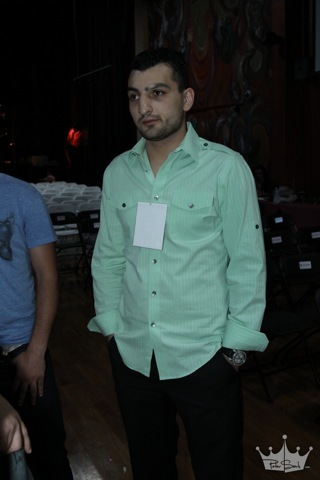 During a lockup later on, Dermenjyan was dealt a dose of knees to the face, one in particular that the Van Nuys fighter admitted “rocked” him. 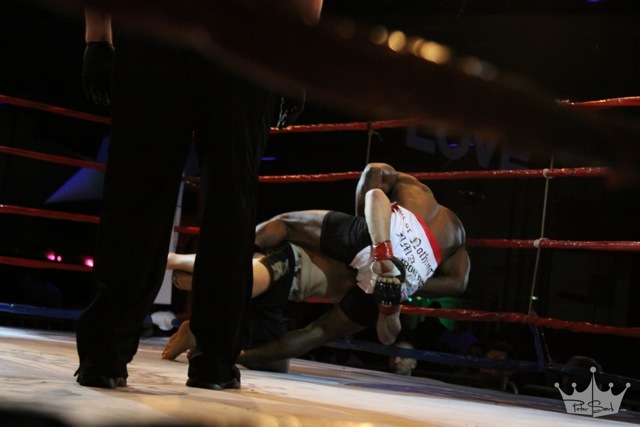 After changing levels numerous times, Dermenjyan twisted Williams down to the ground. 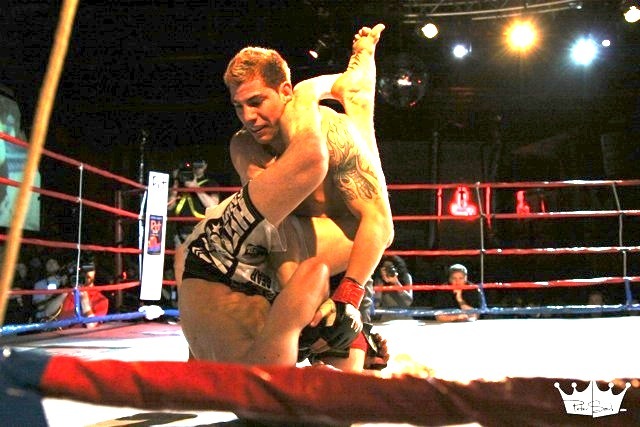 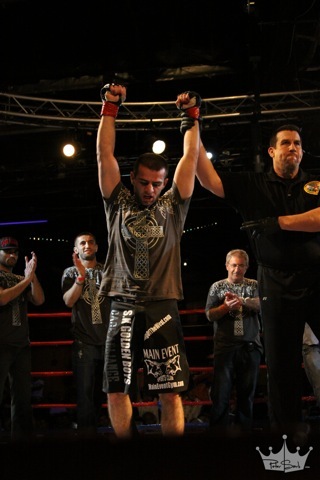 Williams tried to posture up and turned and Dermenjyan took his back, putting his hooks in, landing a solid punch and slipping in a rear-naked choke that solicited a tapout at 2:54 of the opening round, just six seconds before the bell. 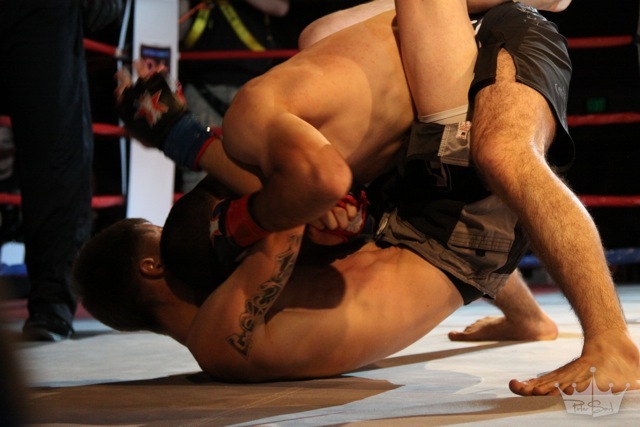 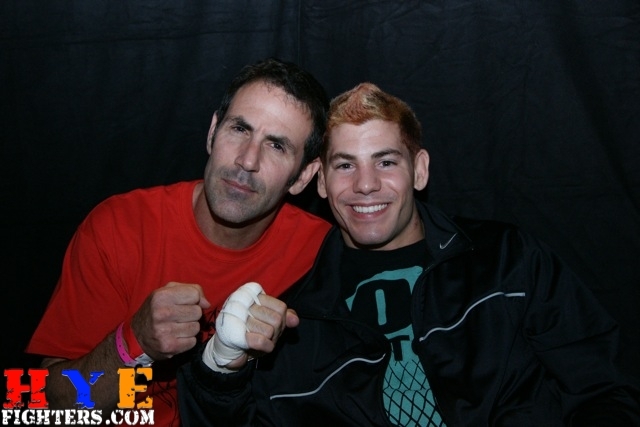 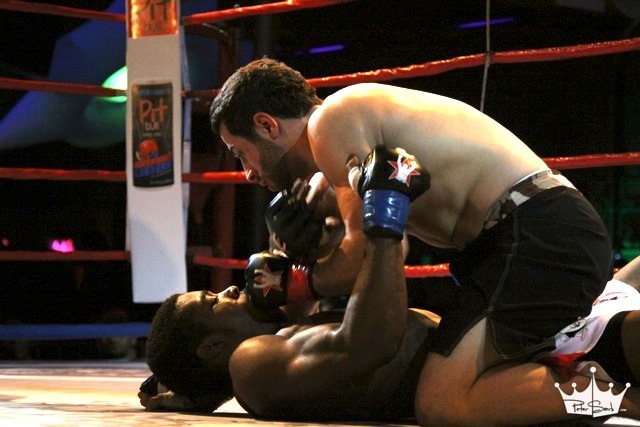 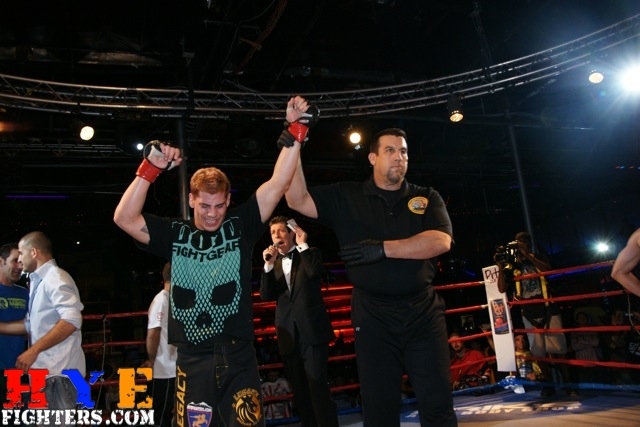 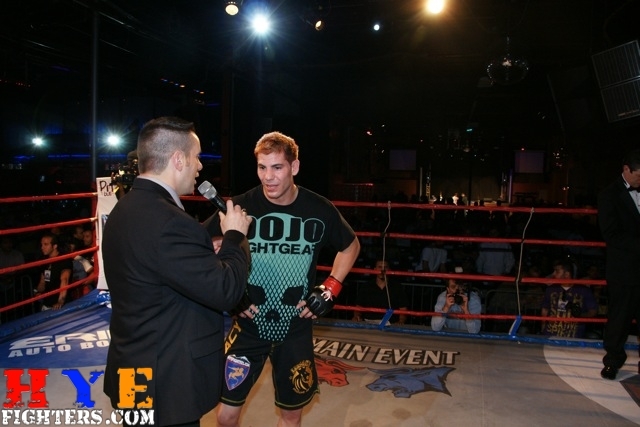 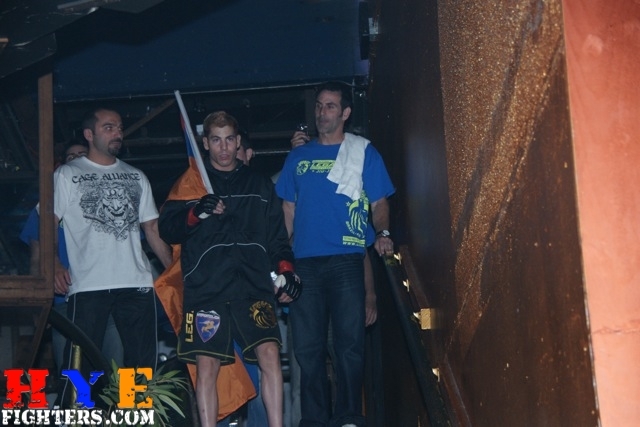 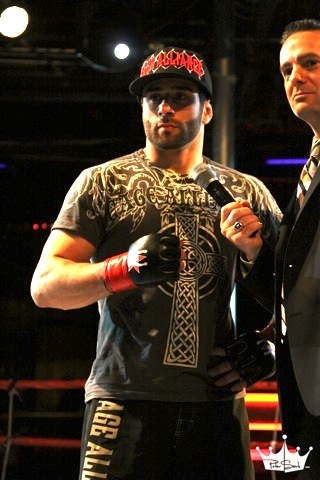 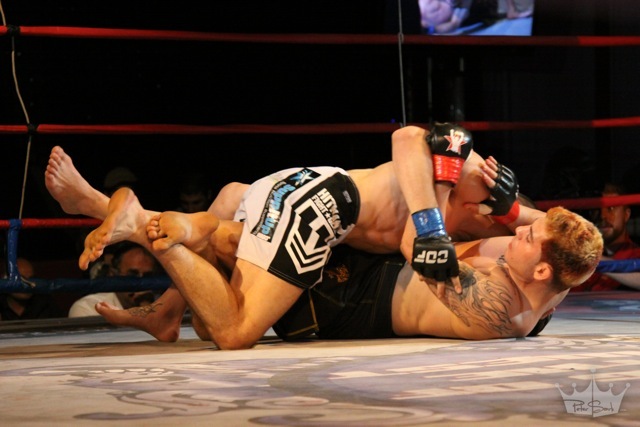 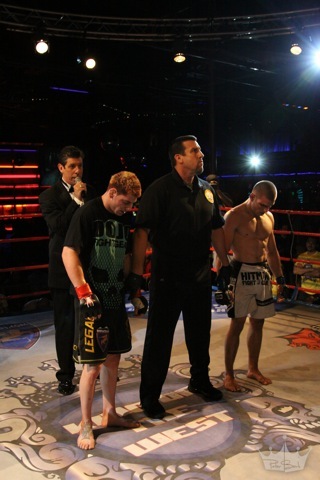 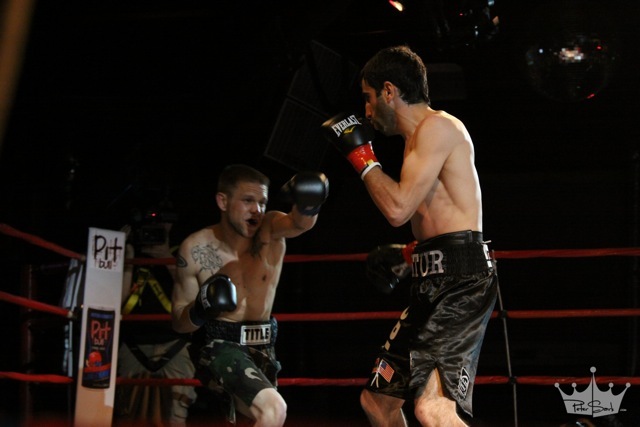 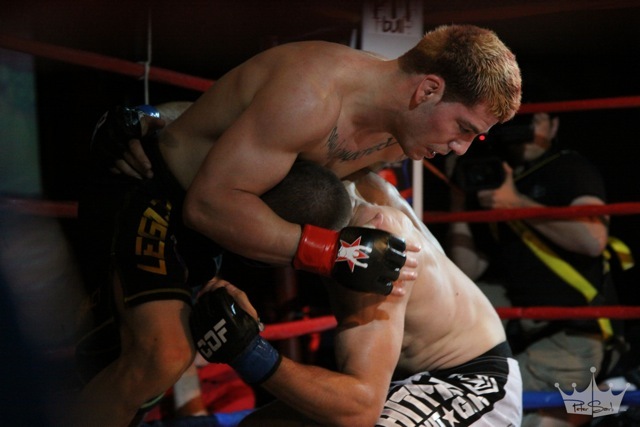 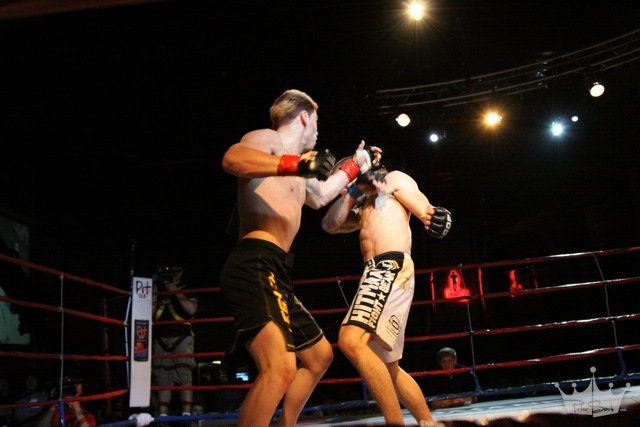 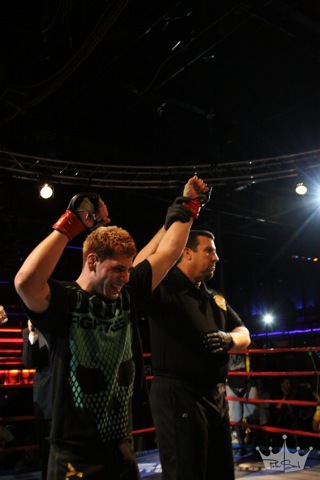 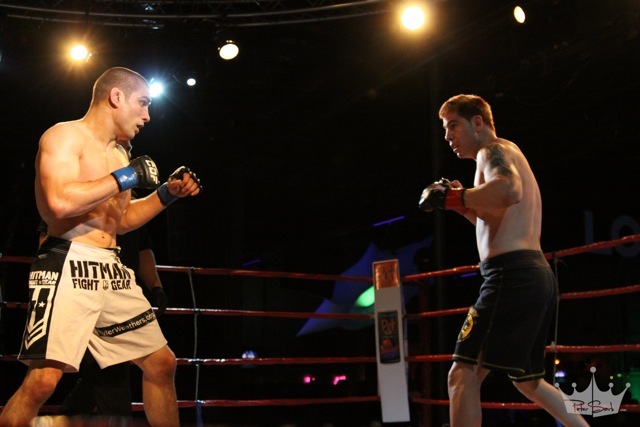 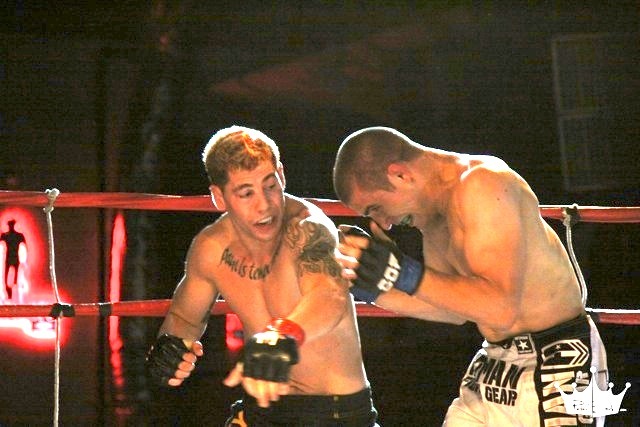 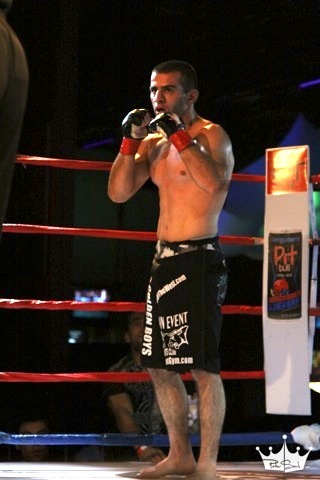 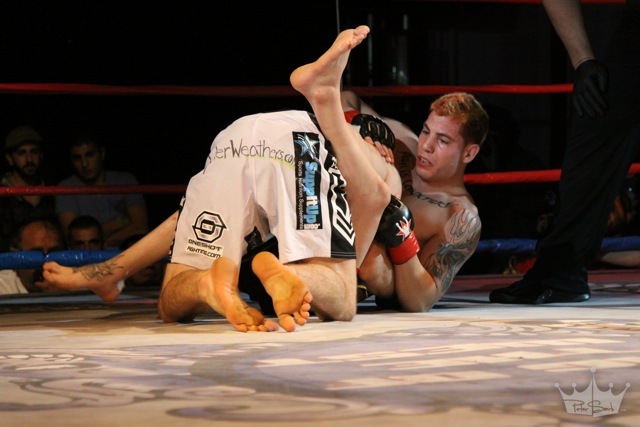 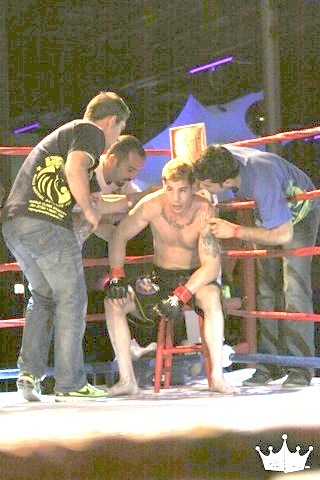 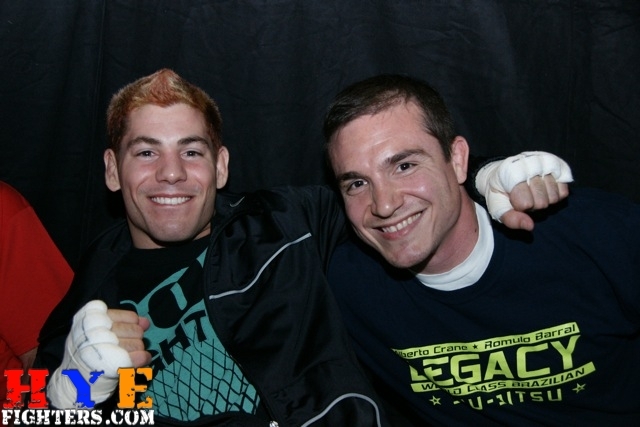 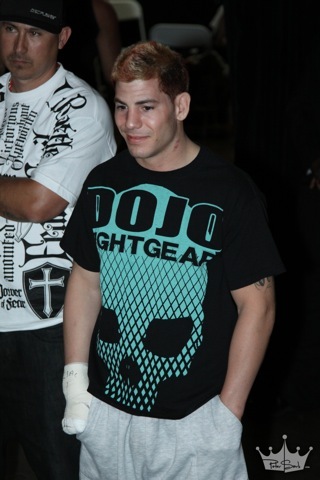 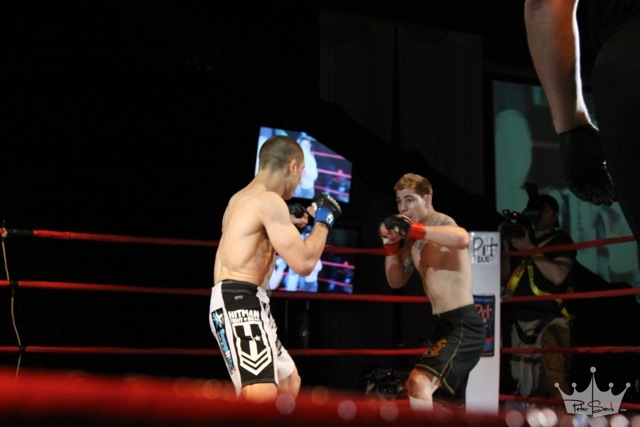 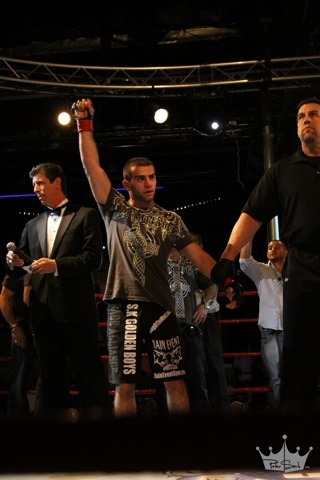 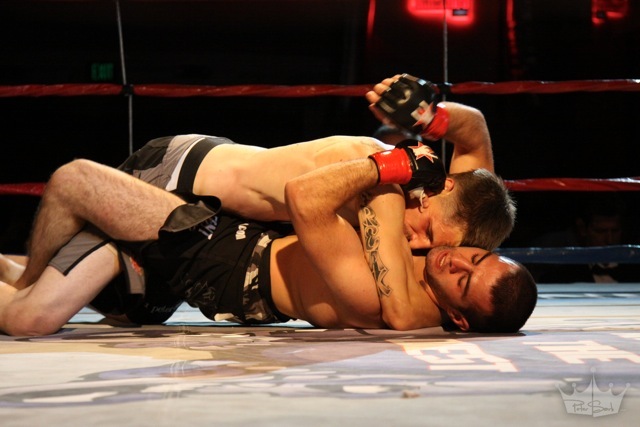 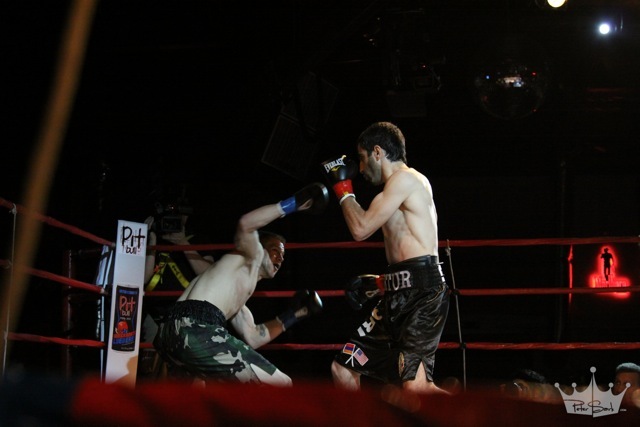 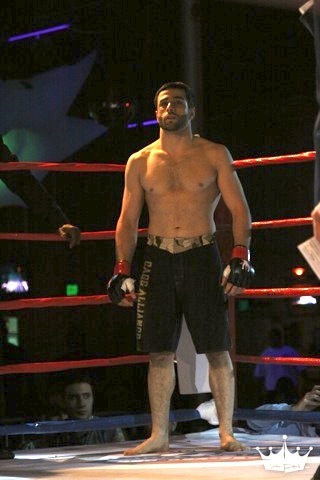 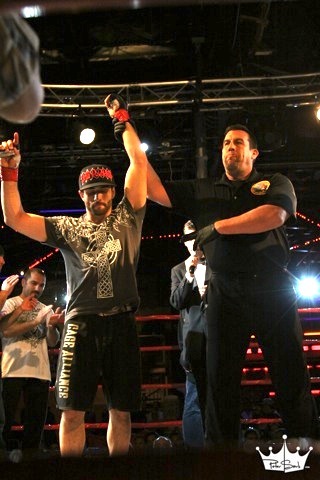 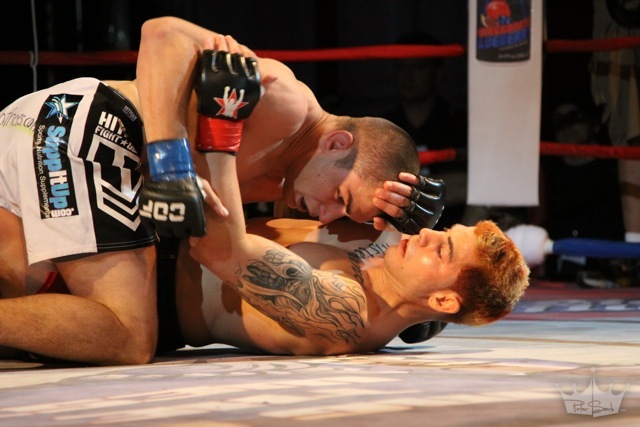 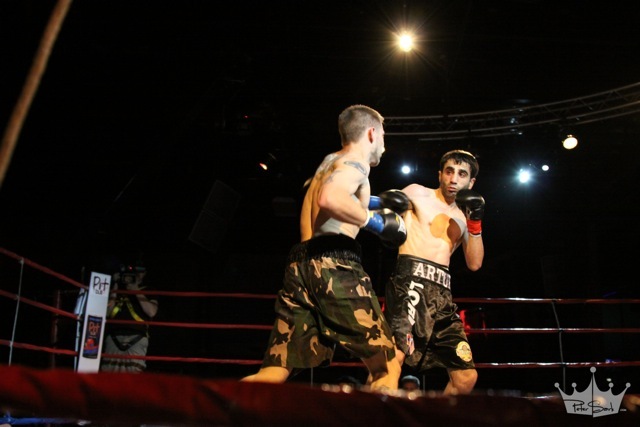 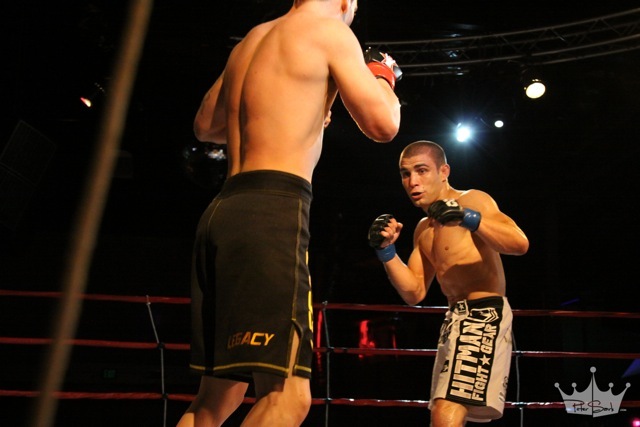 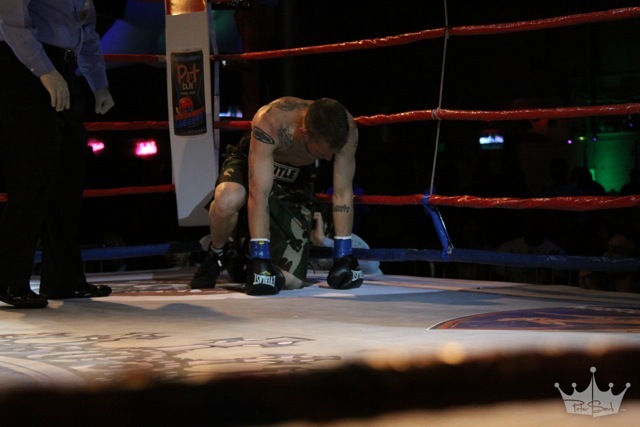 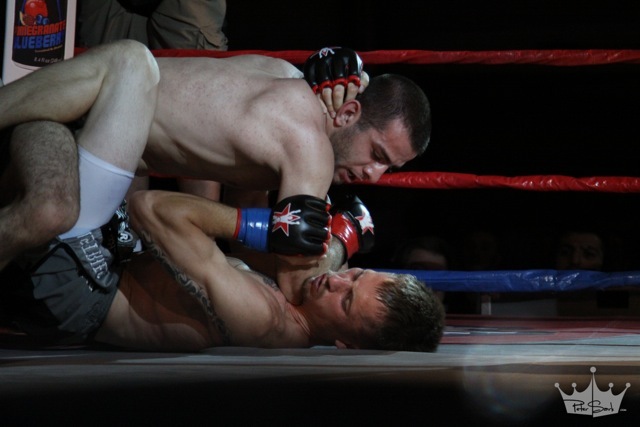 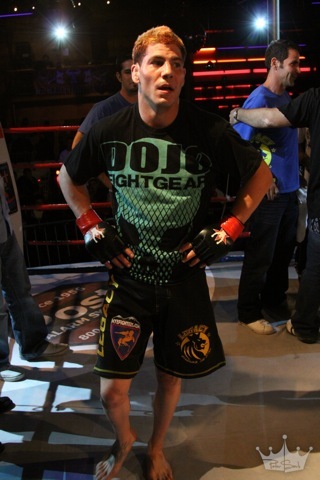 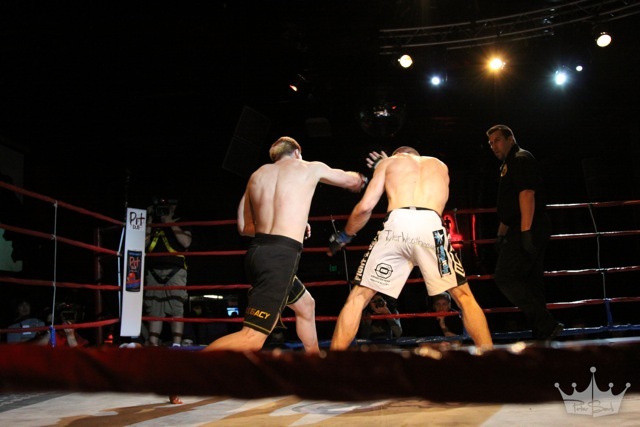 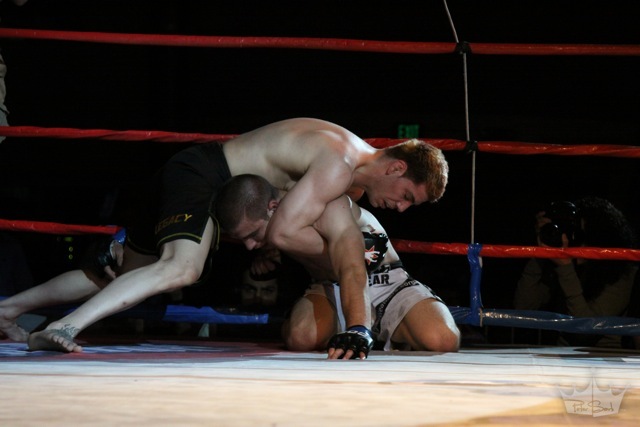 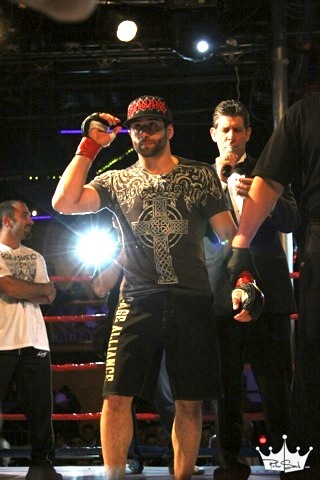 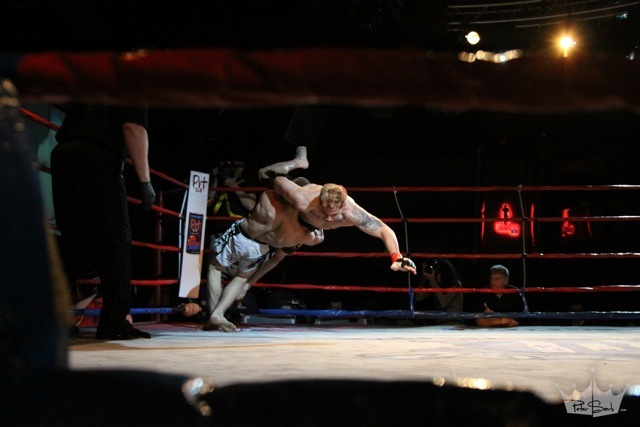 Finally, in the night’s co-main event, Papazian (8-5-1) earned a unanimous decision against Jared Weathers (6-5). 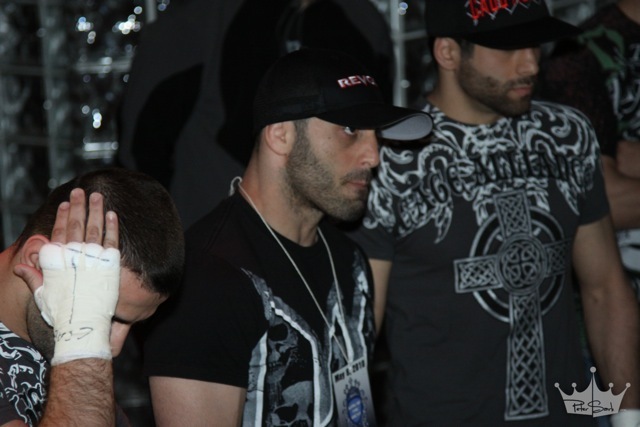 Weathers repeatedly took Papazian down in the first round of their bantamweight bout, though he did little if any damage on the ground. 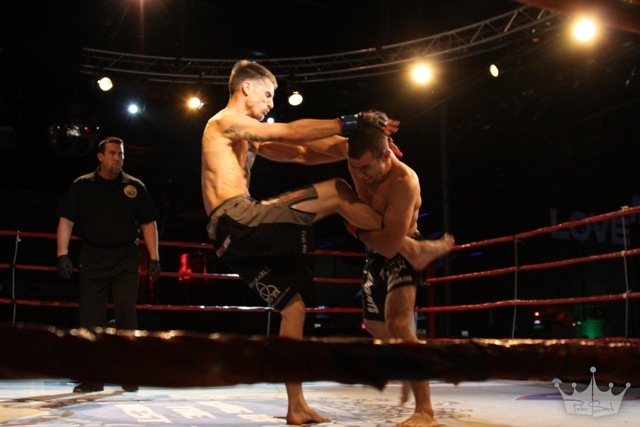 In the second, Papazian’s takedown defense improved and, though Weathers did bring him down, Papazian did far more damage with strikes and secured a takedown of his own in the final seconds. 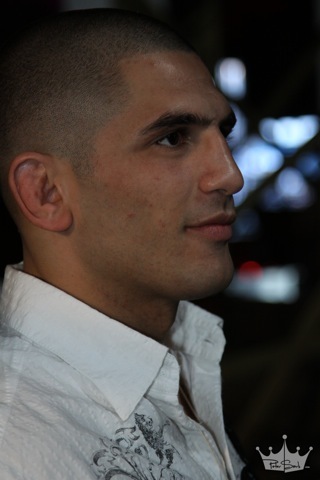 In the final round, Papazian landed a straight right that knocked down Weathers and also got another takedown. 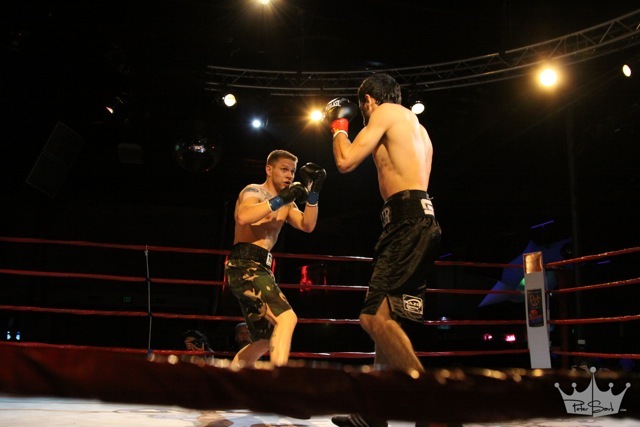 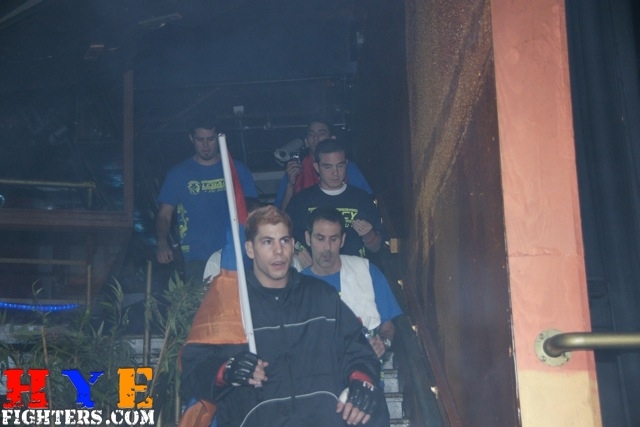 “I was getting frustrated in the first round, [I knew I had to] change things up,” said Papazian, who trains at Main Event and also at Glendale resident Alberto Crane’s Legacy Mixed Martial Arts in Encino. 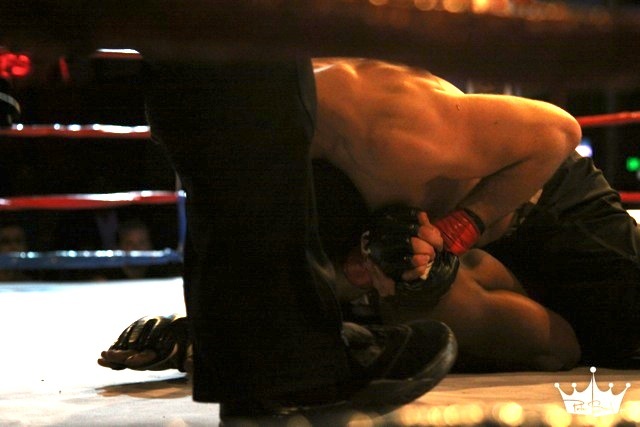 “It didn’t matter that he wasn’t doing anything on the ground, to the judges it looks like he’s winning.